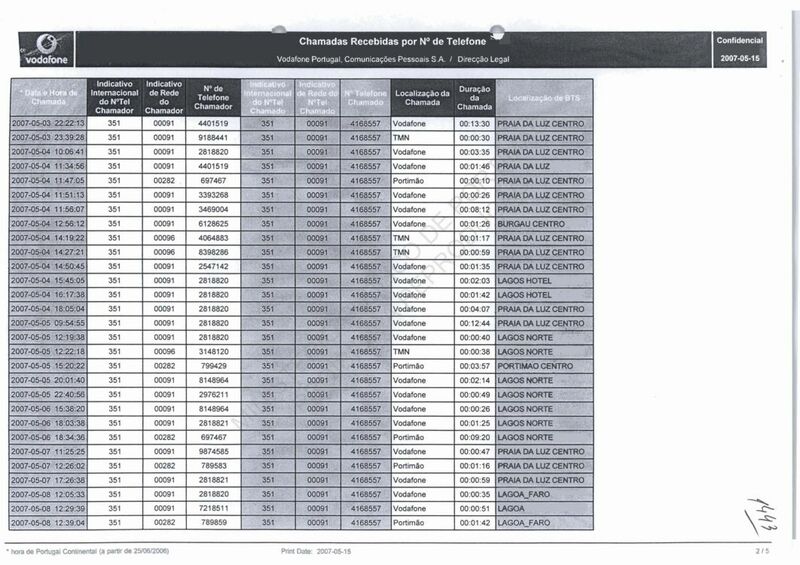 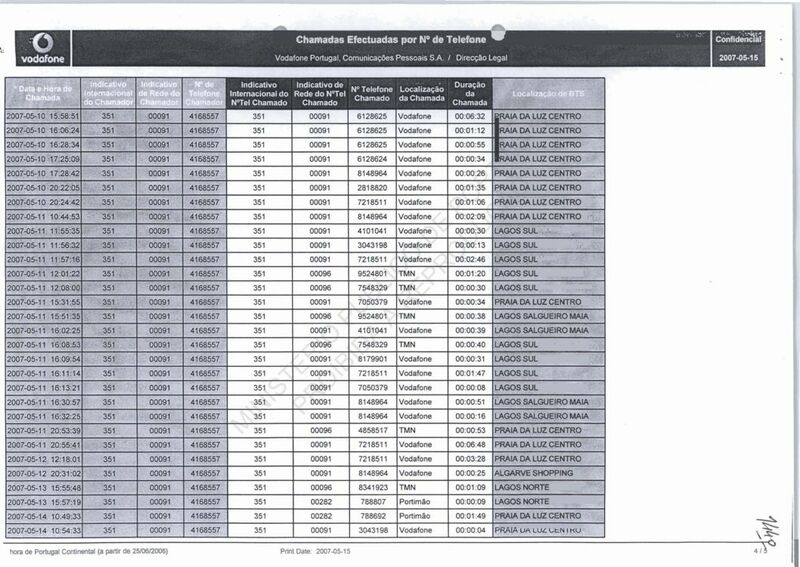 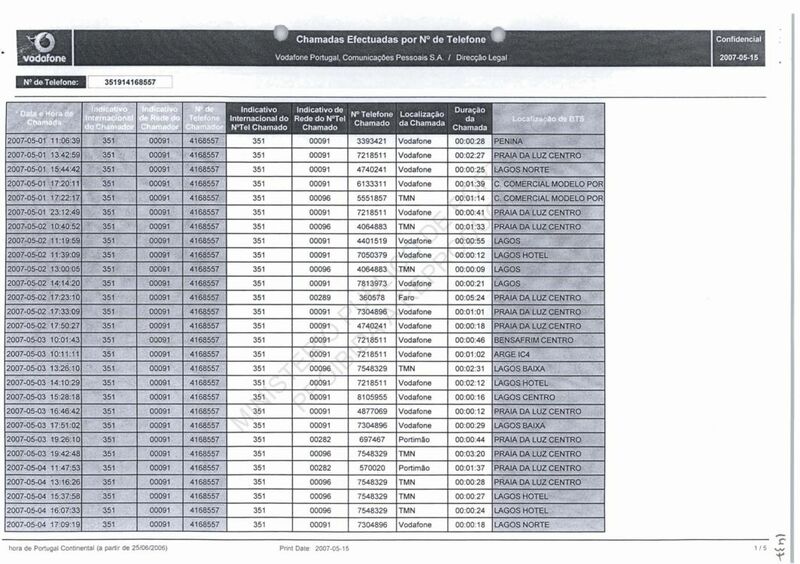 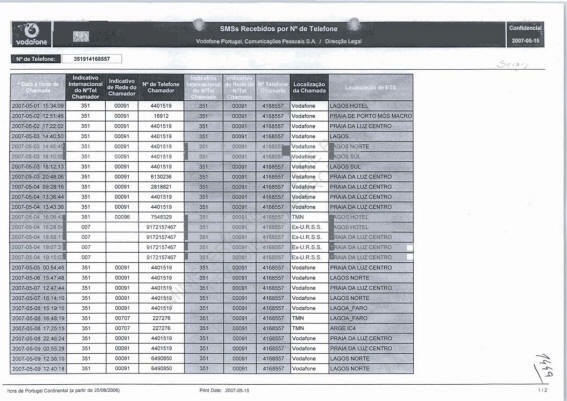 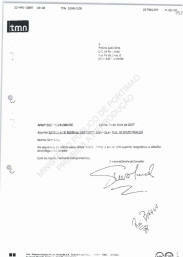 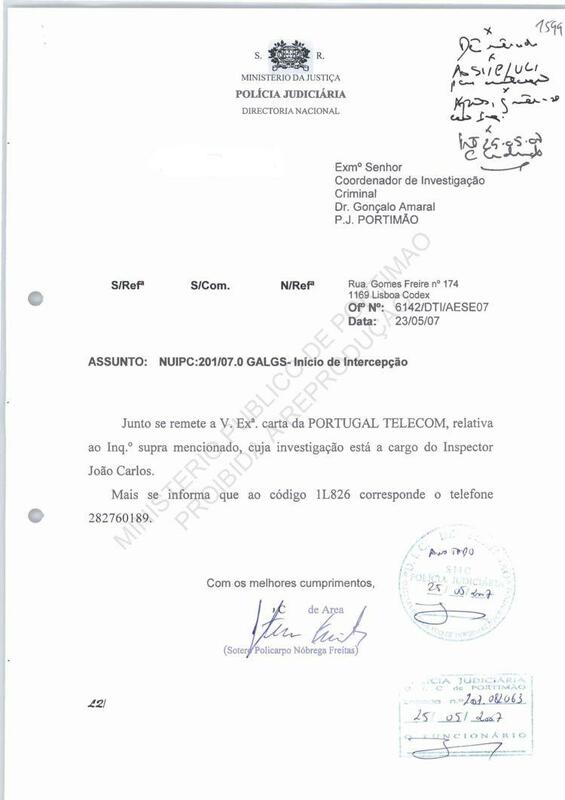 In relation to the letter in reference we are sending a list of calls in electronic format invoiced by the PT network and received during the period 01-05-2007 to 15-05-2007 of the interceptions referring to Process 201/07. 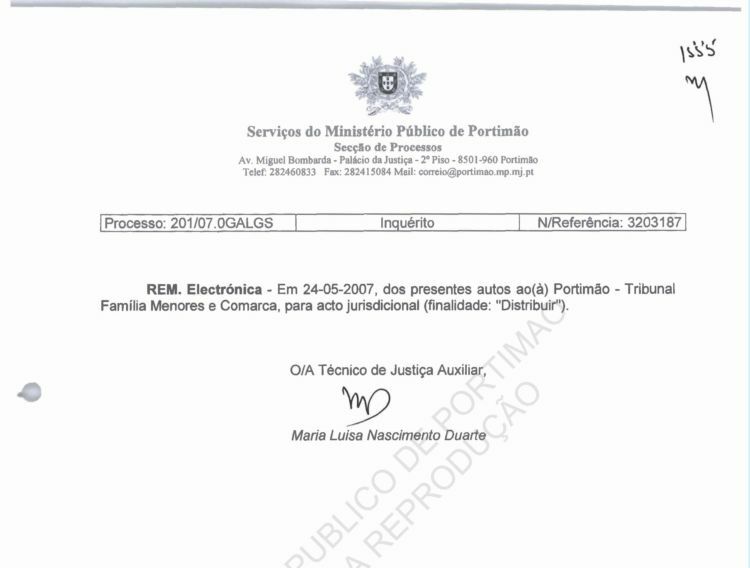 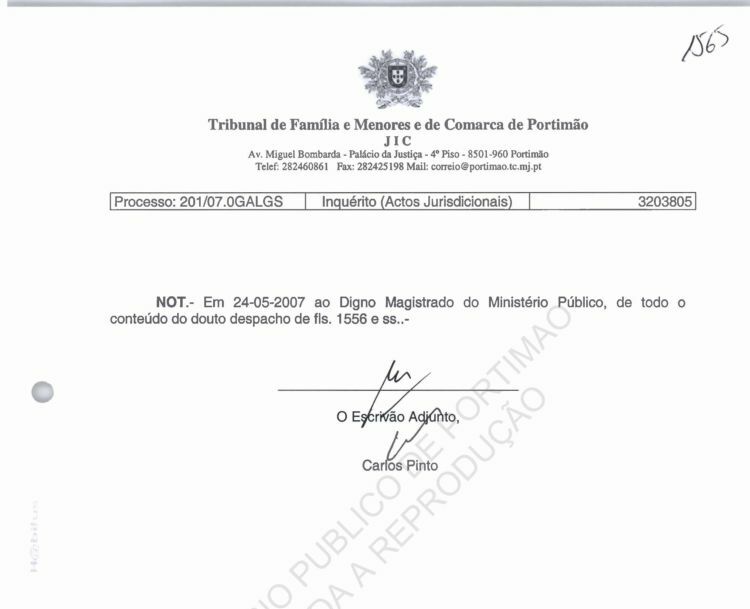 Galgs of 15-05-2007 from the Portimao Family Court. 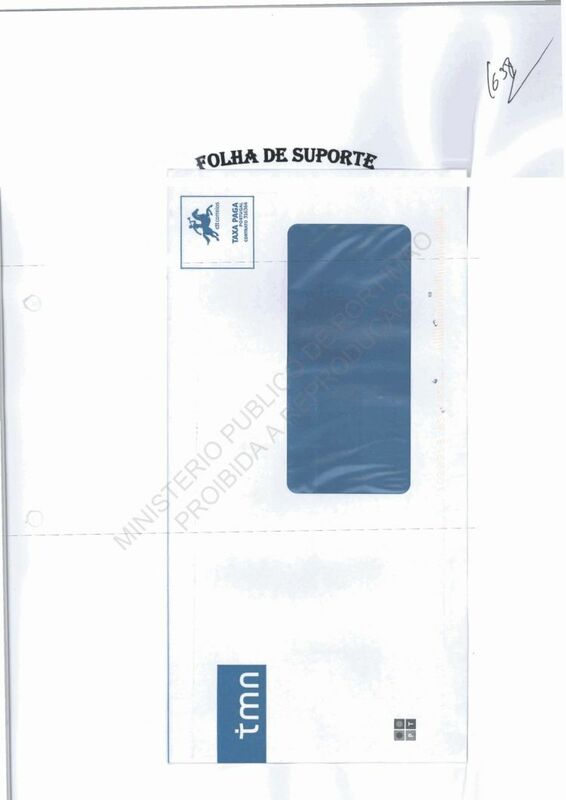 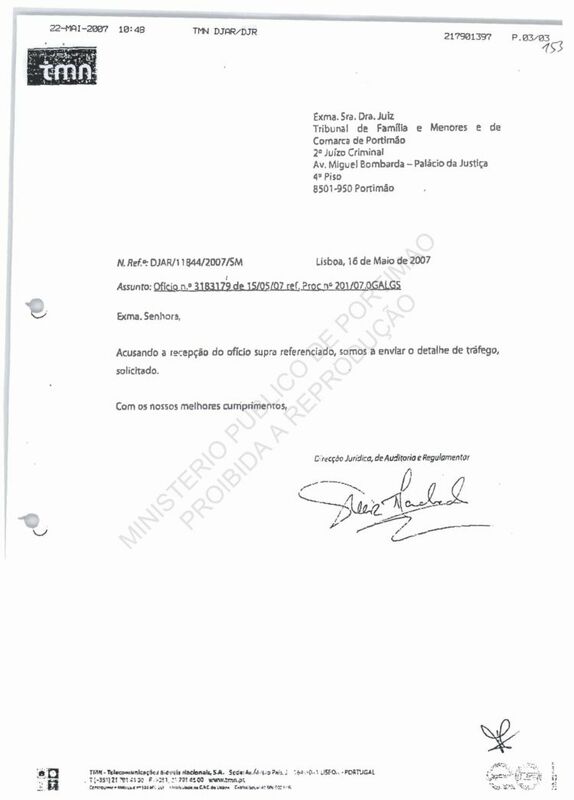 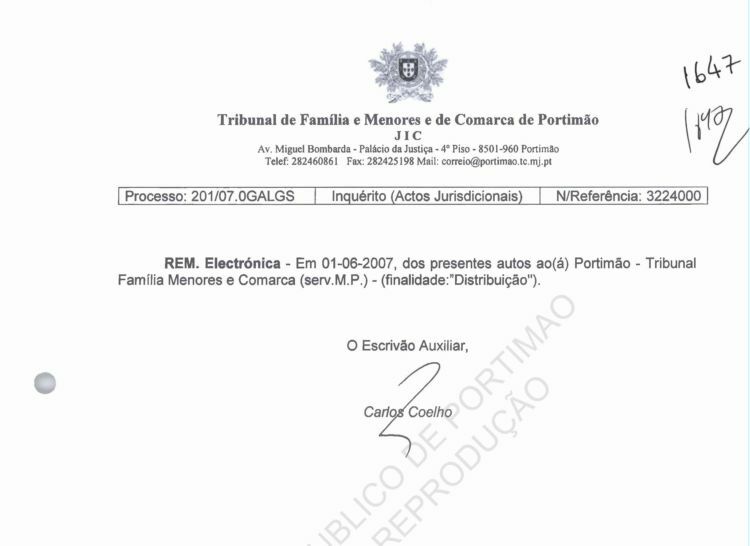 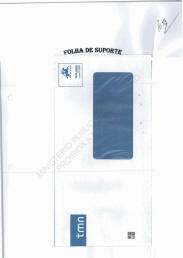 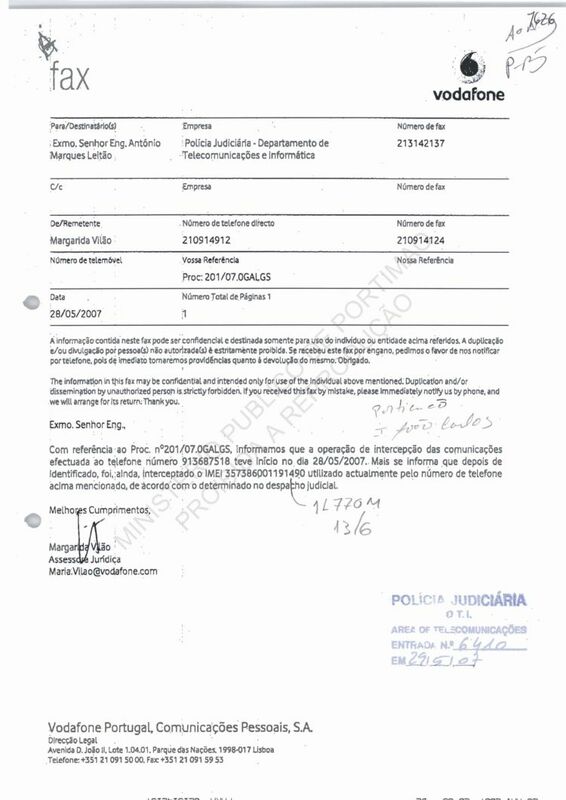 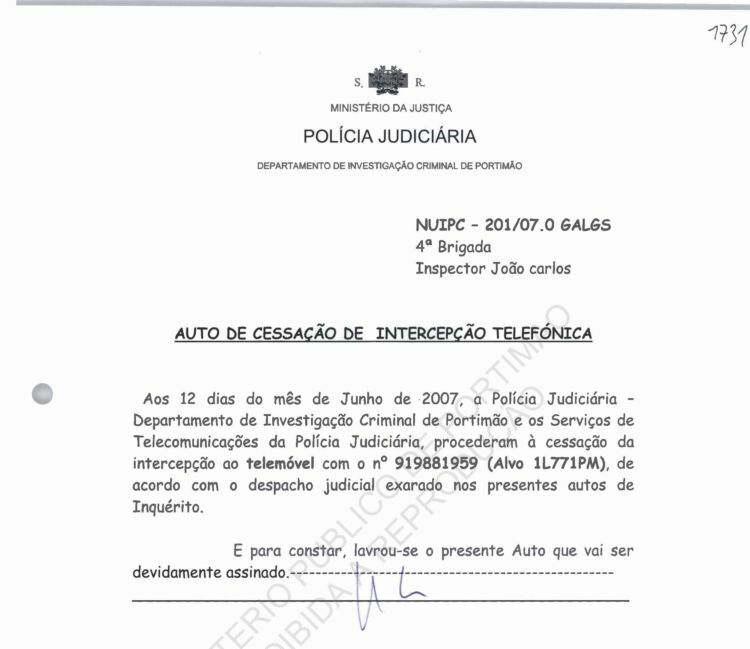 With reference to the letter n| R1 from the Portimao Family Court dated 18-05-2007, we are sending a diskette with the calls made and received by the telephone numbers 911948359, 914168557, 918224078 and 919782964 as requested by the instruction judge. 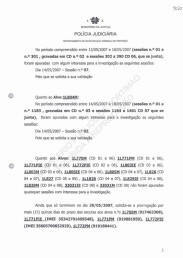 We inform you that the files are sent in duplicate, as one of the copies is password protected in order to guarantee the security of the information made available. 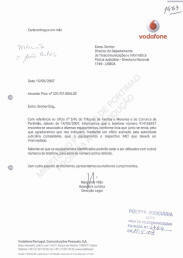 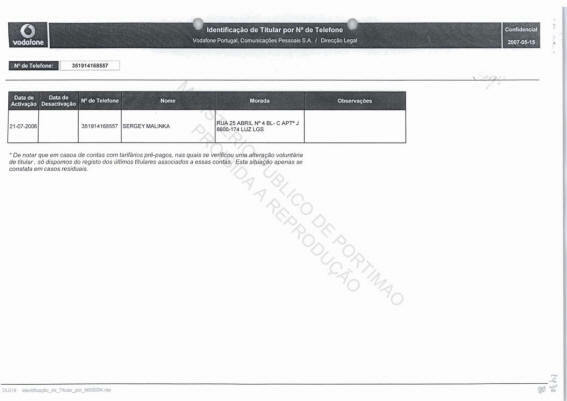 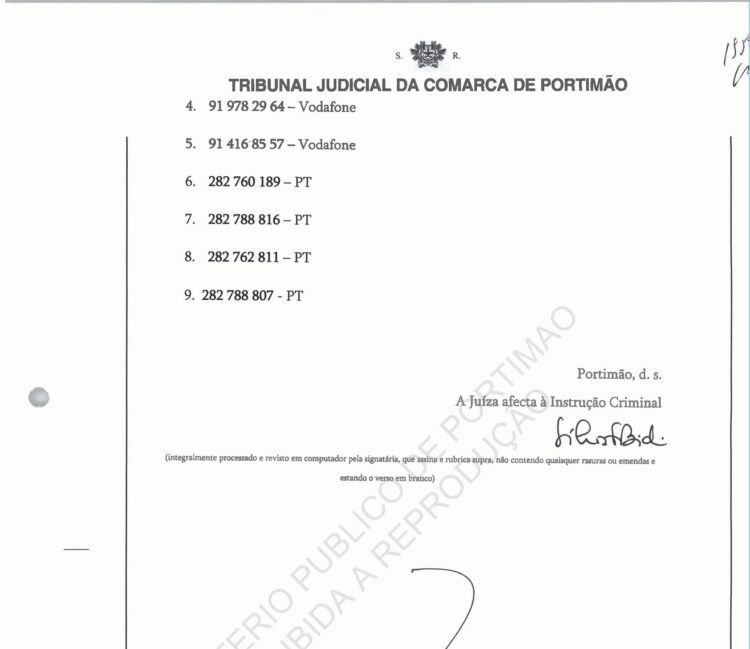 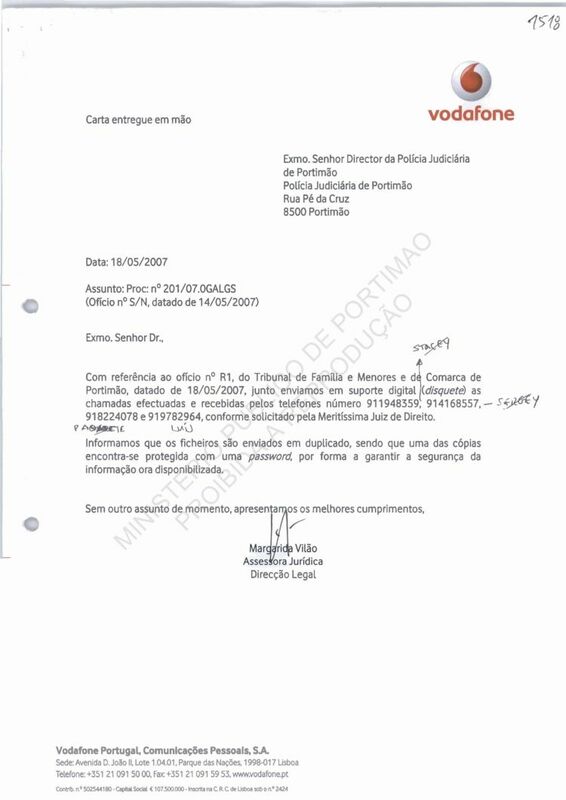 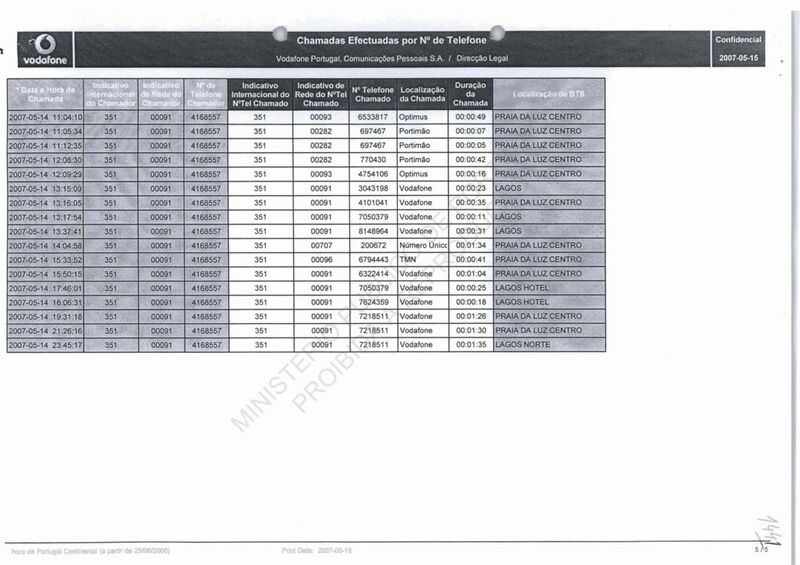 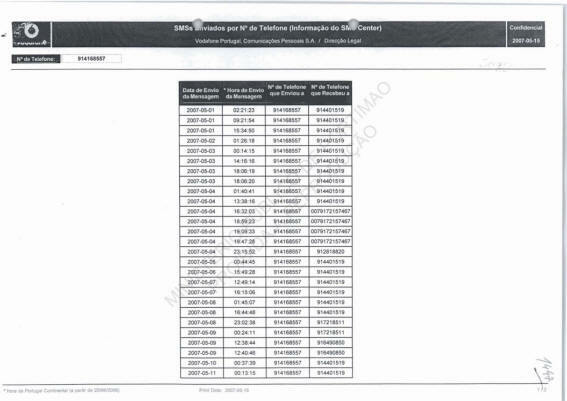 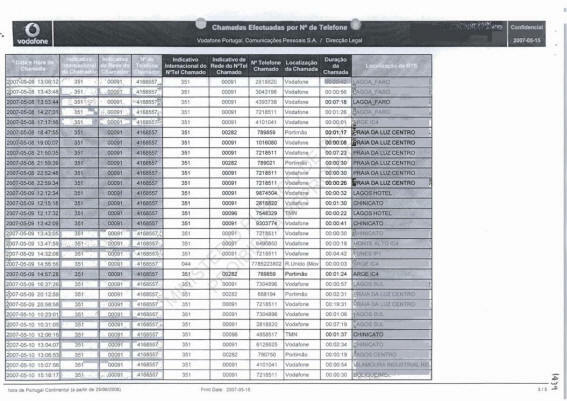 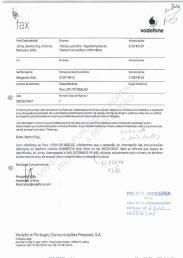 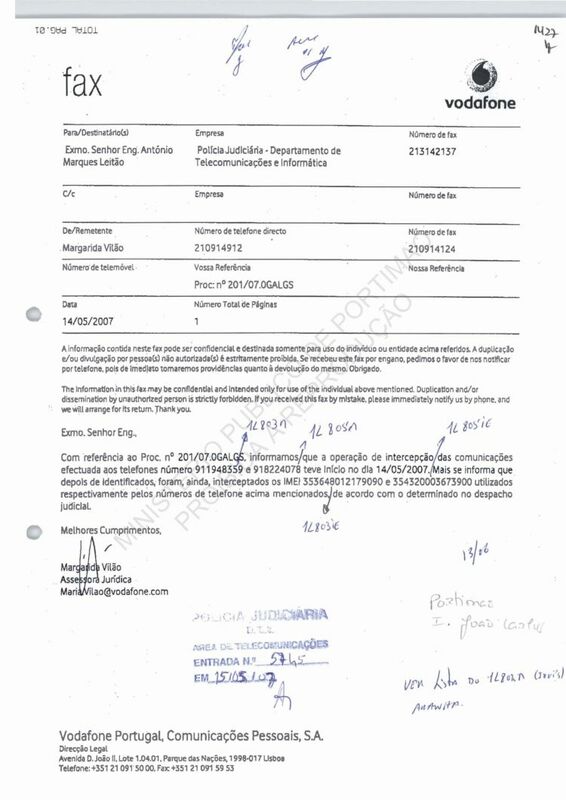 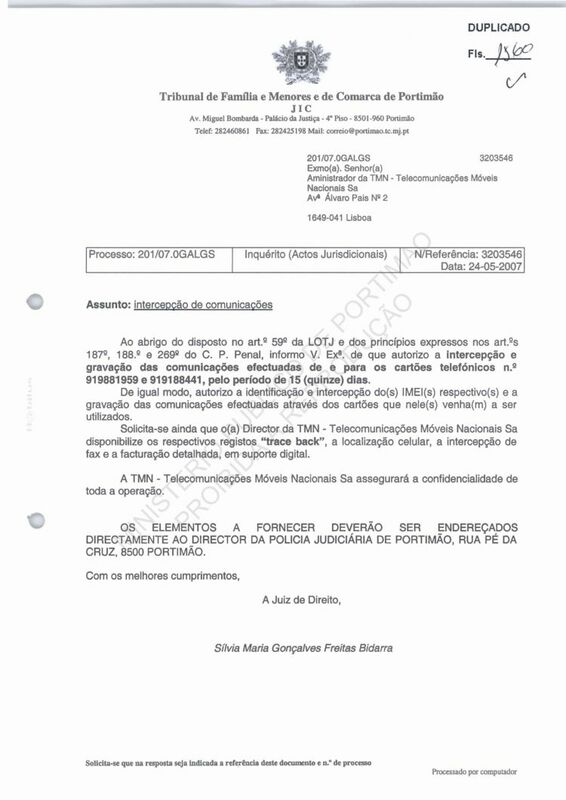 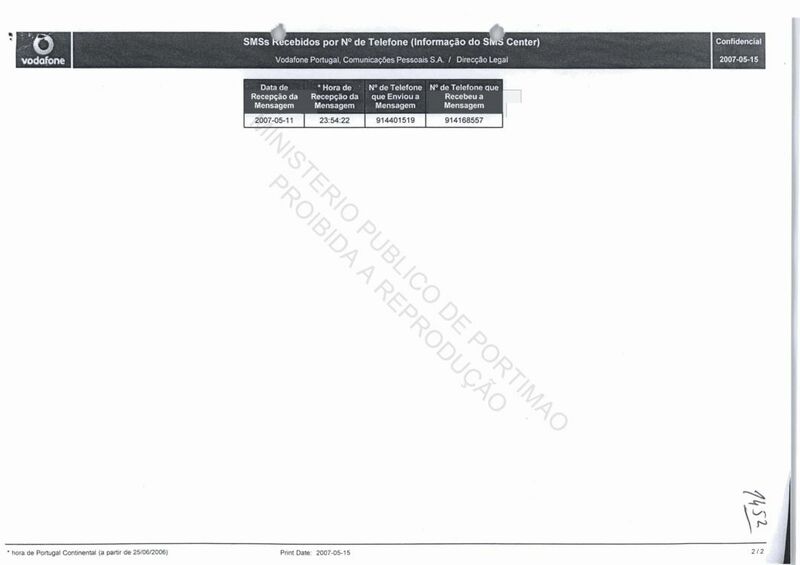 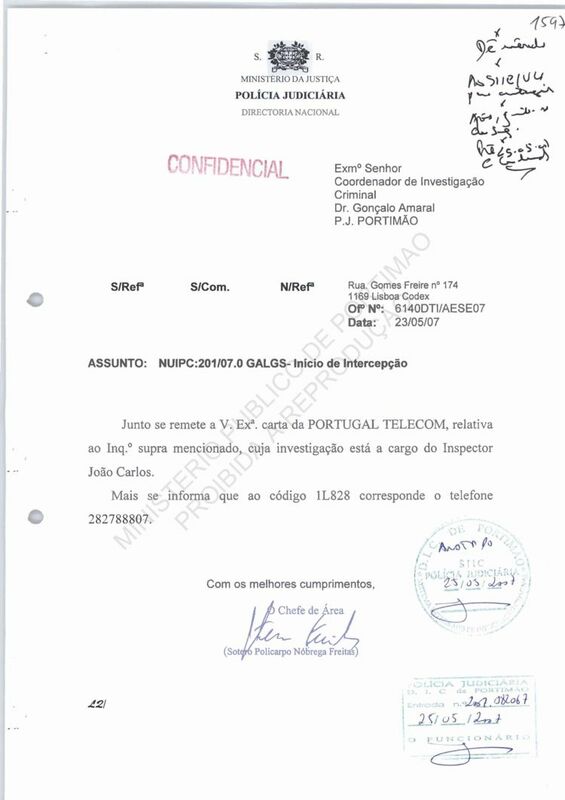 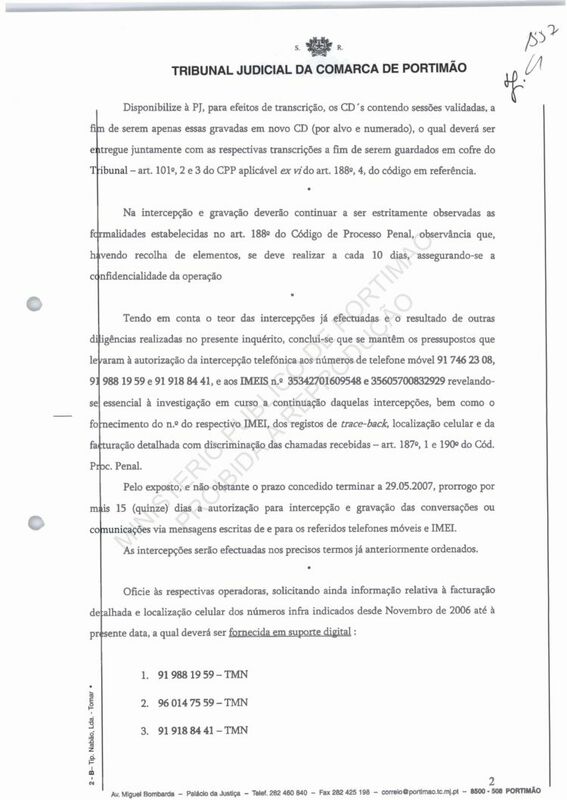 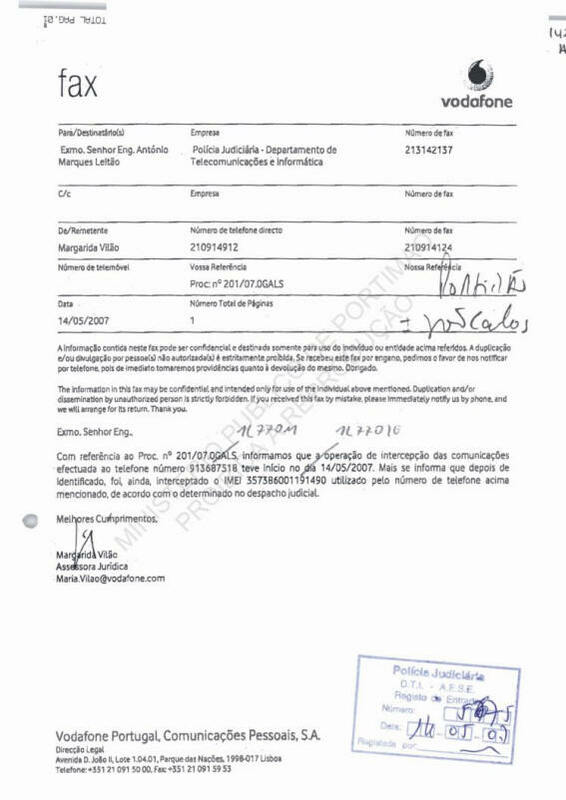 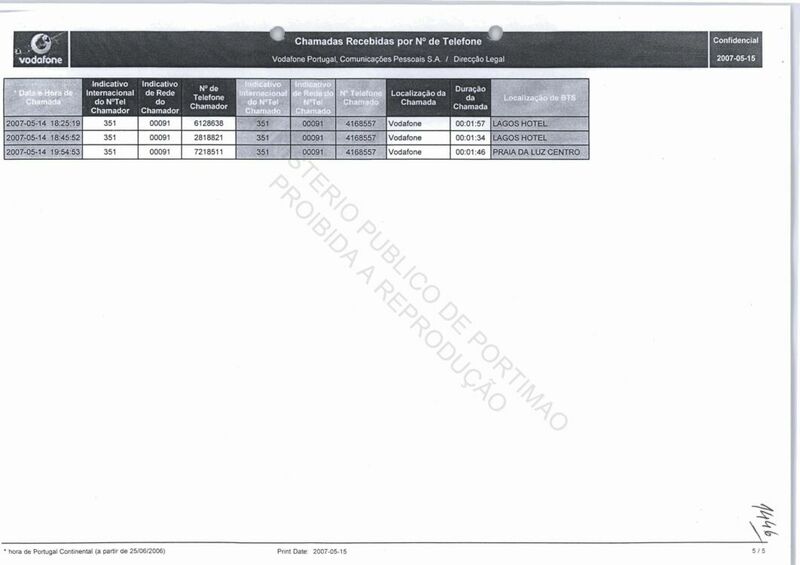 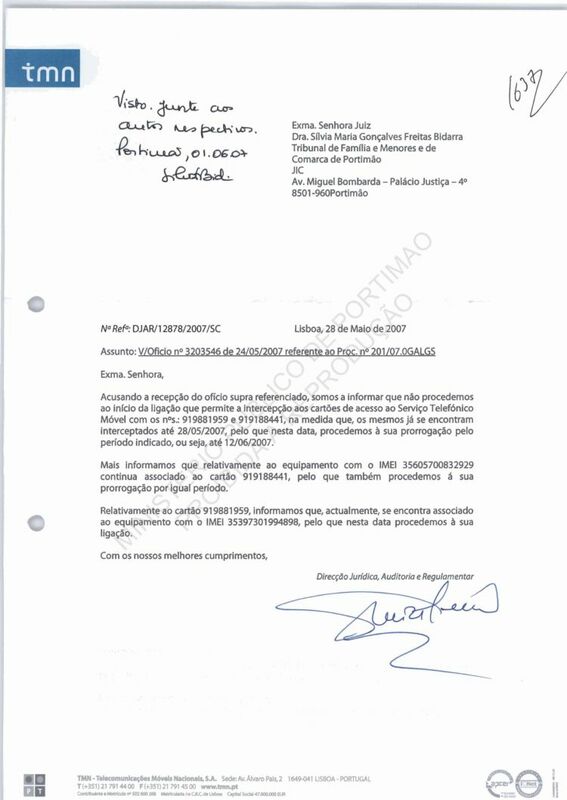 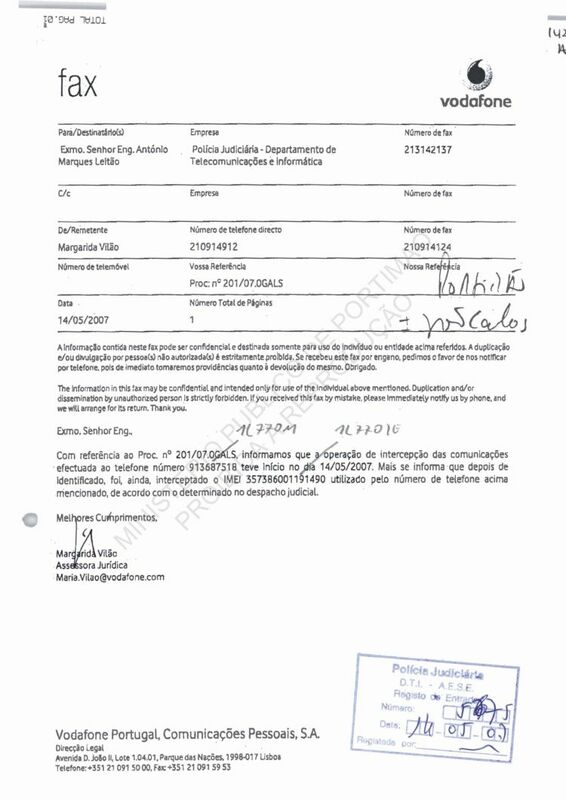 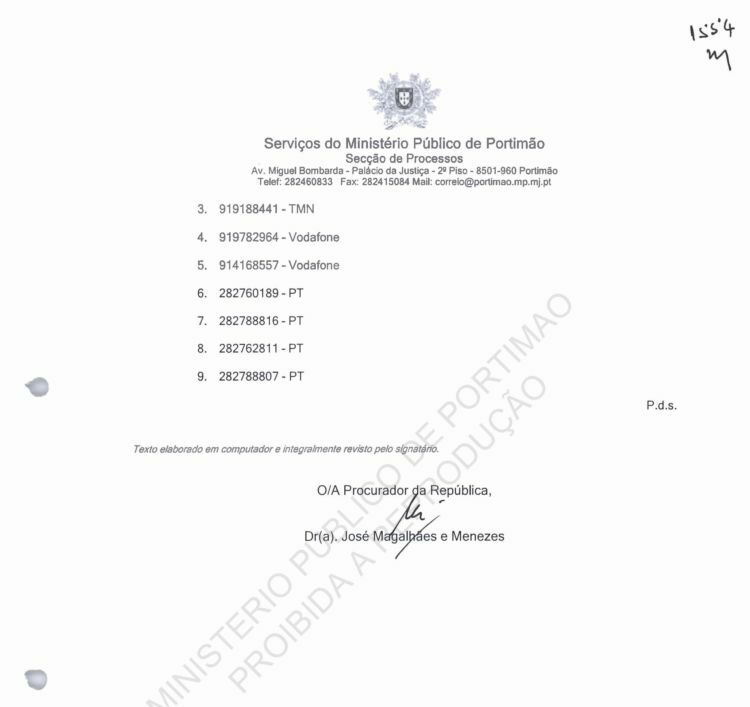 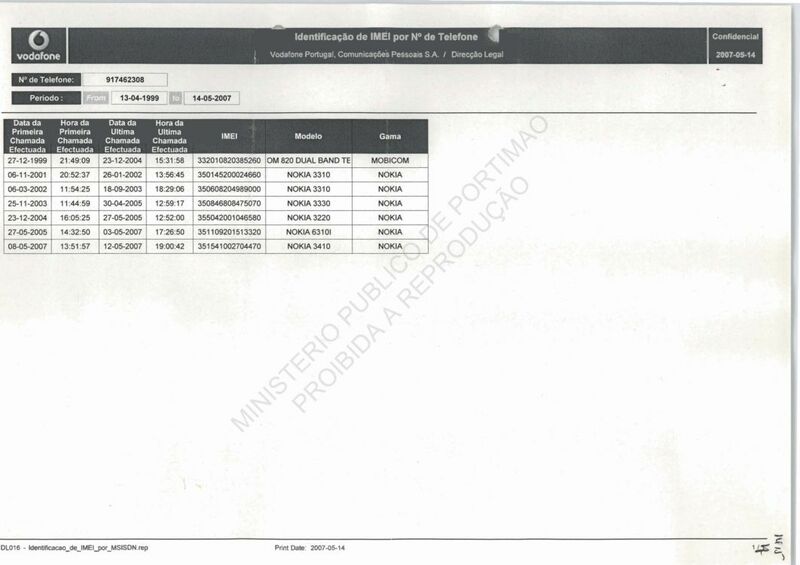 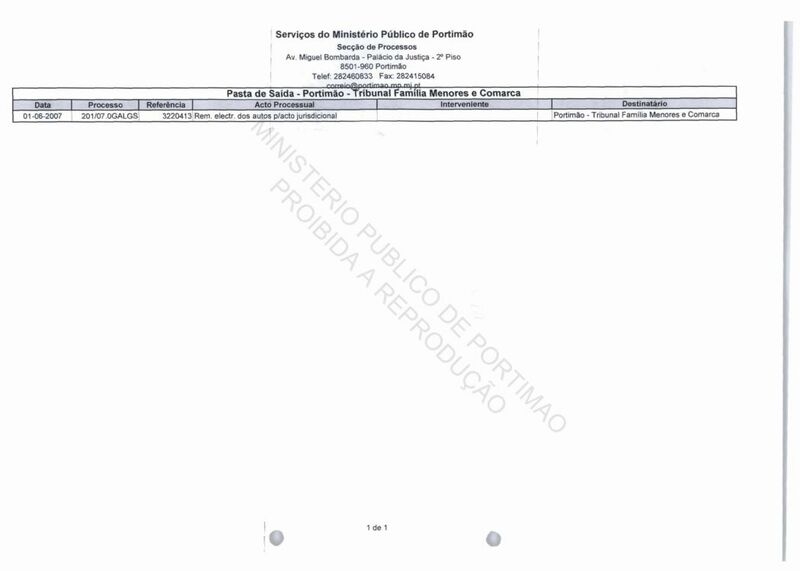 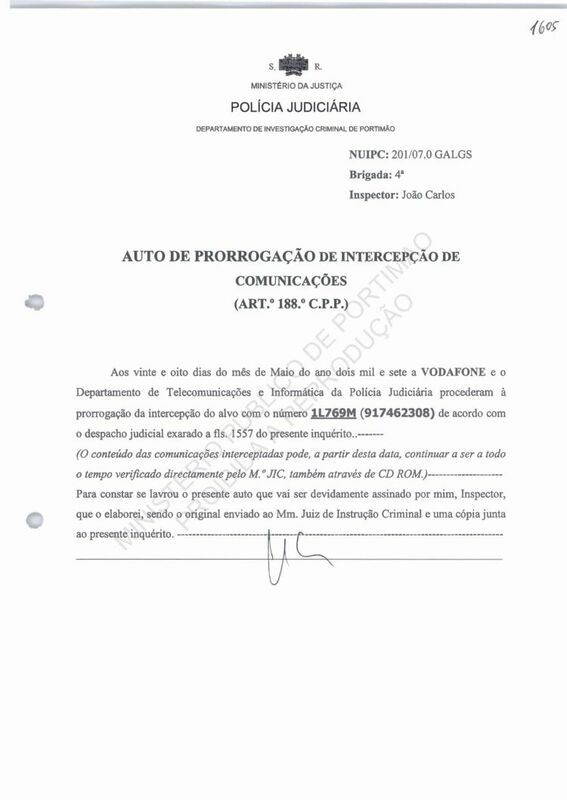 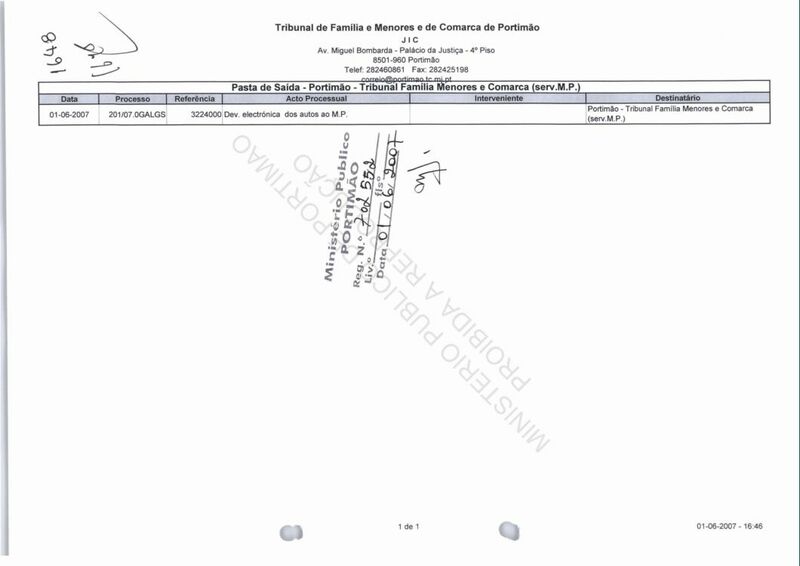 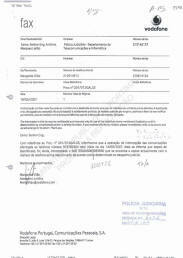 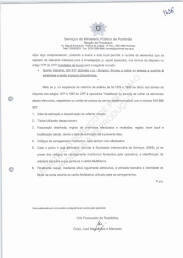 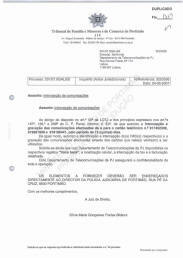 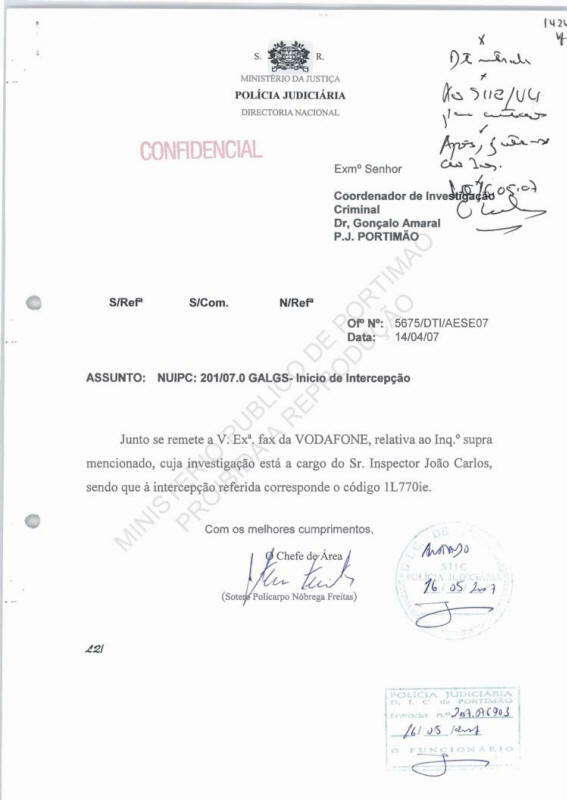 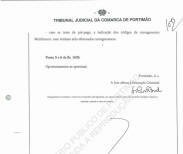 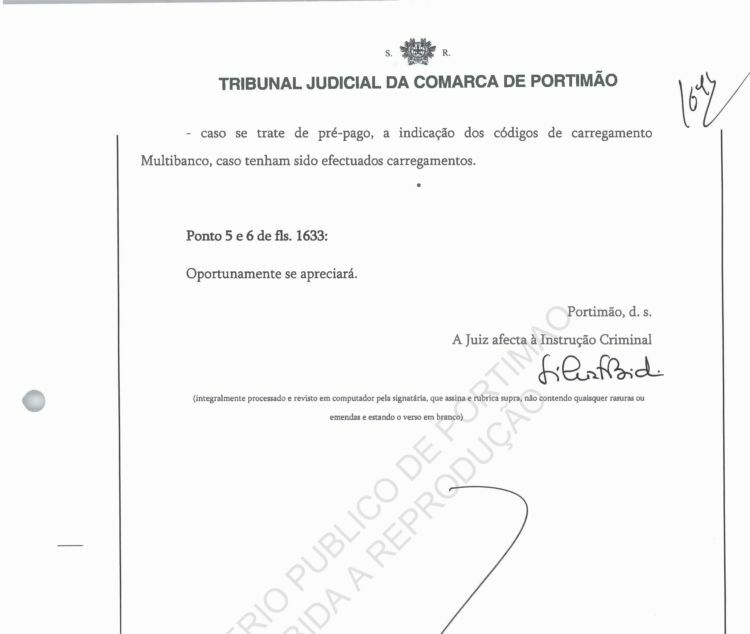 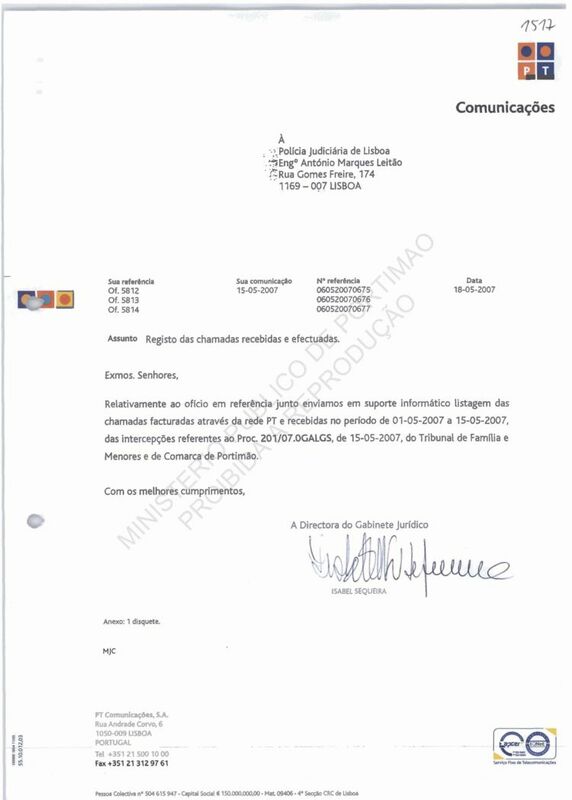 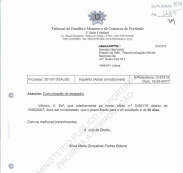 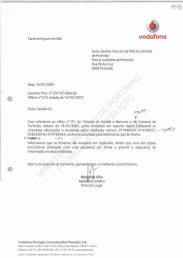 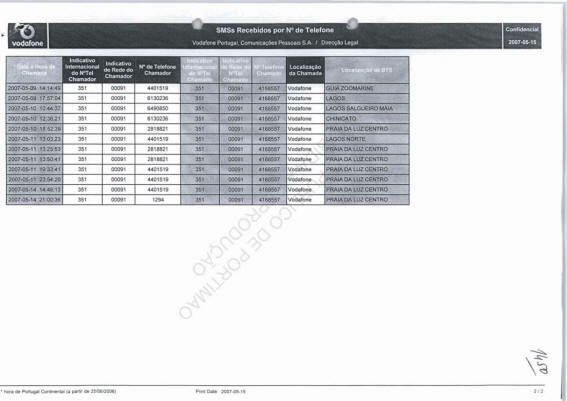 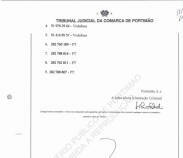 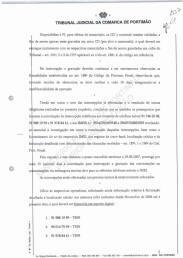 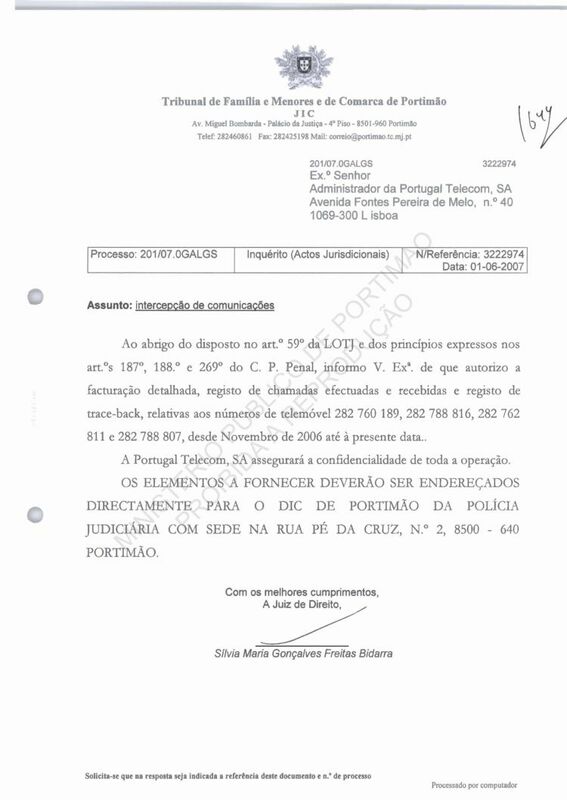 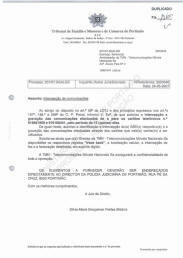 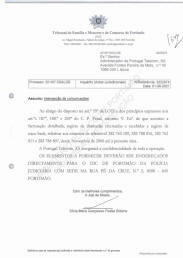 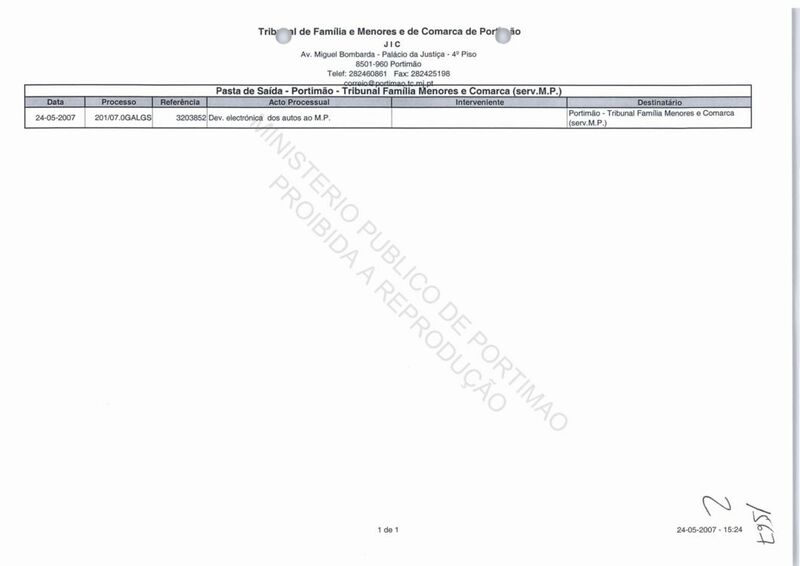 On the 18th May 2007, the PJ, Portimao DIC and the Telecommunications Services of the PJ proceeded to intercept the mobile phone number 919782964 by means of the operator Portugal Telecom in accordance with the legal dispatch included in the present investigation files. The Paragon system was activated, located in the installations of this police force and given the code Alvo 33031M registering the conversations in digital format, which are identified by number and code. 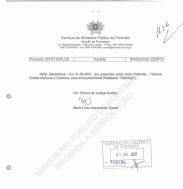 The present report was drawn up and will be signed. 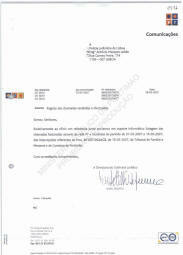 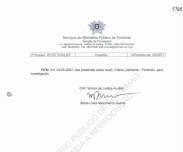 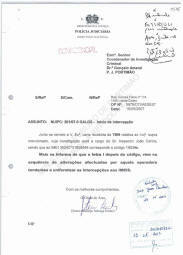 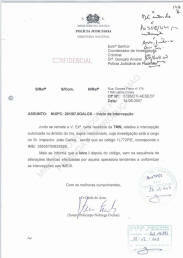 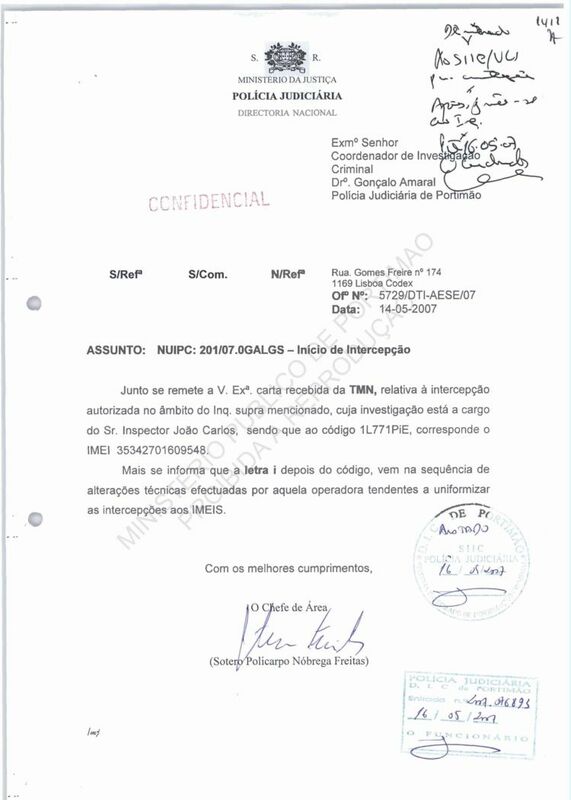 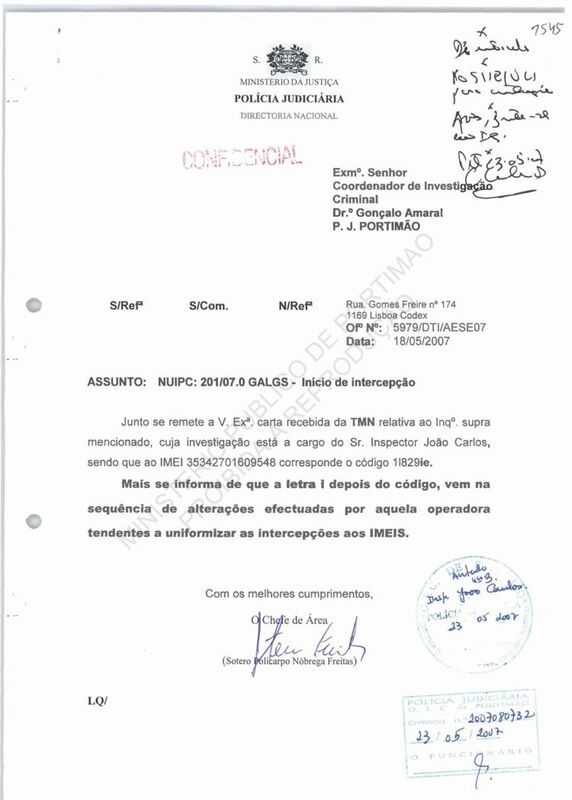 I enclose a letter received from TMN relating to the interception authorised in the scope of the case mentioned above, whose investigation is under the responsibility of Inspector Joao Carlos, the code 1L829M corresponding to the number 960147559. 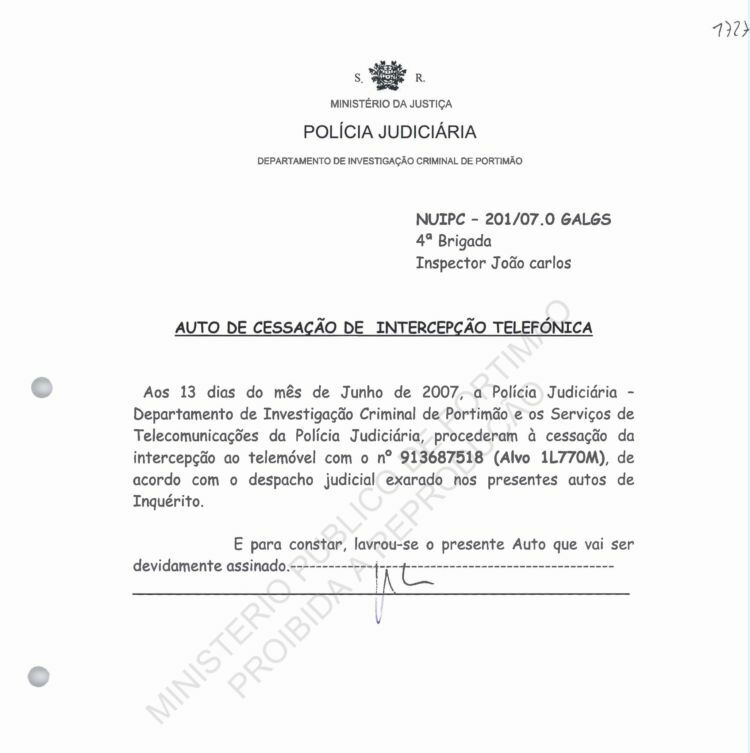 I inform you that on 15-05-2007 at 20.50 in compliance with your communication ref 1L829m the respective dialback was initiated. 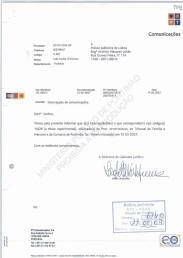 This dialback corresponds to our reference 2155/2007. 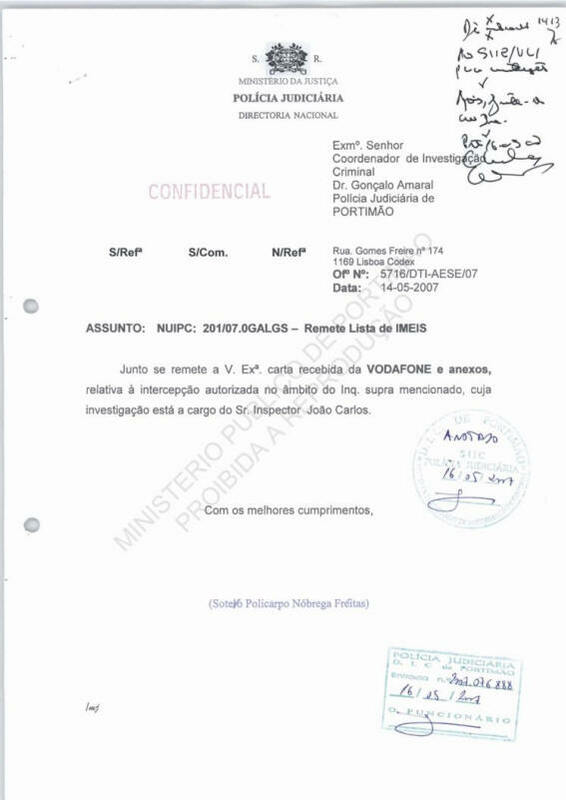 As it is necessary to the investigation mentioned above, I request that you inform this police force urgently which is the mobile number associated with UZO SIM card nº 8951 06000 01704 88314000. 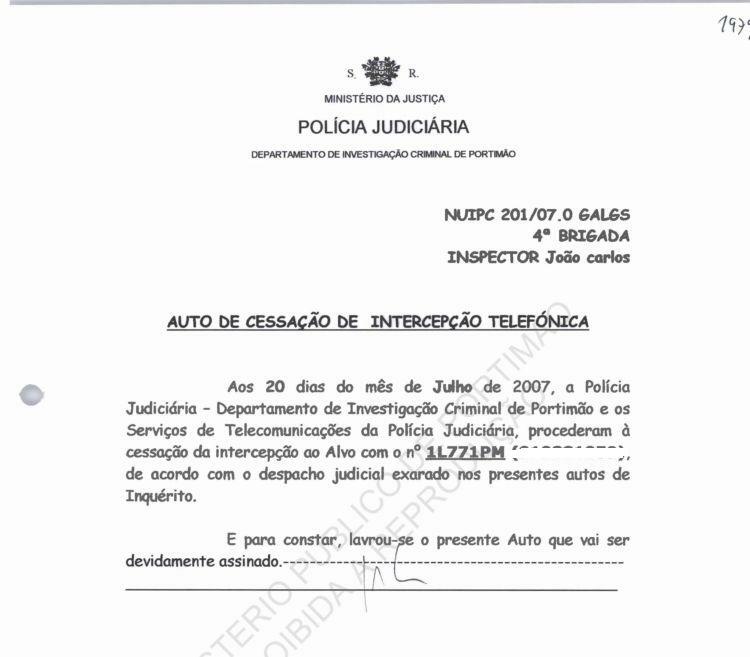 Given its urgency, this same request has already been made to your services via Fax on 21st May 2007. 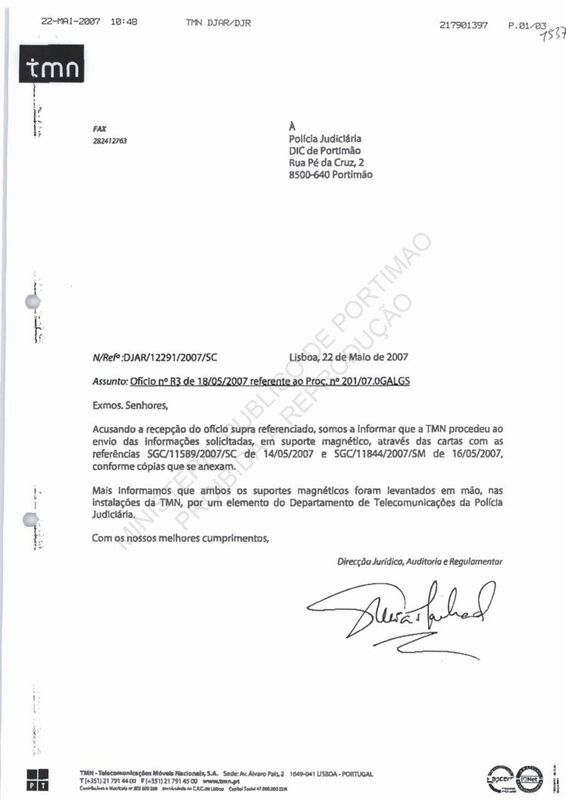 Confirming receipt of the letter mentioned above, we inform you that TMN proceeded to send the information requested, in magnetic format, by means of the letters with reference SGC/11589/2007/SC on 14-05-2007 and SGC/11844/2007/SM on 16-05-2007, according to the copies attached. 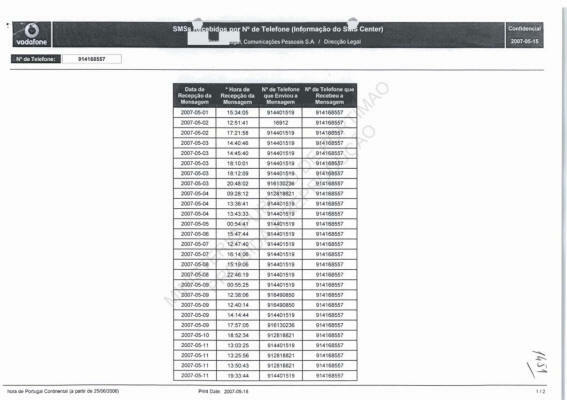 But we inform you that the magentic formats were collected in person from the TMN offices by an officer from the PJ Telecommunications Department. 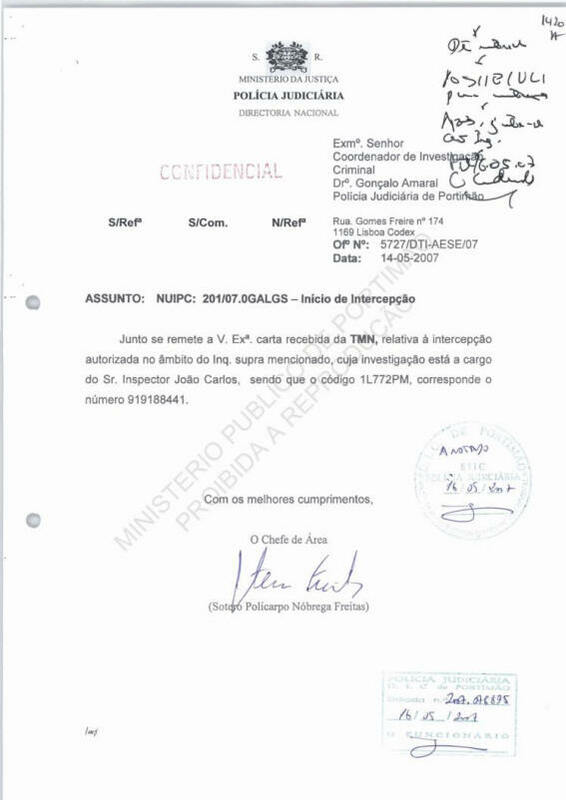 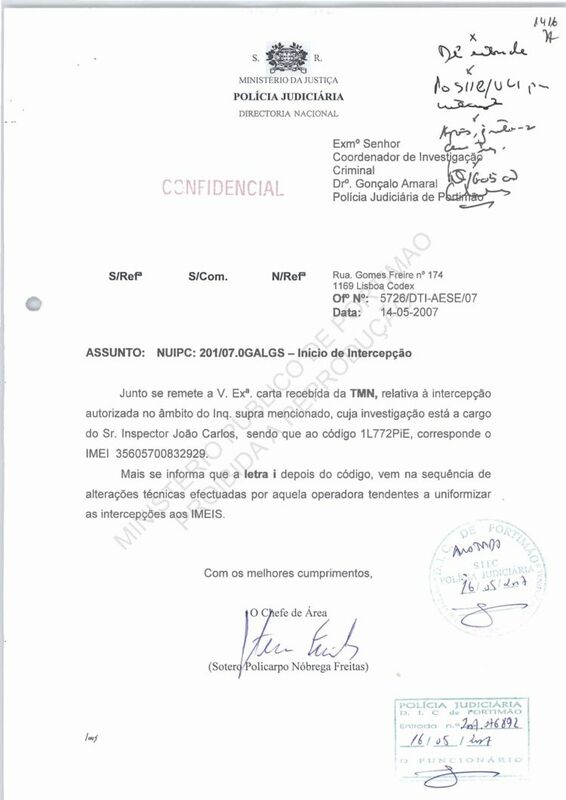 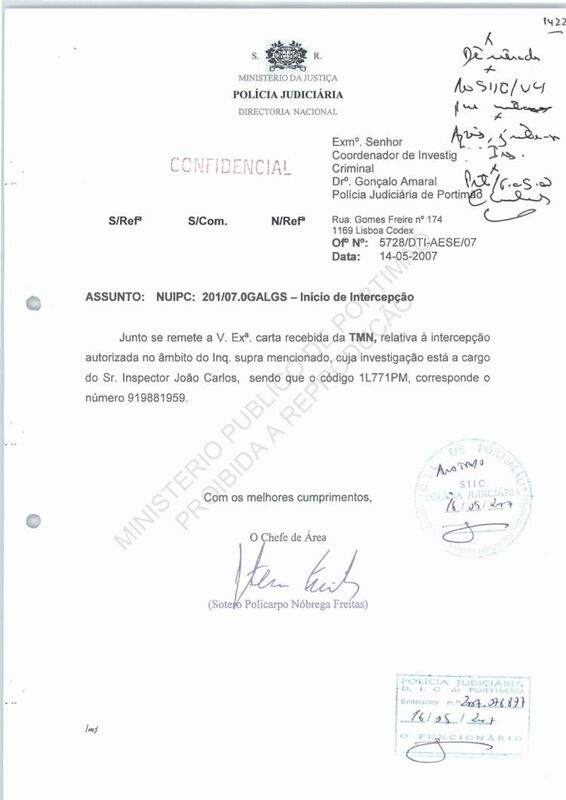 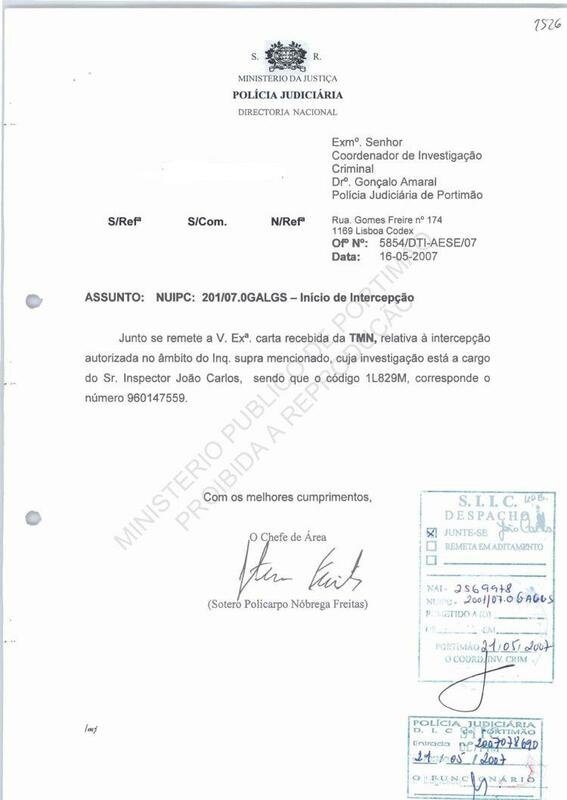 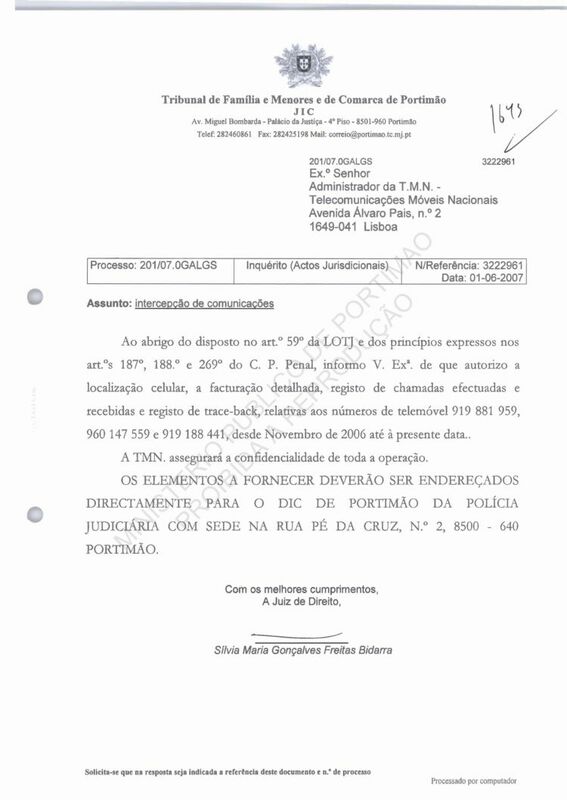 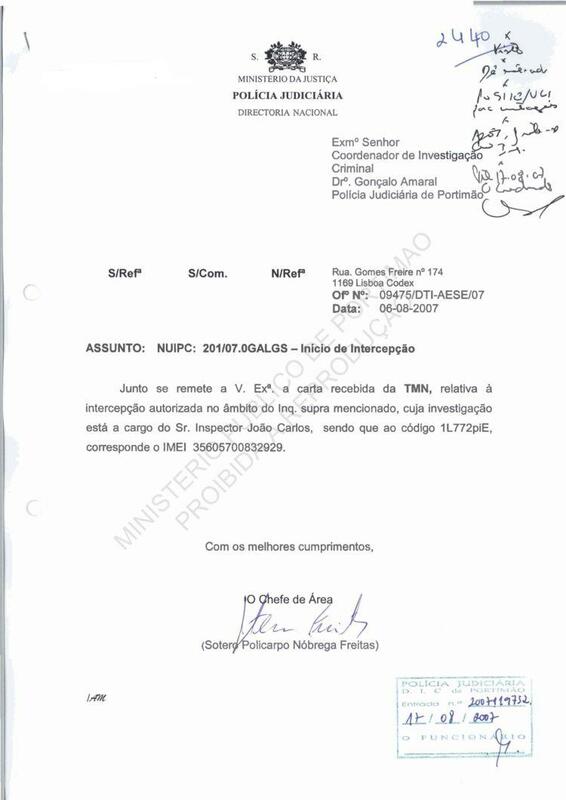 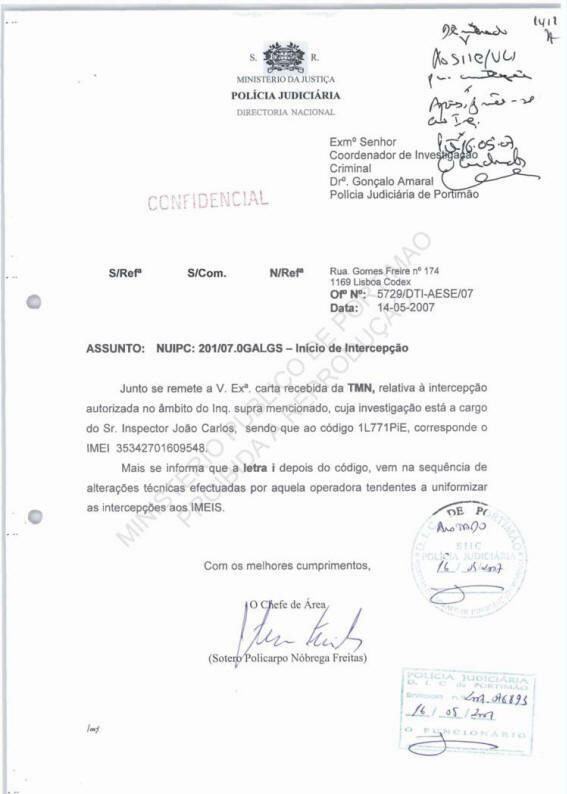 I enclose a letter received from TMN relating to the interception authorised within the scope of the inquiry mentioned above, the investigation of which is under the responsibility of Inspector Joao Carlos, the code 1L772piE corresponding to IMEI 35605700832929. 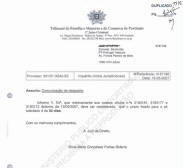 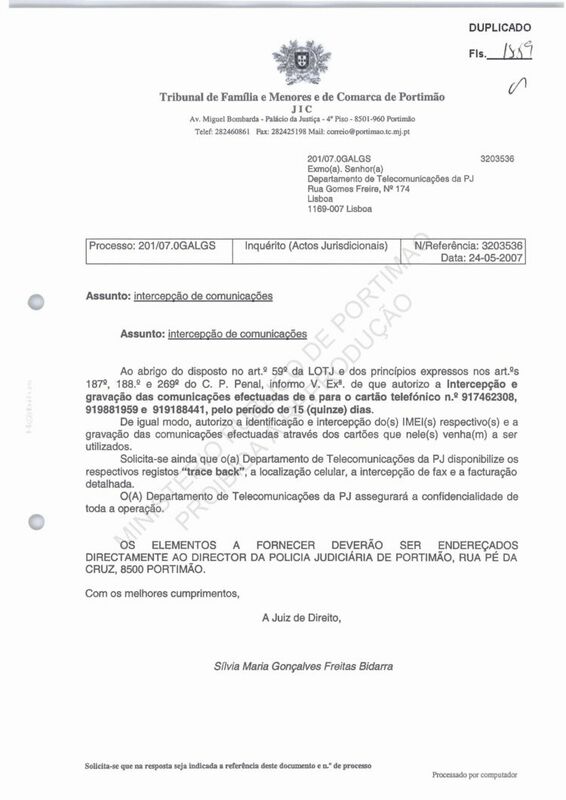 On 13th June 2007 the Policia Judiciaria – Portimao DIC and the PJ Telecommunications Services proceeded to cease the interception of the mobile number 913687518 (target 1L77OM) in accordance with the legal dispatch contained in the investigation process files. 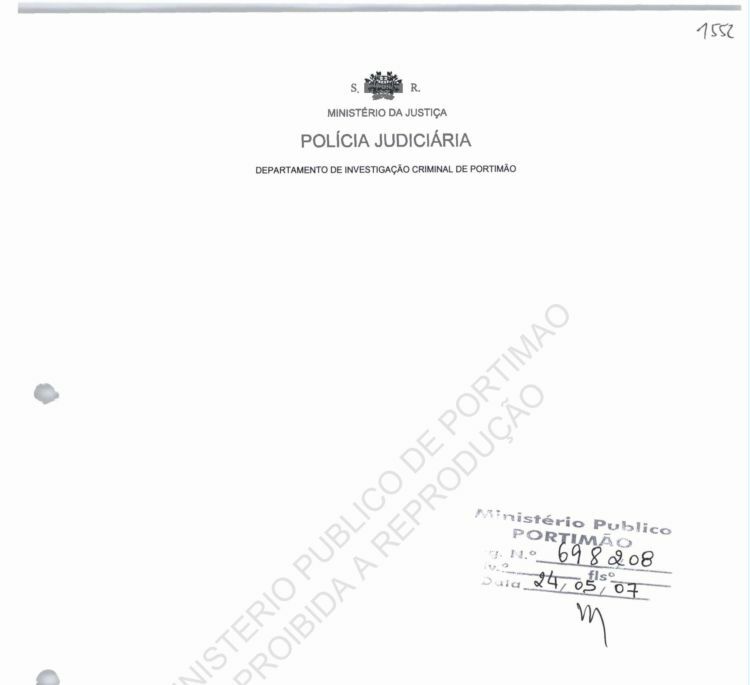 This report will duly be signed. 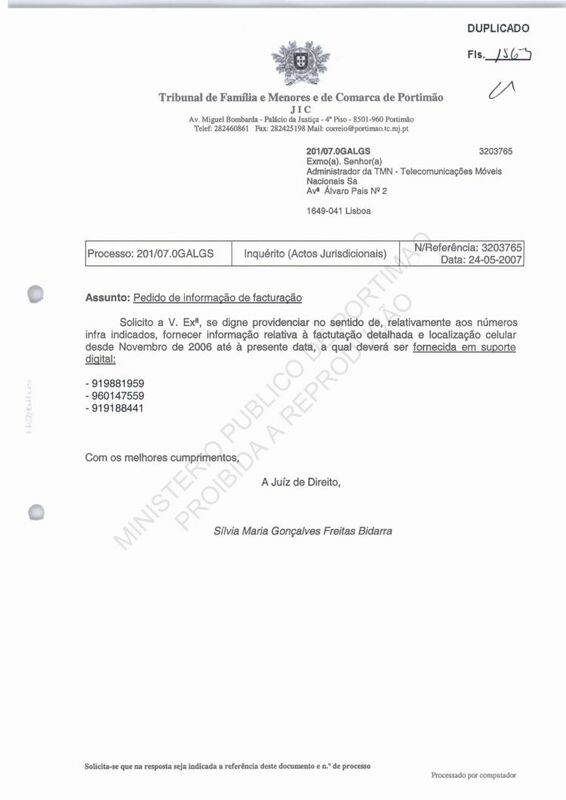 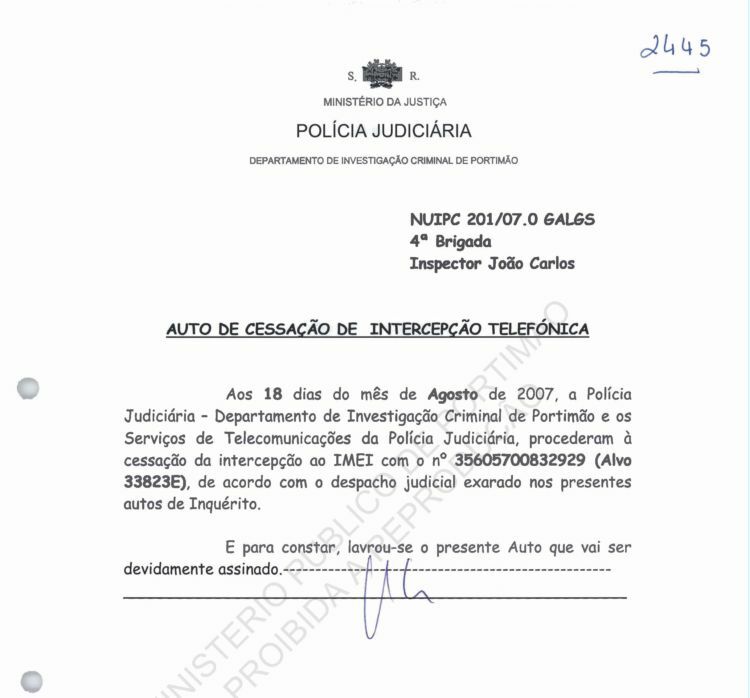 On 13th June 2007 the Policia Judiciaria – Portimao DIC and the PJ Telecommunications Services proceeded to cease the interception of the IMEI with number 357386001191490 (target 1L77OIE) in accordance with the legal dispatch contained in the investigation process files. 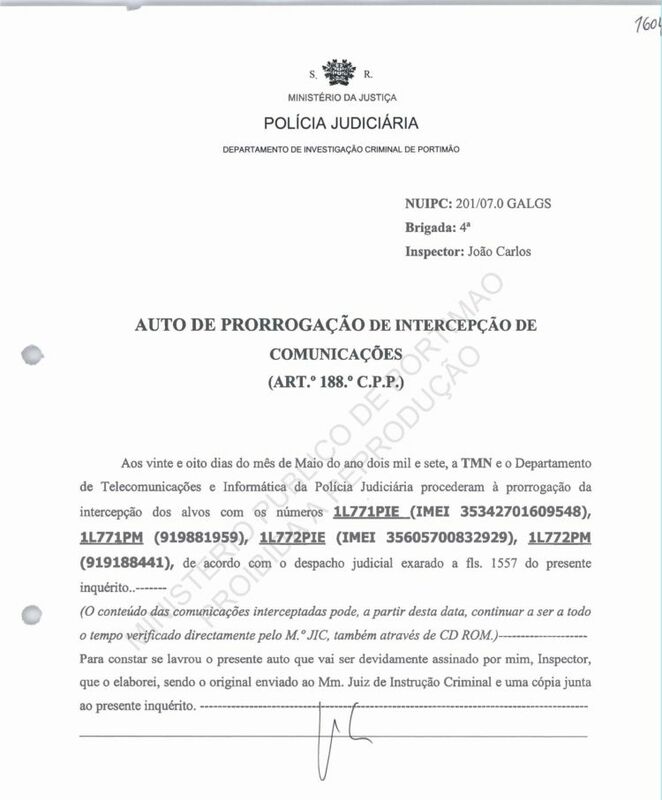 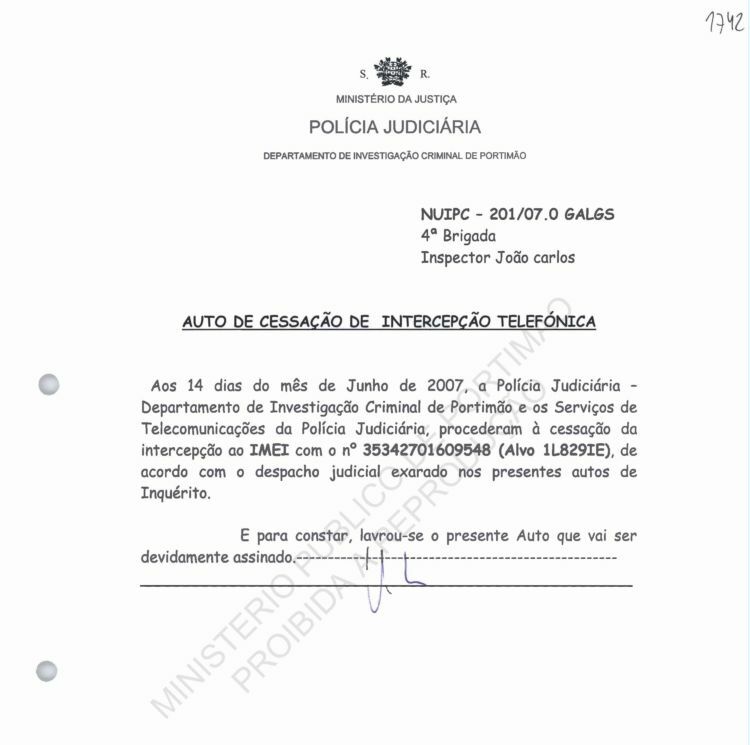 On 12th June 2007 the Policia Judiciaria – Portimao DIC and the PJ Telecommunications Services proceeded to cease the interception of the IMEI with number 35397301994898 (target 1L77PI1E) in accordance with the legal dispatch contained in the investigation process files. 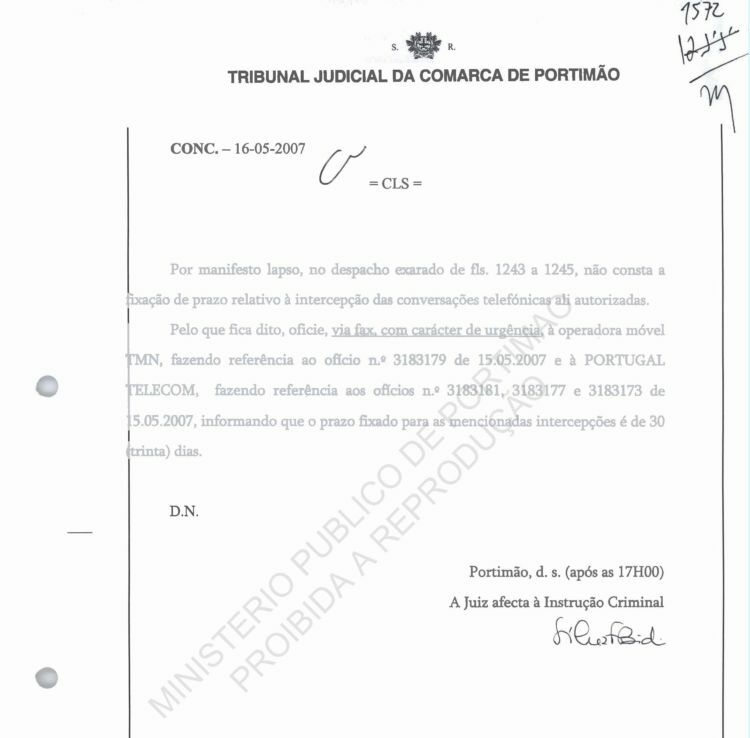 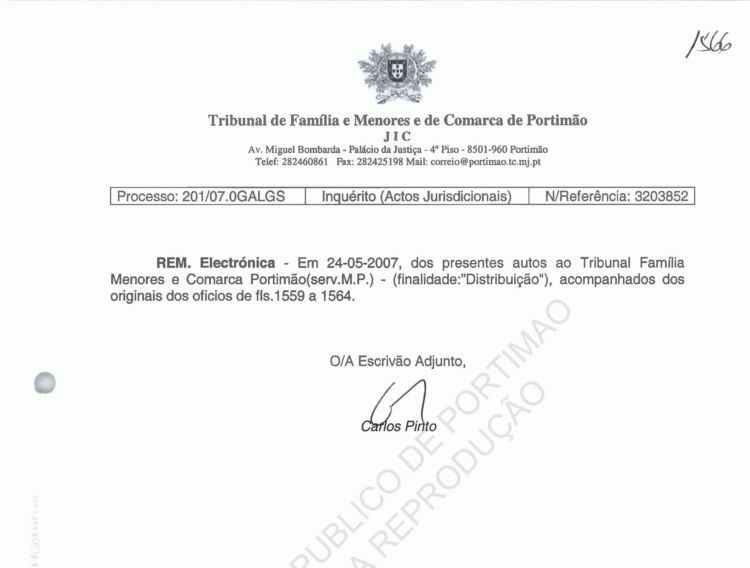 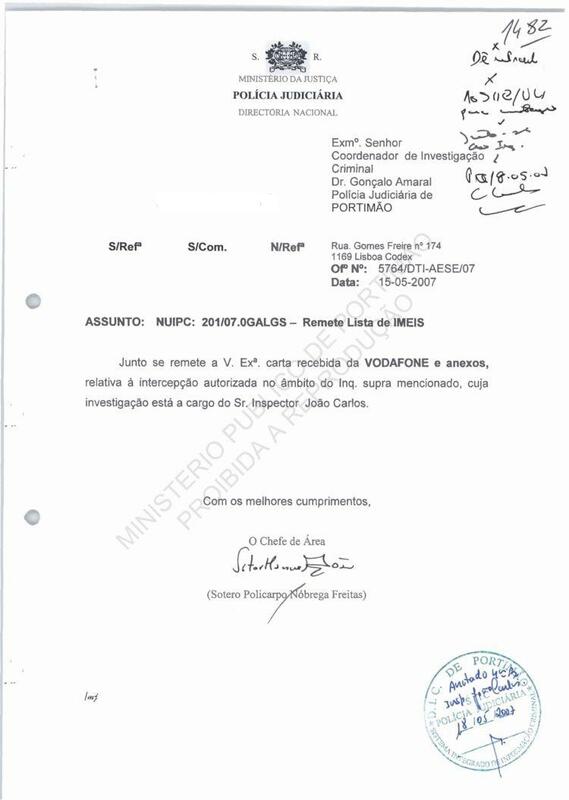 On 29th May 2007 the Policia Judiciaria – Portimao DIC and the PJ Telecommunications Services proceeded to cease the interception of the IMEI with number 35342701609548 (target 1L77PI1E) in accordance with the legal dispatch contained in the investigation process files. 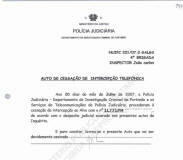 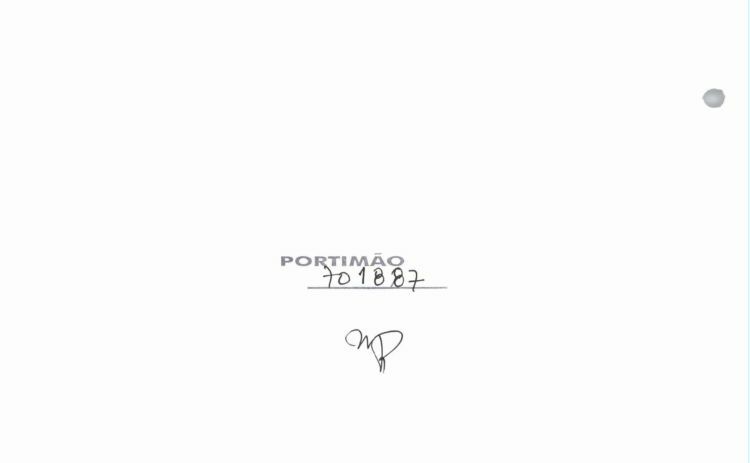 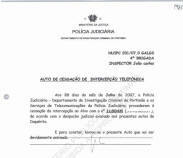 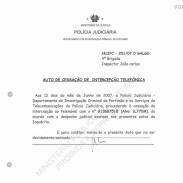 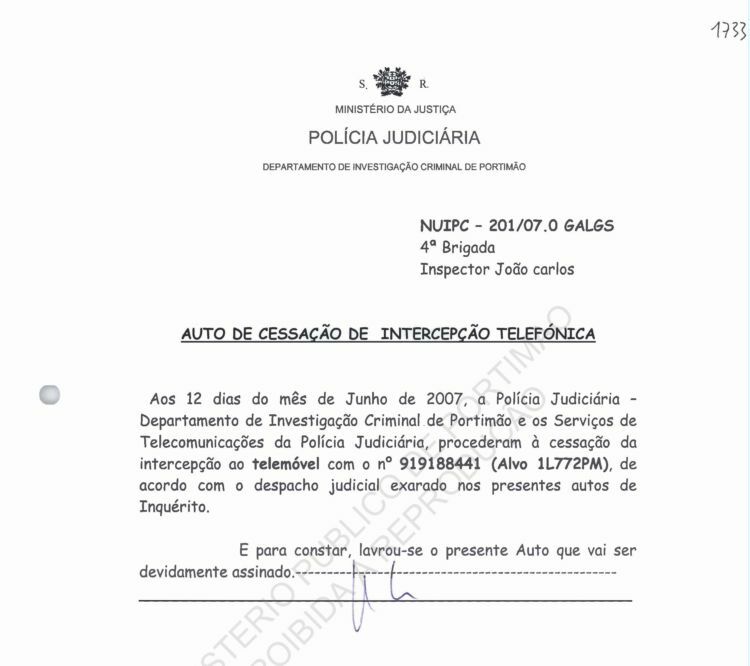 On 12th June 2007 the Policia Judiciaria – Portimao DIC and the PJ Telecommunications Services proceeded to cease the interception of the mobile number 919881959 (target 1L771PM) in accordance with the legal dispatch contained in the investigation process files. 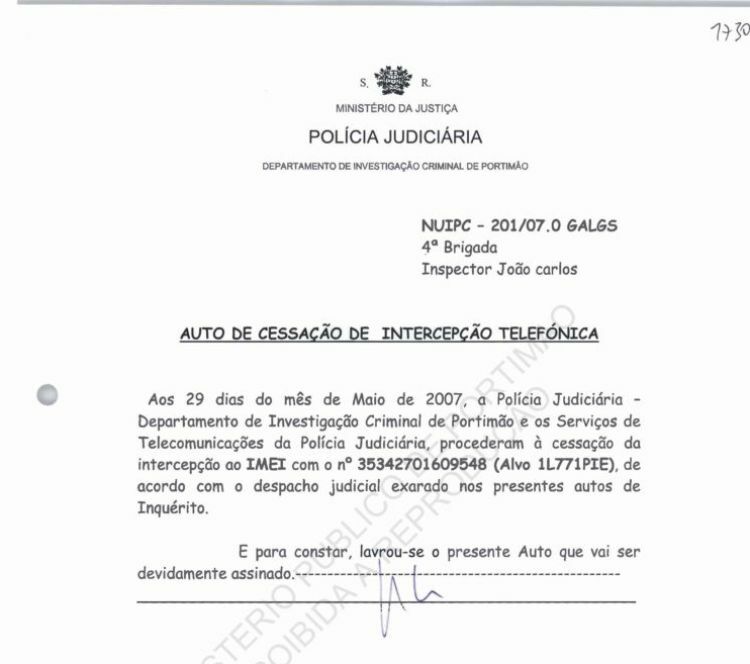 On 29th May 2007 the Policia Judiciaria – Portimao DIC and the PJ Telecommunications Services proceeded to cease the interception of the IMEI with number 35605700832929 (target 1L772PIE) in accordance with the legal dispatch contained in the investigation process files. 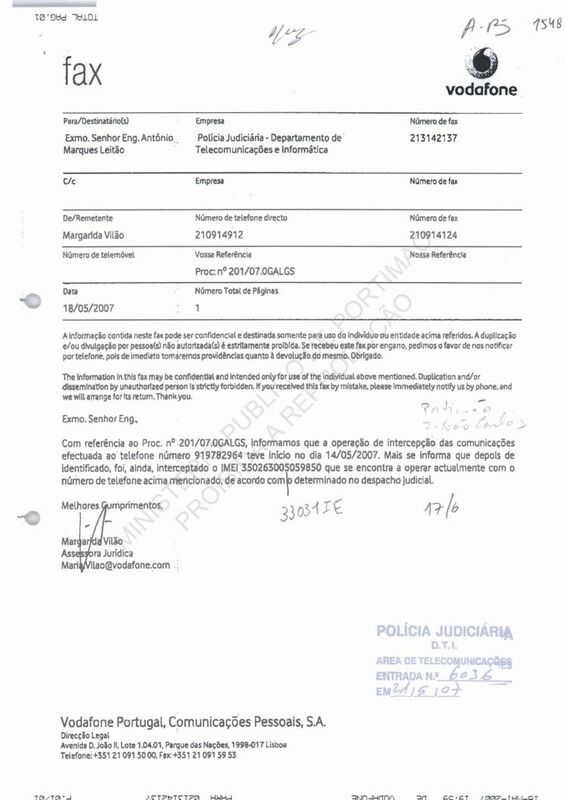 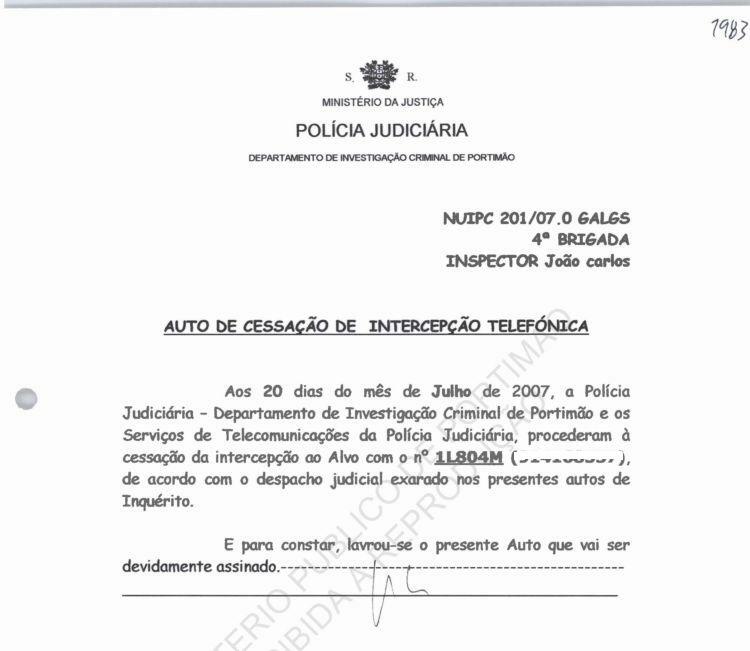 On 12th June 2007 the Policia Judiciaria Portimao DIC and the PJ Telecommunications Services proceeded to cease the interception of the mobile number 919188441 (target 1L772PM) in accordance with the legal dispatch contained in the investigation process files. 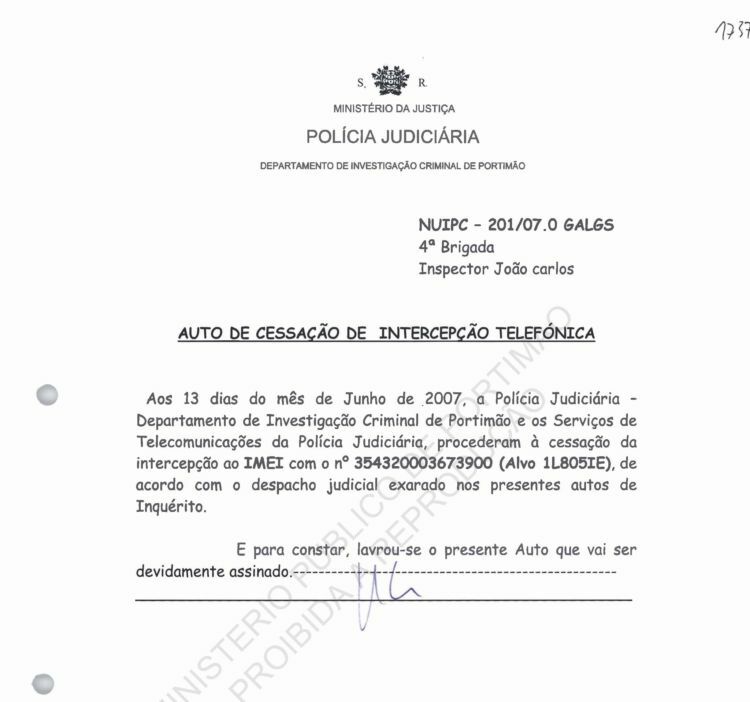 On 13th June 2007 the Policia Judiciaria – Portimao DIC and the PJ Telecommunications Services proceeded to cease the interception of the IMEI with number 353648012179090 (target 1L803IE) in accordance with the legal dispatch contained in the investigation process files. 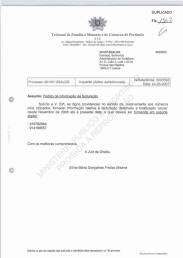 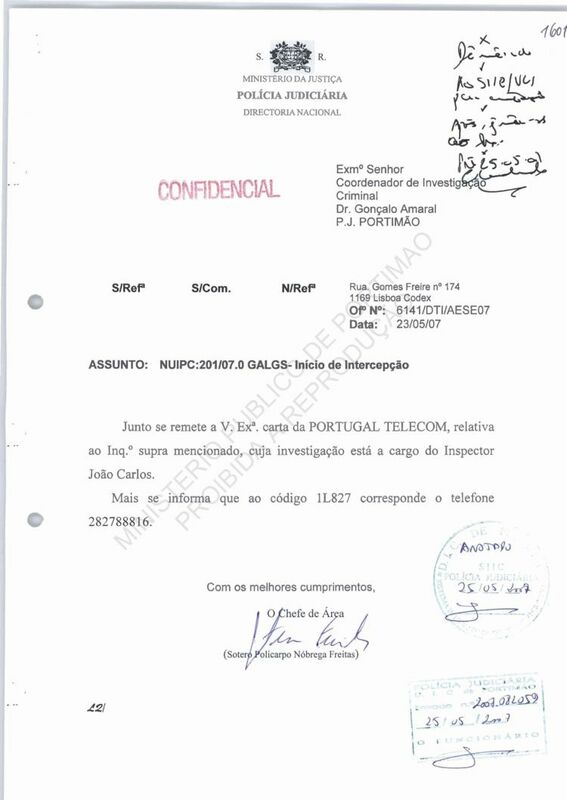 On 13th June 2007 the Policia Judiciaria Portimao DIC and the PJ Telecommunications Services proceeded to cease the interception of the mobile number 91948359 (target 1L803M) in accordance with the legal dispatch contained in the investigation process files. 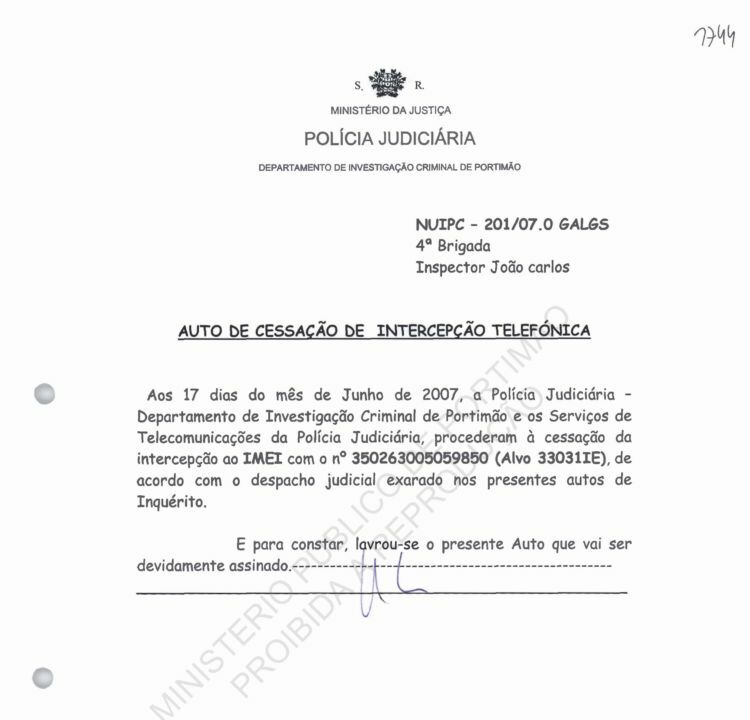 On 13th June 2007 the Policia Judiciaria Portimao DIC and the PJ Telecommunications Services proceeded to cease the interception of the mobile number 914168557 (target 1L804M) in accordance with the legal dispatch contained in the investigation process files. 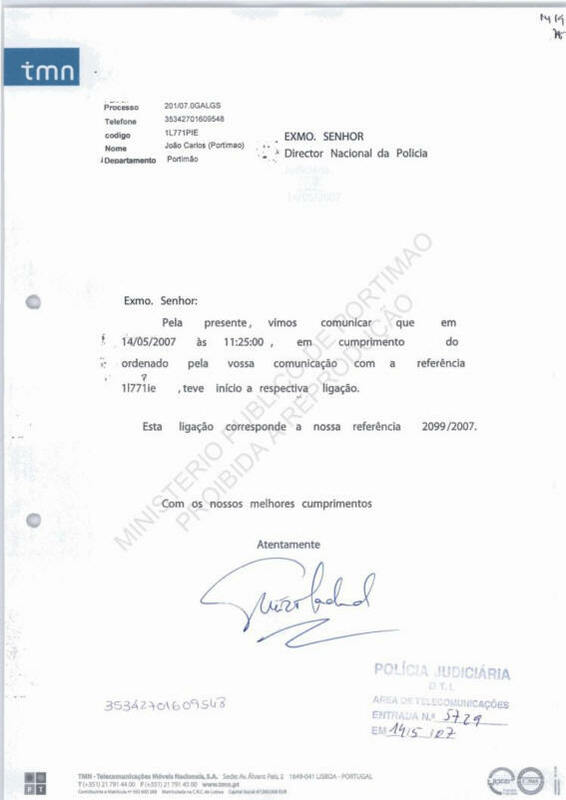 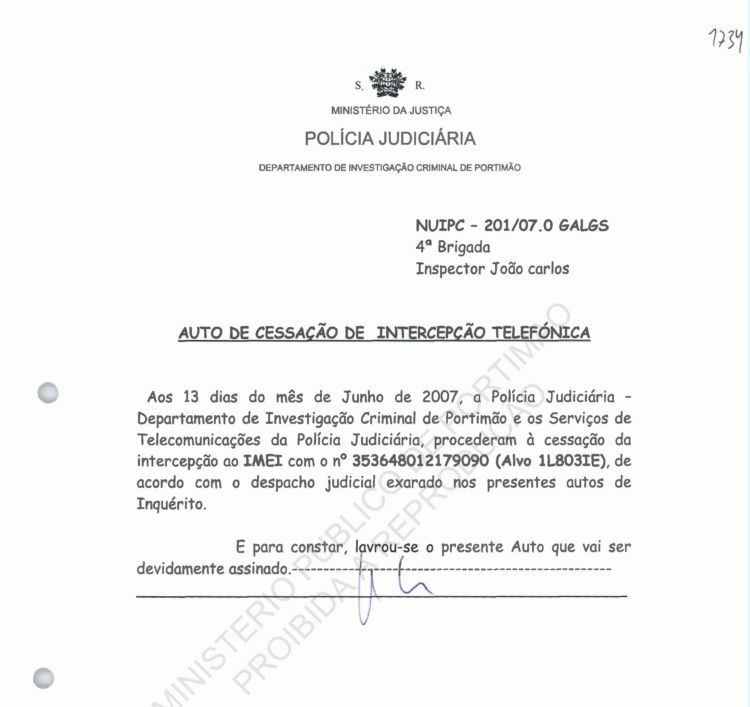 On 13th June 2007 the Policia Judiciaria – Portimao DIC and the PJ Telecommunications Services proceeded to cease the interception of the IMEI with number 354320003673900 (target 1L805IE) in accordance with the legal dispatch contained in the investigation process files. 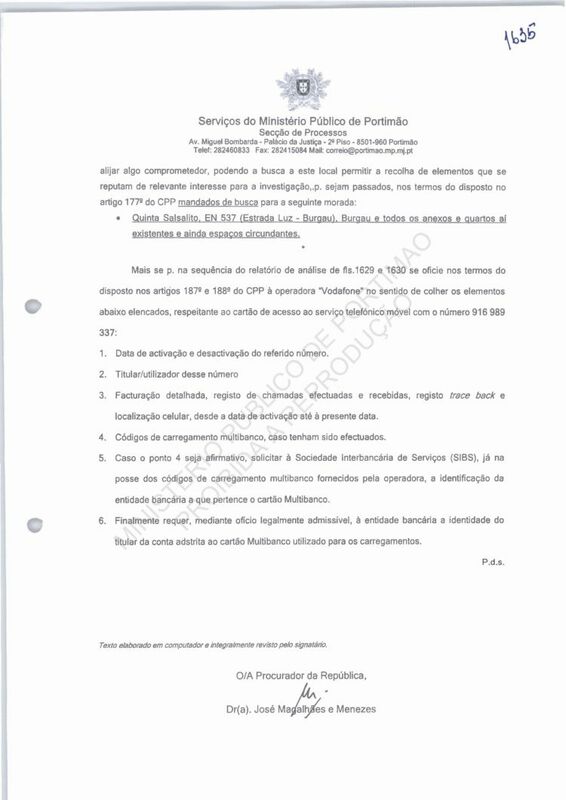 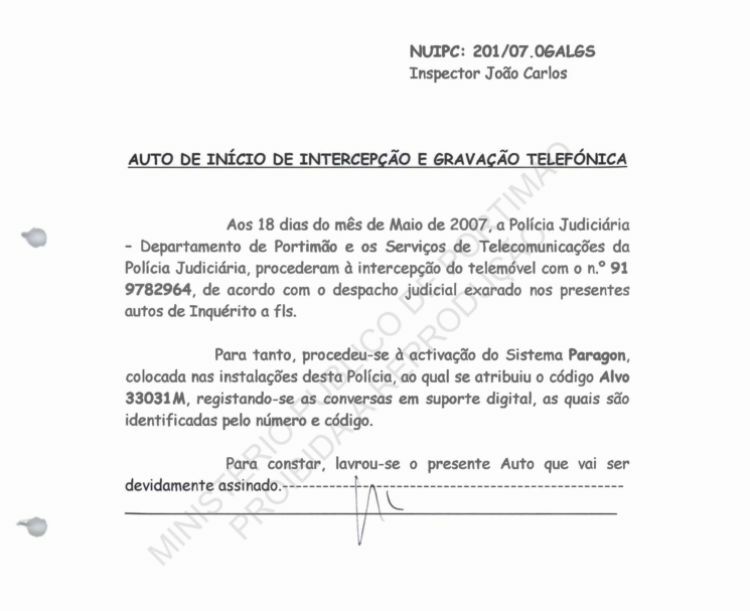 On 13th June 2007 the Policia Judiciaria Portimao DIC and the PJ Telecommunications Services proceeded to cease the interception of the mobile number 918224078 (target 1L805M) in accordance with the legal dispatch contained in the investigation process files. 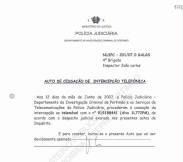 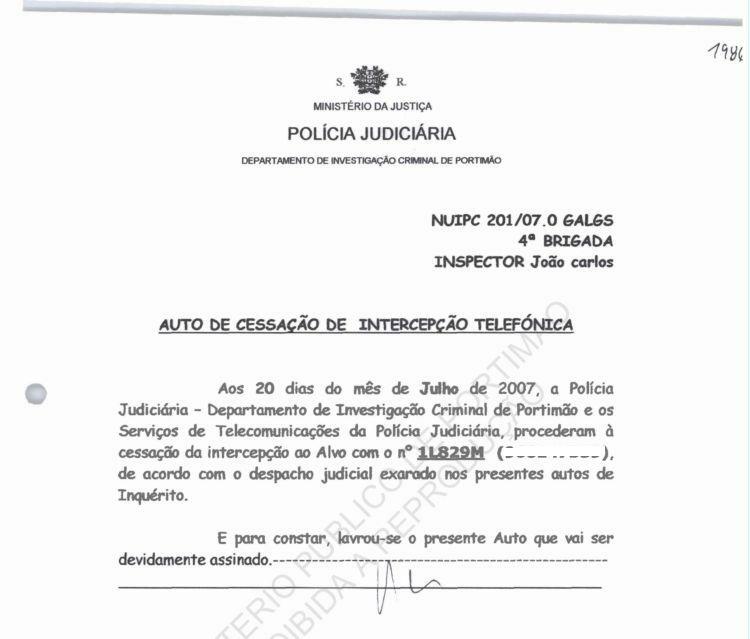 On 14th June 2007 the Policia Judiciaria Portimao DIC and the PJ Telecommunications Services proceeded to cease the interception of the fixed telephone number 282760189 (target 1L826) in accordance with the legal dispatch contained in the investigation process files. 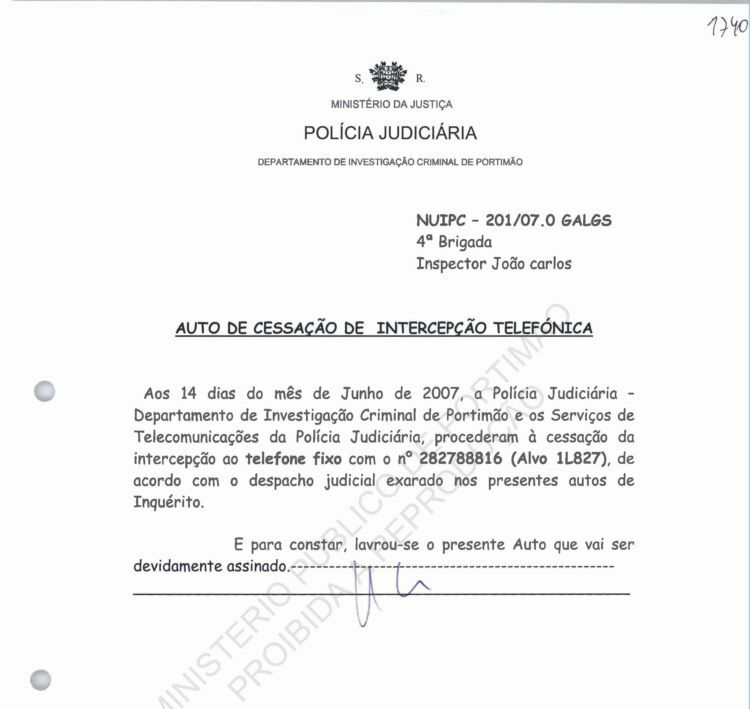 On 14th June 2007 the Policia Judiciaria Portimao DIC and the PJ Telecommunications Services proceeded to cease the interception of the fixed telephone number 282788816 (target 1L827) in accordance with the legal dispatch contained in the investigation process files. 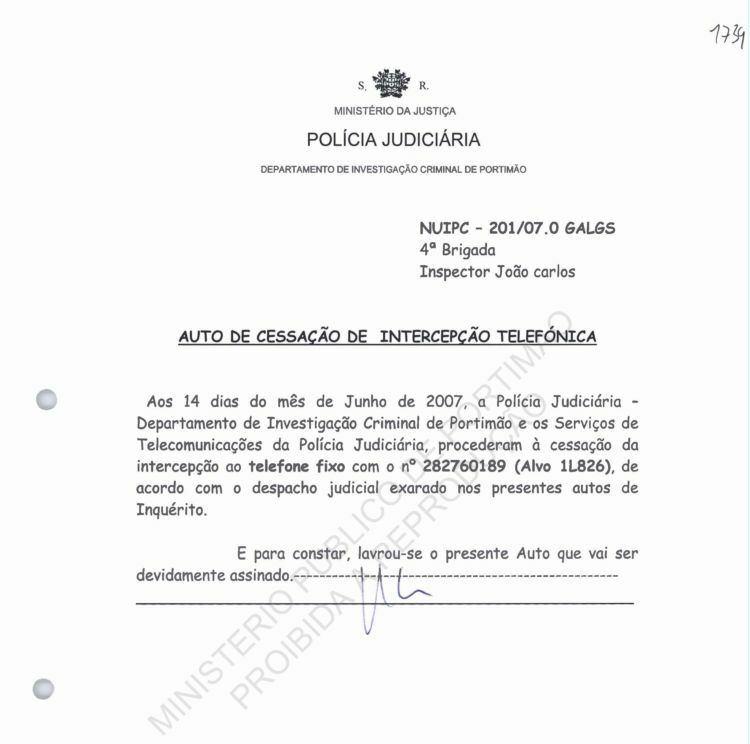 On 14th June 2007 the Policia Judiciaria Portimao DIC and the PJ Telecommunications Services proceeded to cease the interception of the fixed telephone number 282788807 (target 1L828) in accordance with the legal dispatch contained in the investigation process files. 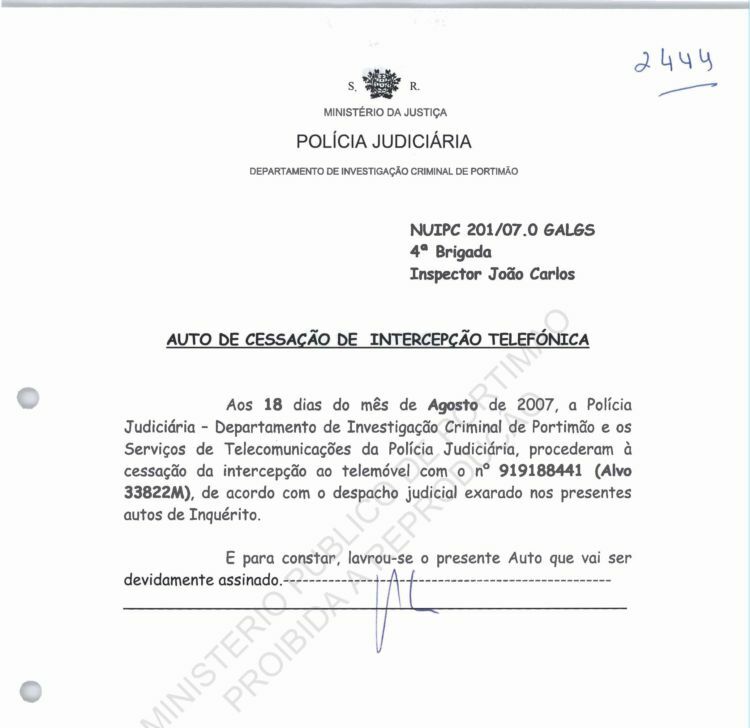 On 14th June 2007 the Policia Judiciaria – Portimao DIC and the PJ Telecommunications Services proceeded to cease the interception of the IMEI with number 35342701609548 (target 1L829IE) in accordance with the legal dispatch contained in the investigation process files. On 14th June 2007 the Policia Judiciaria Portimao DIC and the PJ Telecommunications Services proceeded to cease the interception of the mobile number 960147559 (target 1L829M) in accordance with the legal dispatch contained in the investigation process files. 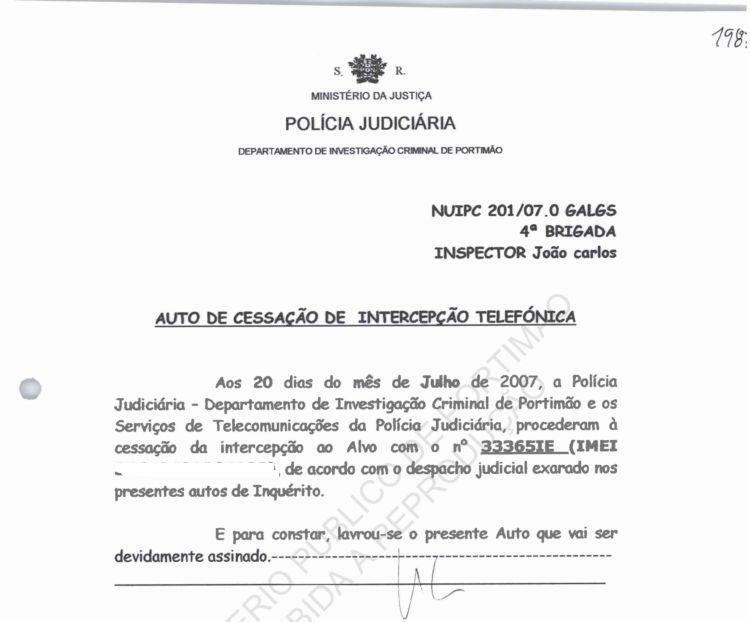 On 17th June 2007 the Policia Judiciaria – Portimao DIC and the PJ Telecommunications Services proceeded to cease the interception of the IMEI with number 350263005059850 (target 33031IE) in accordance with the legal dispatch contained in the investigation process files. 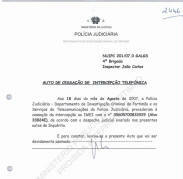 On 17th June 2007 the Policia Judiciaria Portimao DIC and the PJ Telecommunications Services proceeded to cease the interception of the mobile number 919782964 (target 33031M) in accordance with the legal dispatch contained in the investigation process files. On 18th June 2007 the Policia Judiciaria Portimao DIC and the PJ Telecommunications Services proceeded to cease the interception of the fixed telephone number 282762811 (target 33030) in accordance with the legal dispatch contained in the investigation process files. 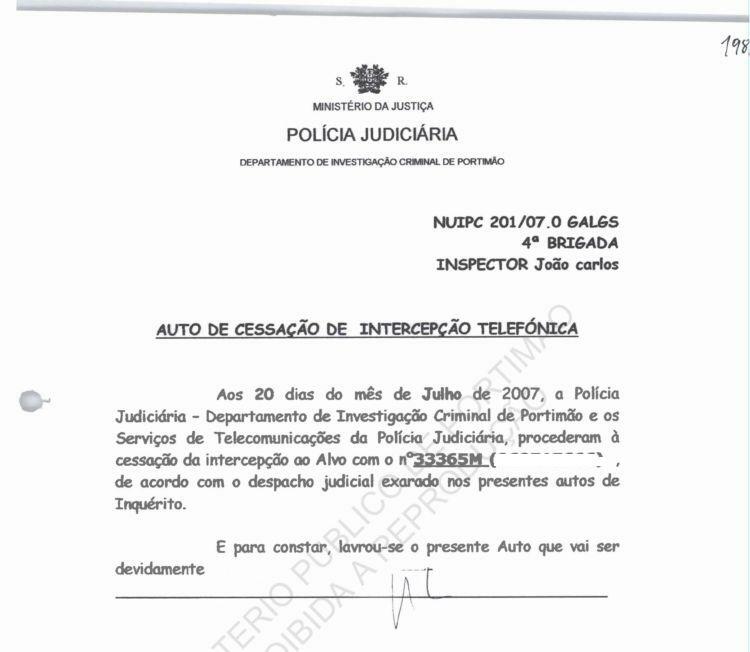 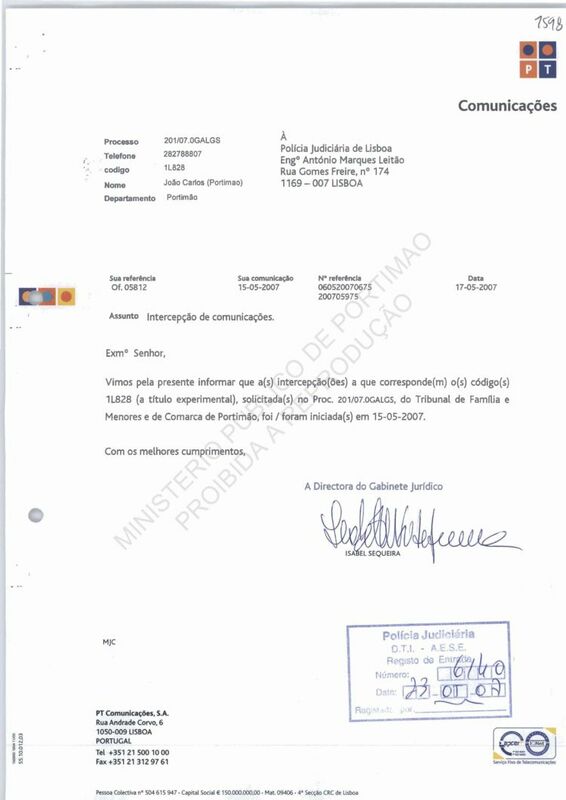 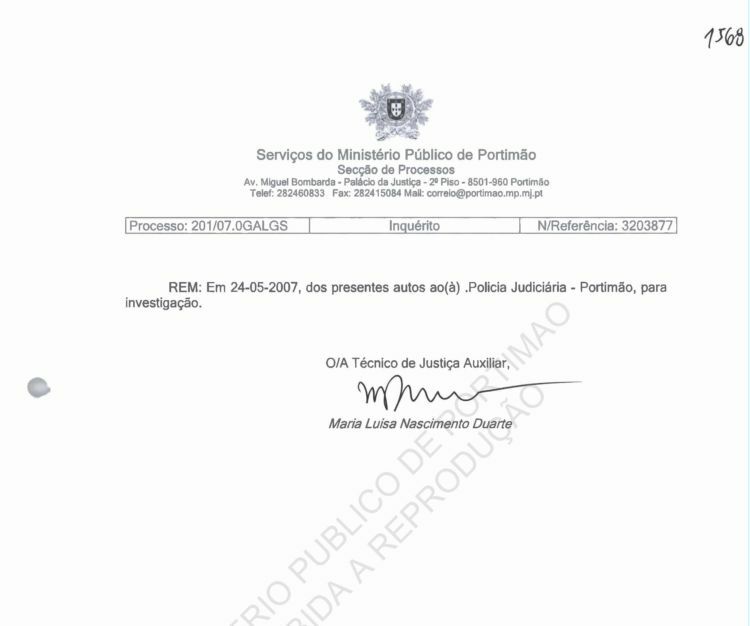 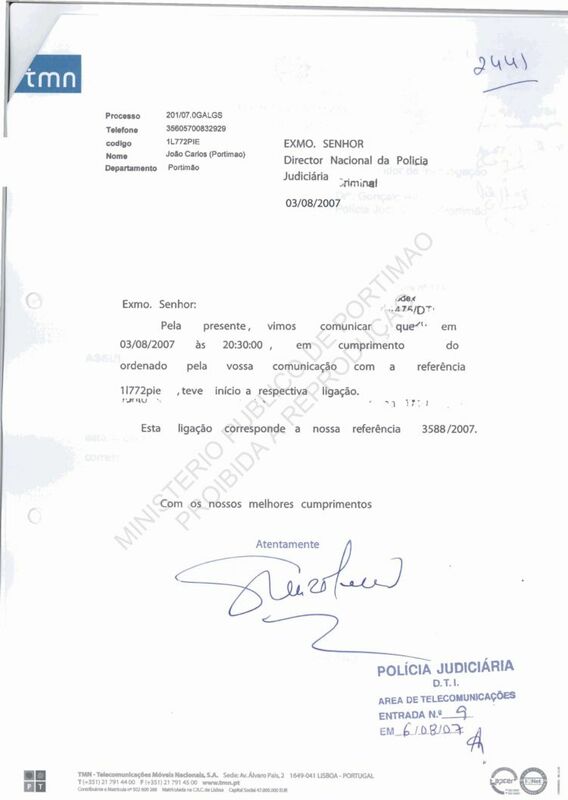 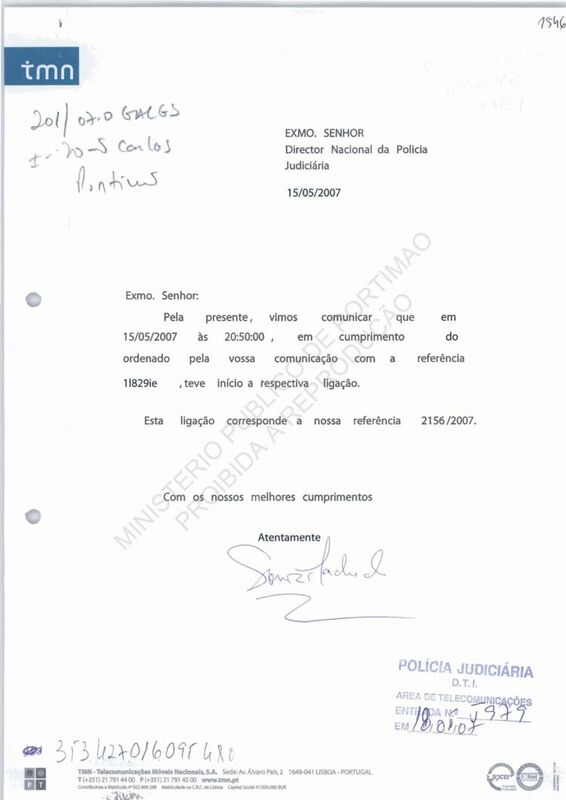 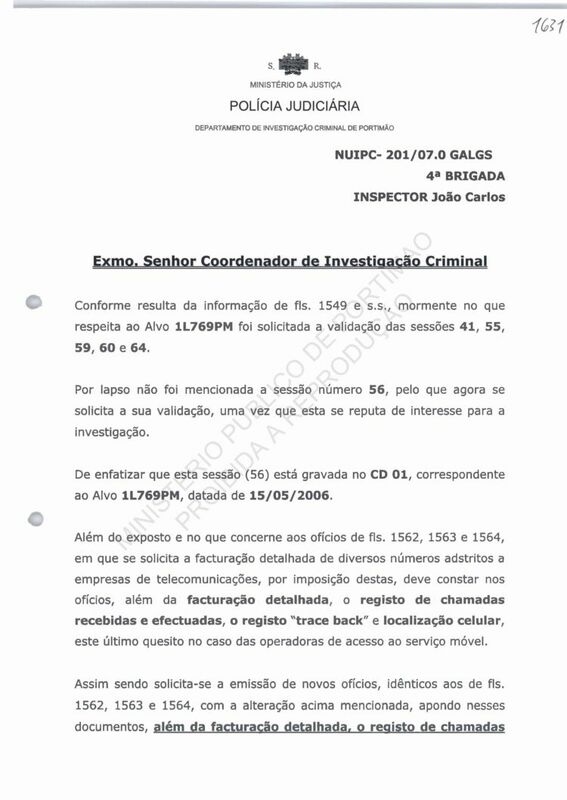 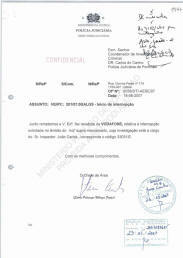 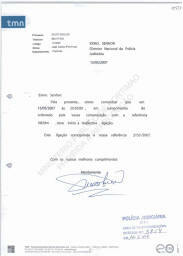 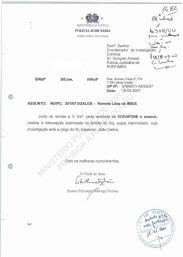 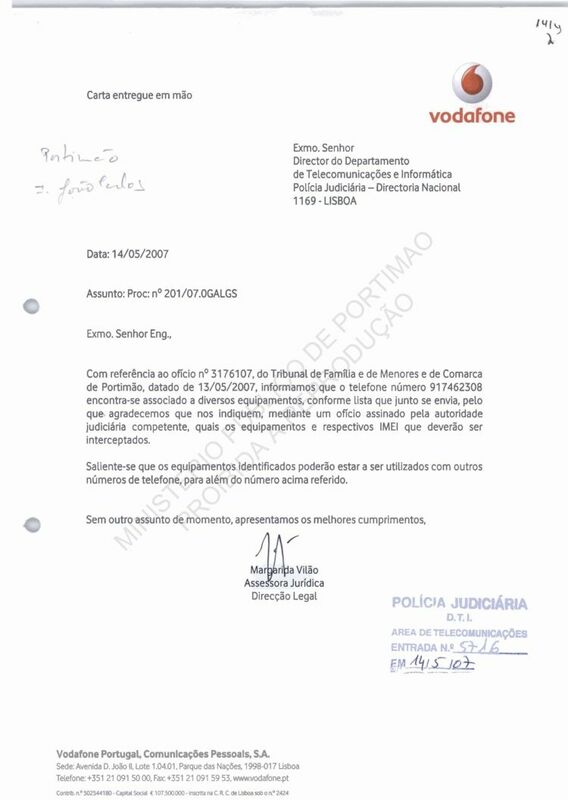 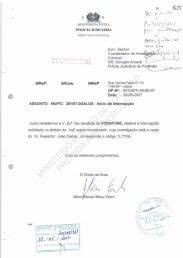 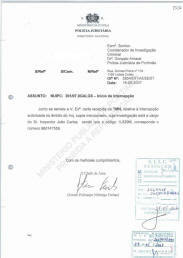 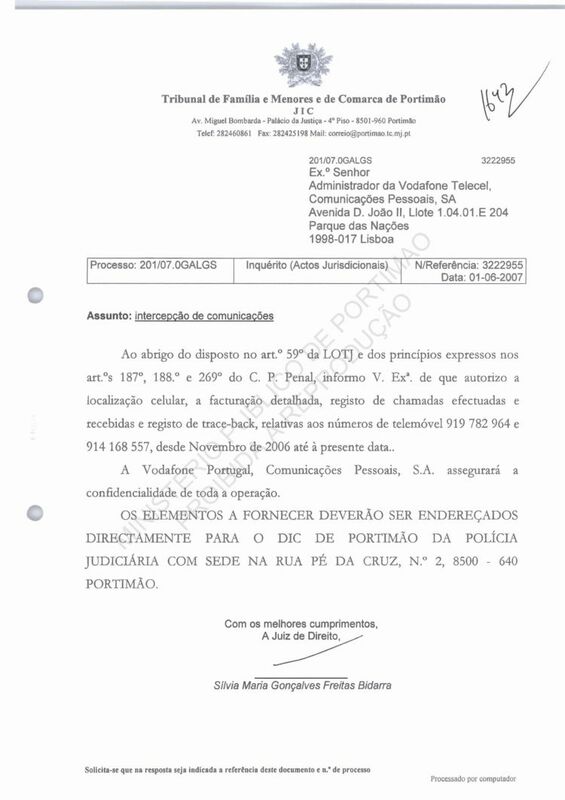 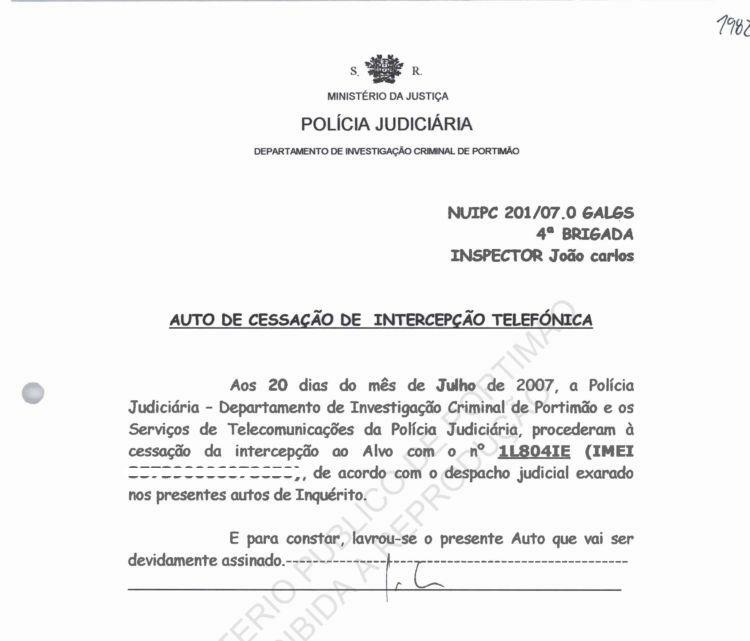 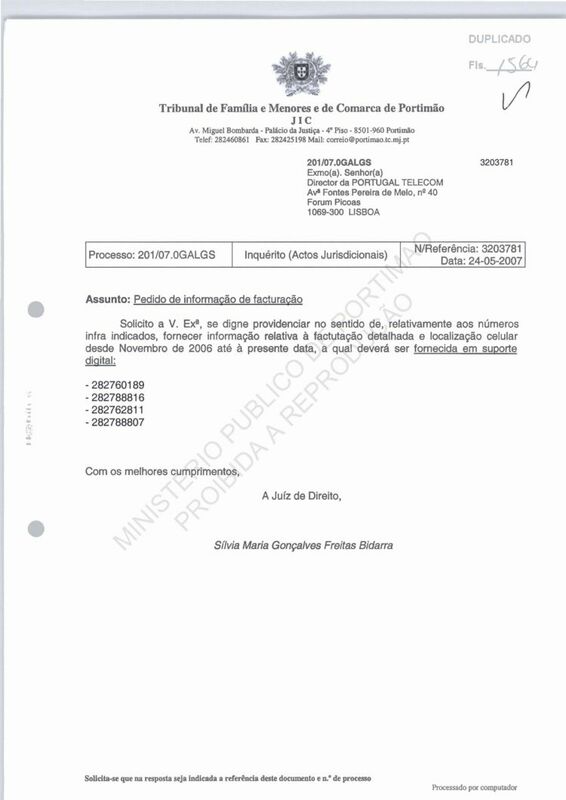 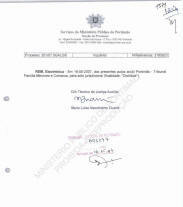 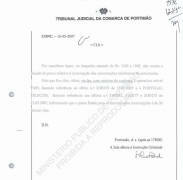 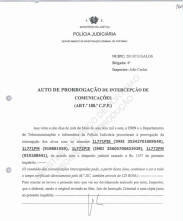 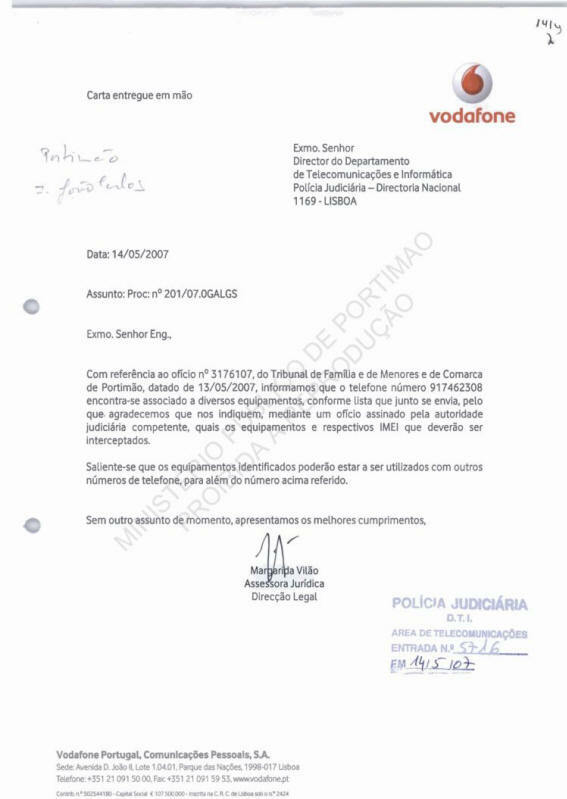 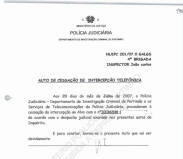 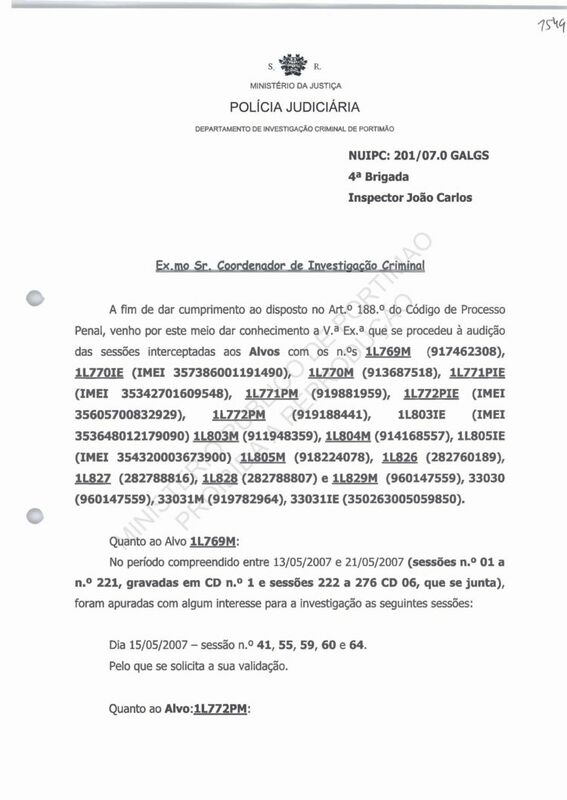 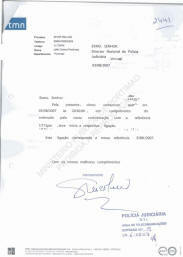 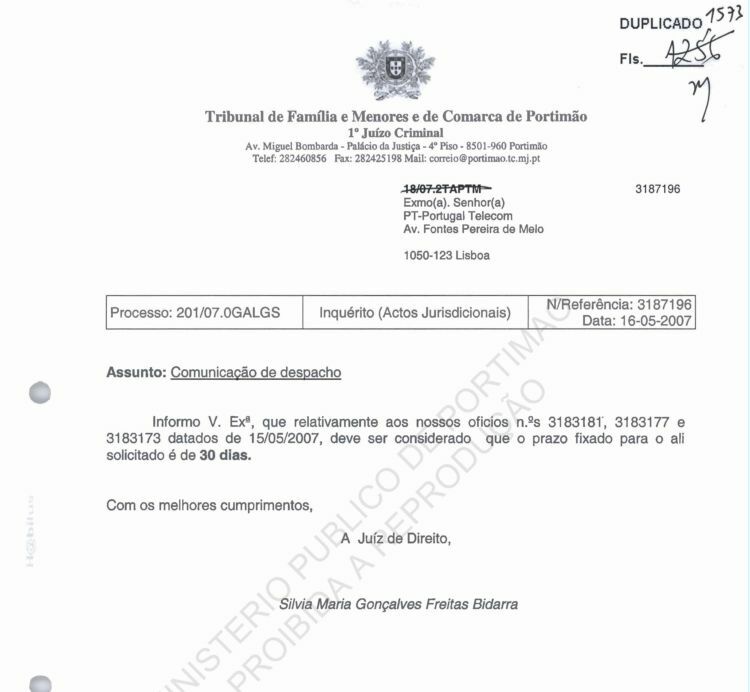 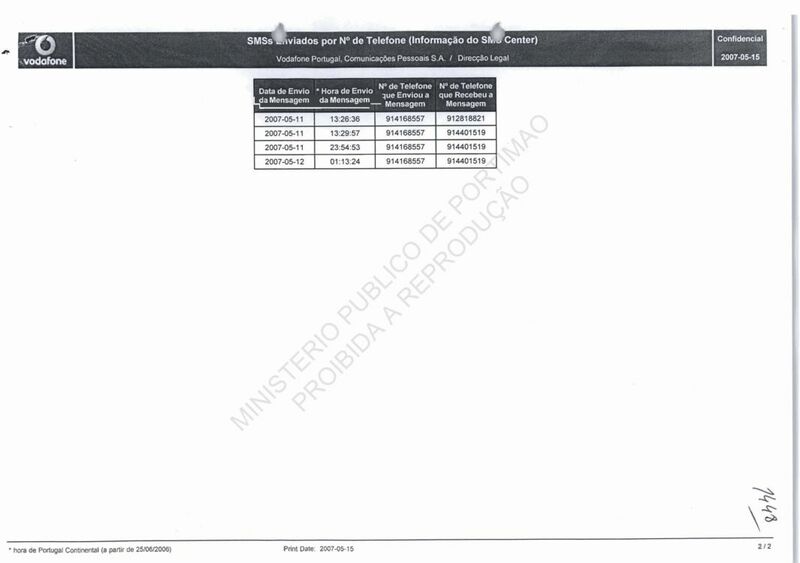 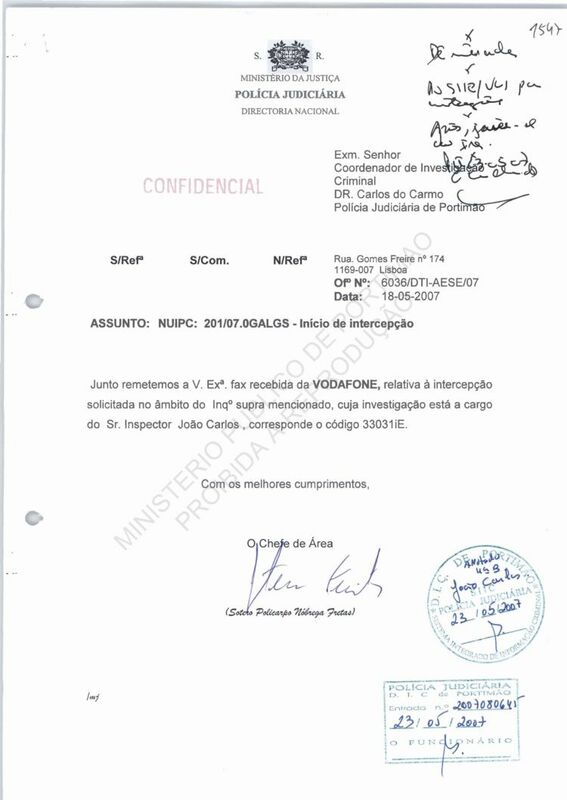 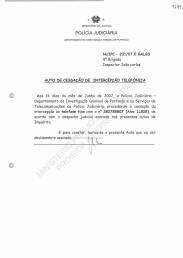 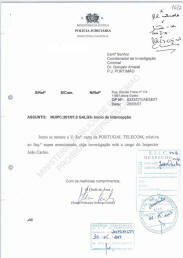 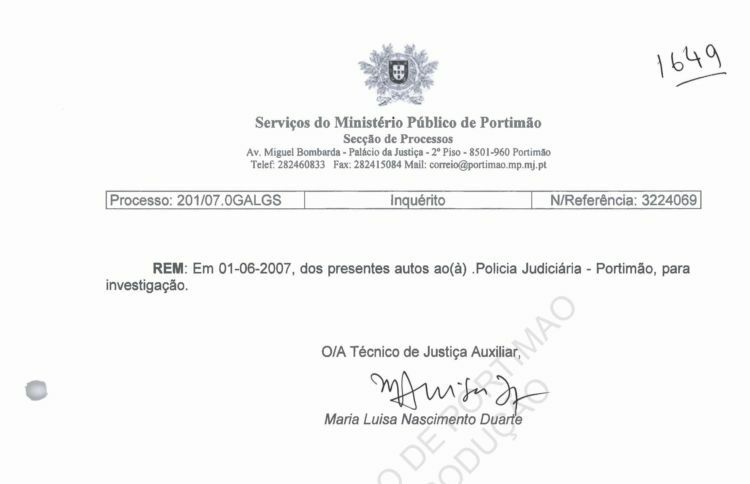 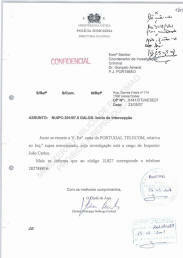 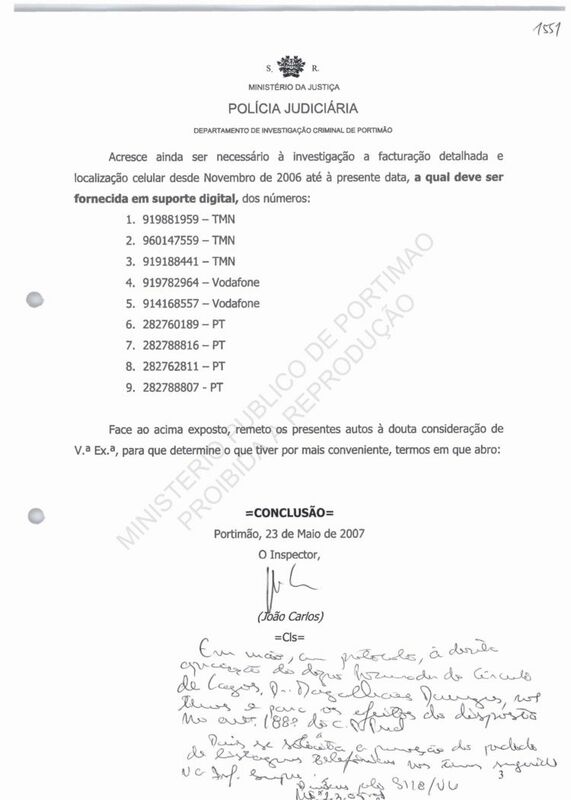 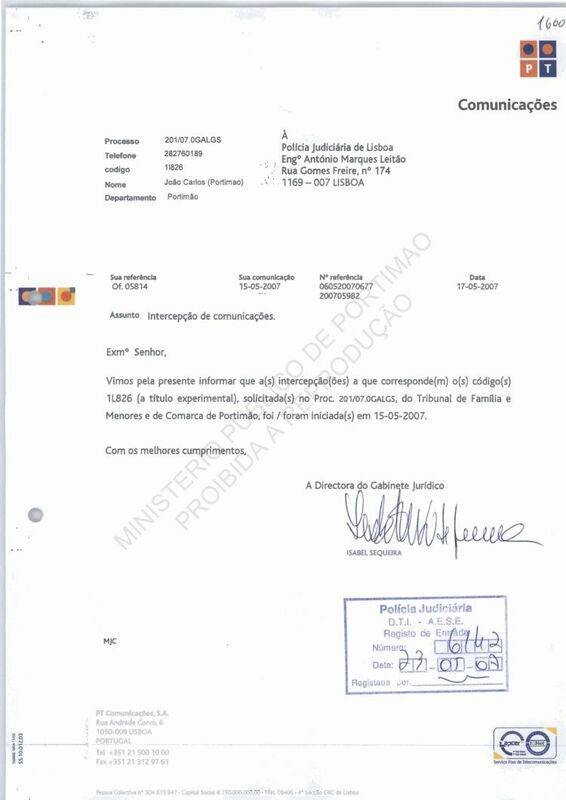 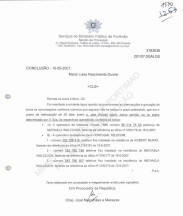 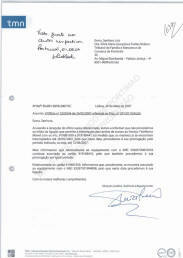 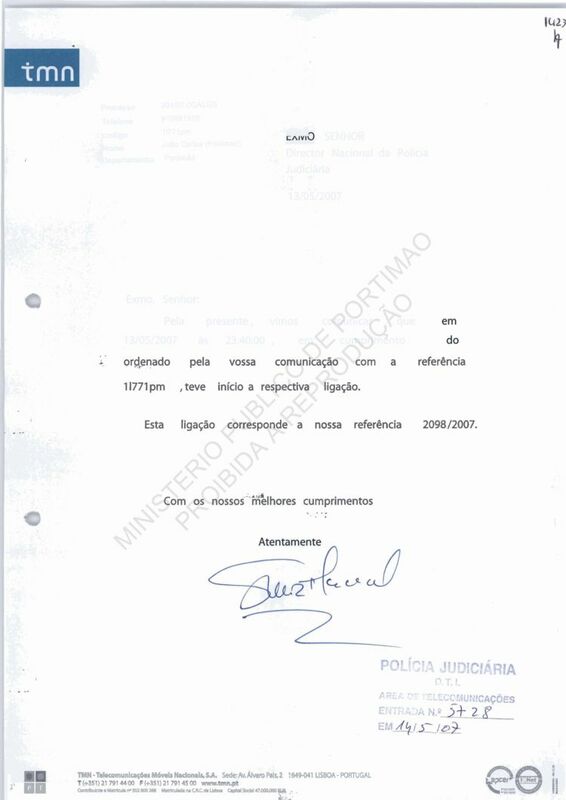 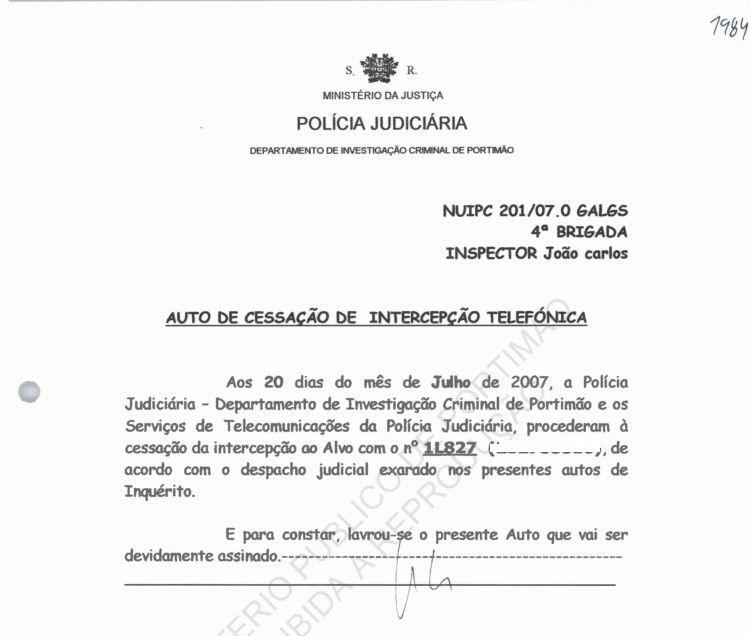 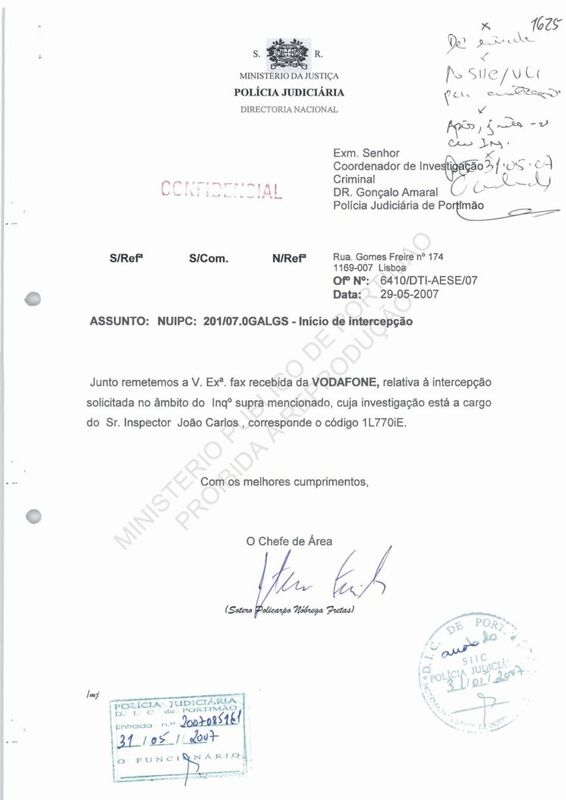 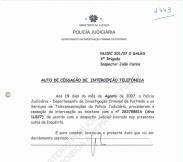 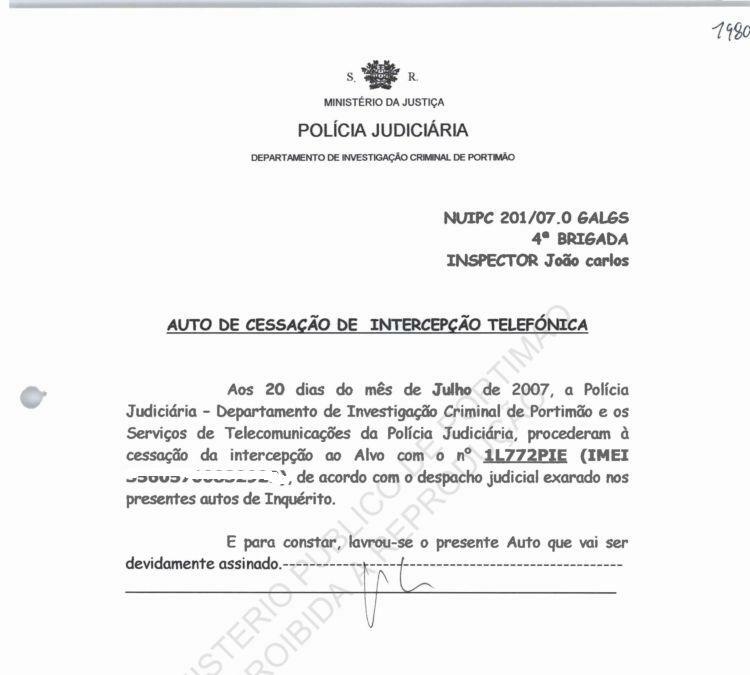 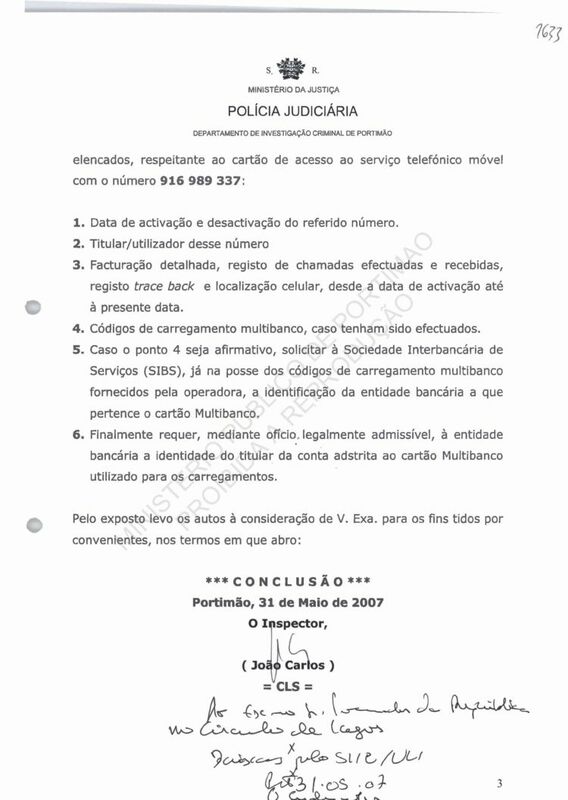 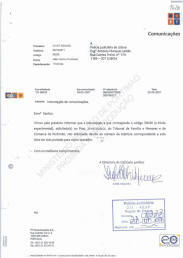 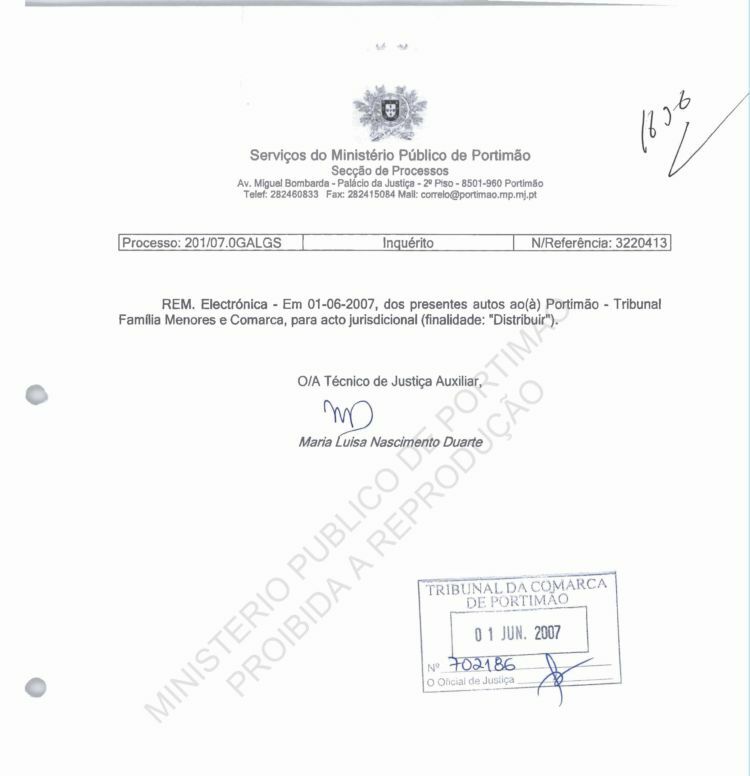 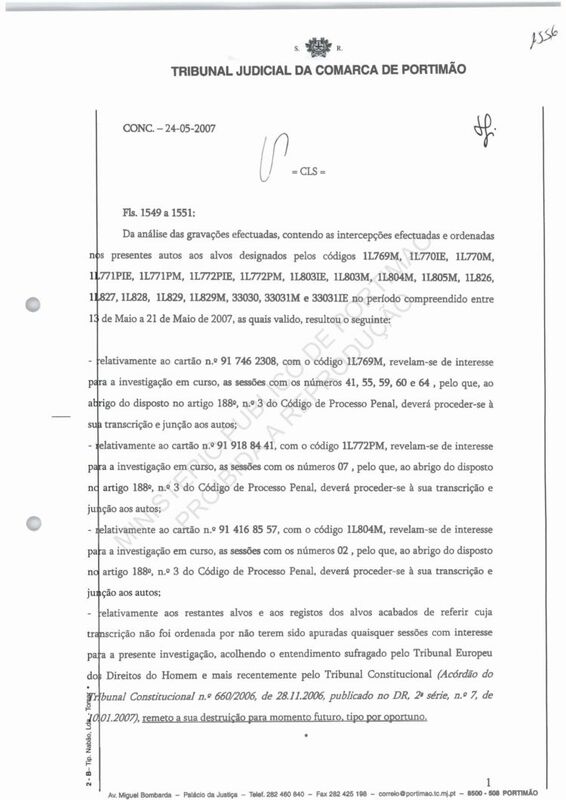 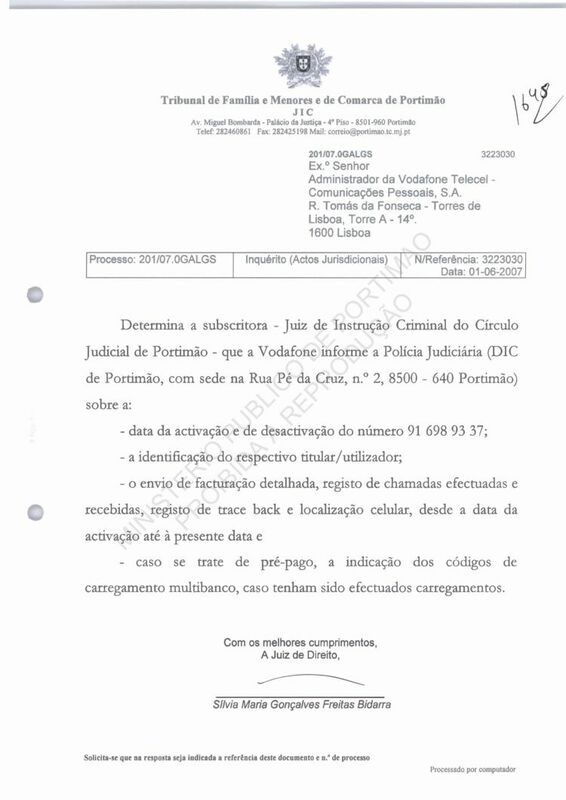 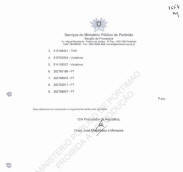 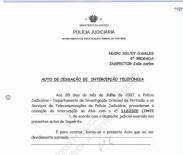 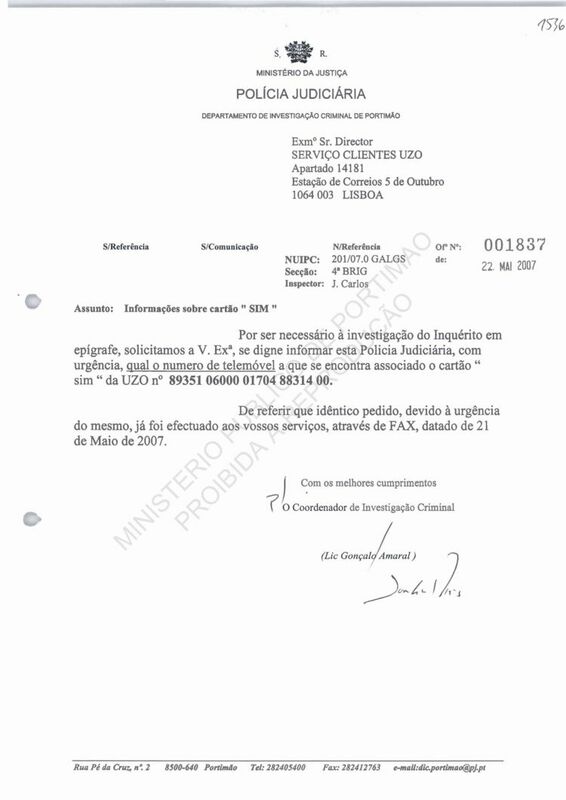 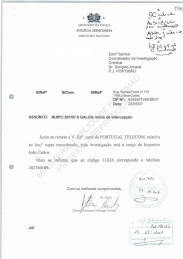 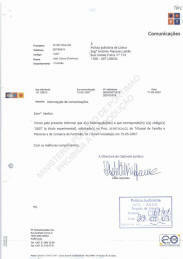 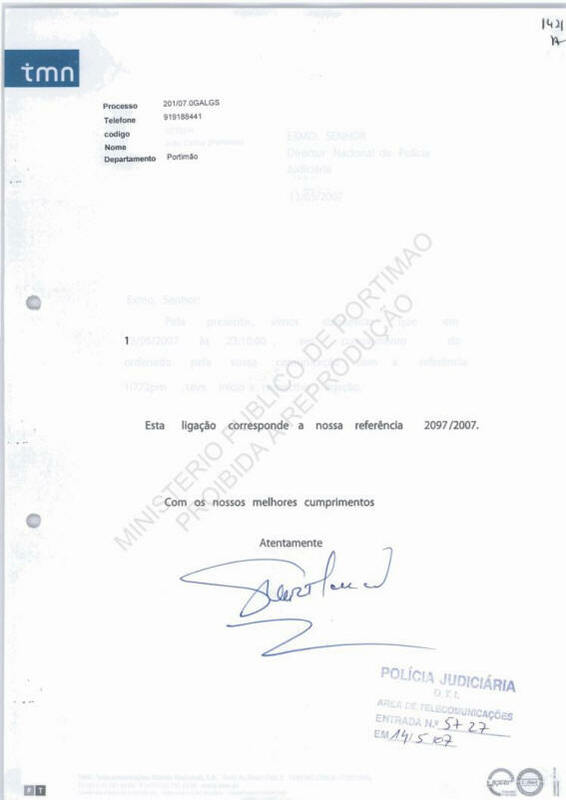 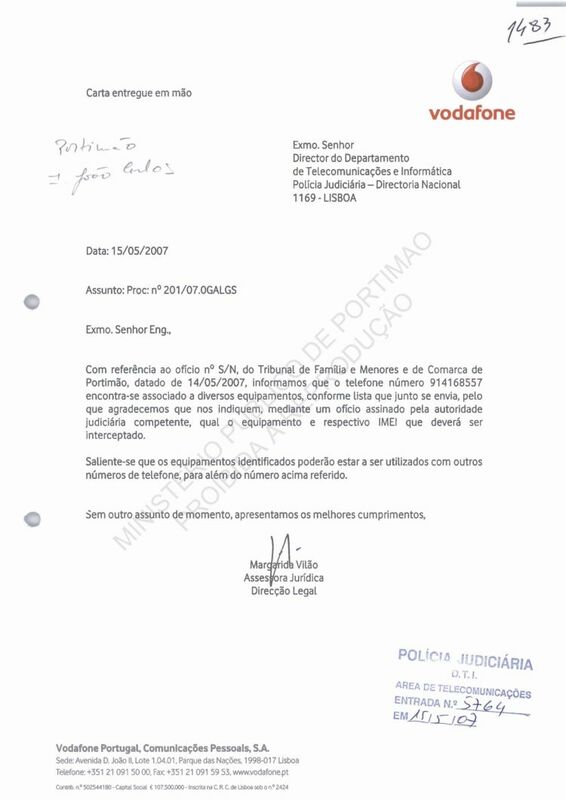 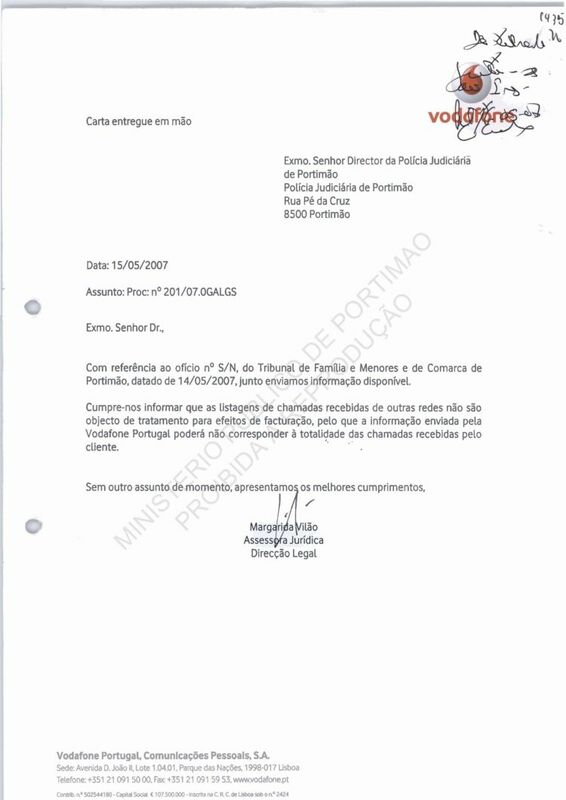 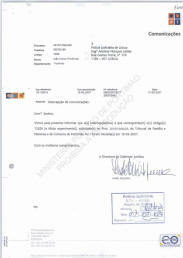 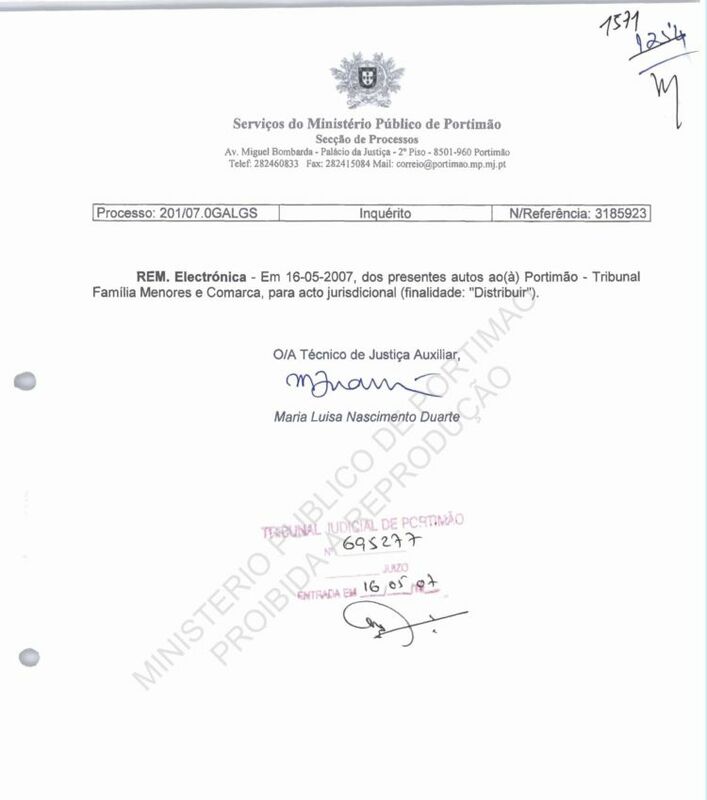 On 20th July 2007 the Policia Judiciaria – Portimao DIC and the PJ Telecommunications Services proceeded to cease the interception of the target with number 1L771PI1E (IMEI 35397301994898) in accordance with the legal dispatch contained in the investigation process files. 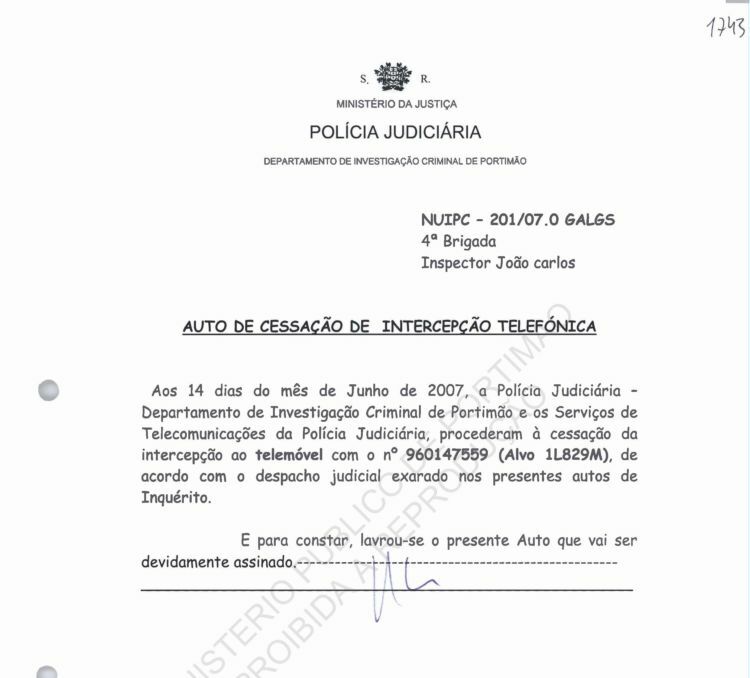 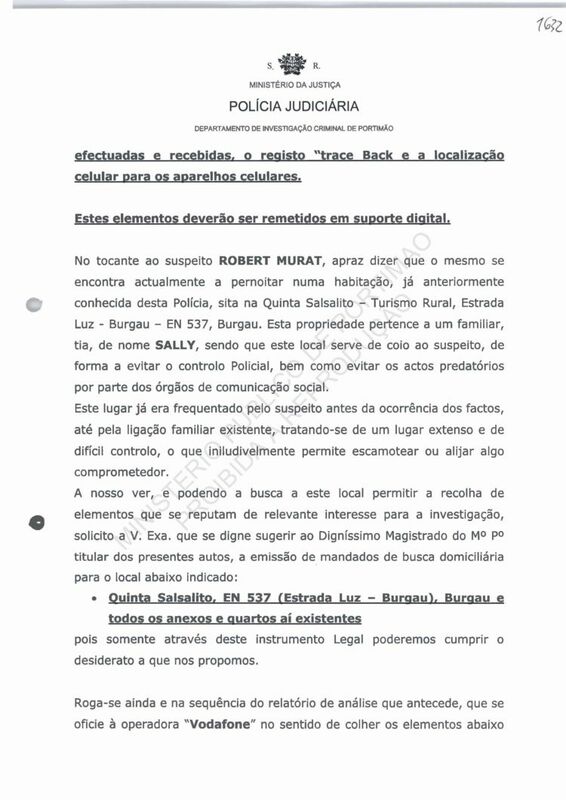 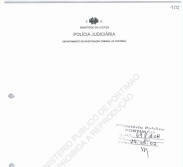 On 20th July 2007 the Policia Judiciaria – Portimao DIC and the PJ Telecommunications Services proceeded to cease the interception of the target with number 1L771PM (919881959) in accordance with the legal dispatch contained in the investigation process files. 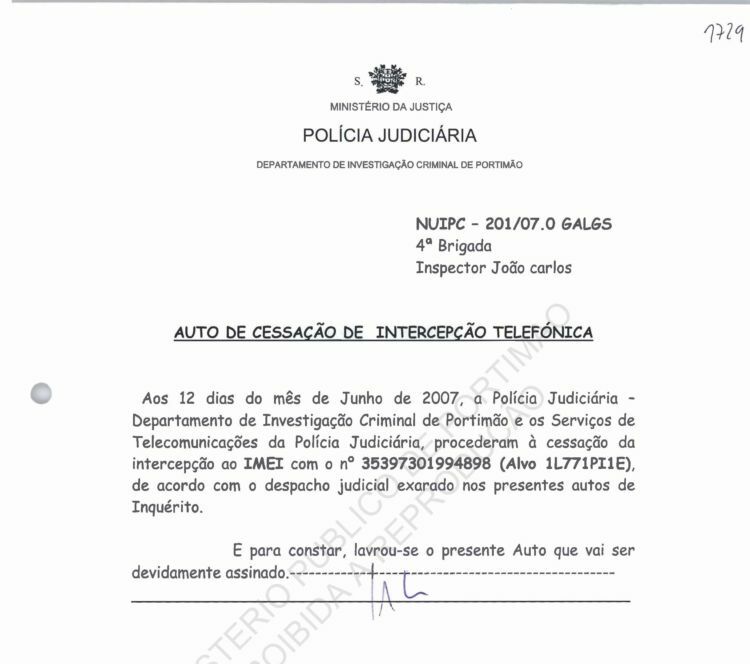 On 20th July 2007 the Policia Judiciaria – Portimao DIC and the PJ Telecommunications Services proceeded to cease the interception of the target with number 1L772PIE (IMEI 35605700832929) in accordance with the legal dispatch contained in the investigation process files. 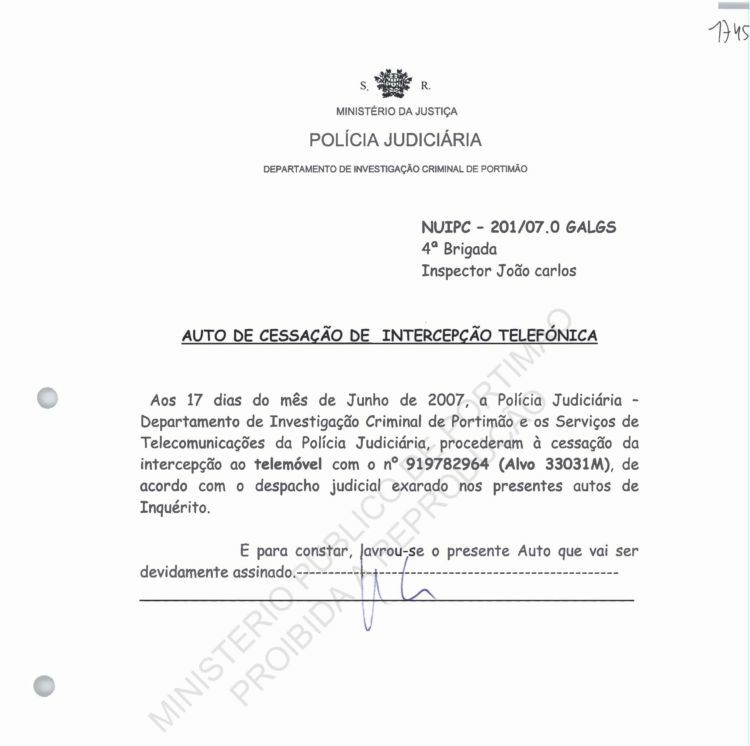 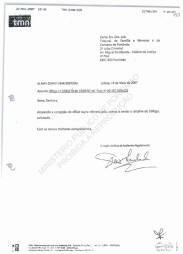 On 20th July 2007 the Policia Judiciaria – Portimao DIC and the PJ Telecommunications Services proceeded to cease the interception of the target with number 1L772PM (919188441) in accordance with the legal dispatch contained in the investigation process files. 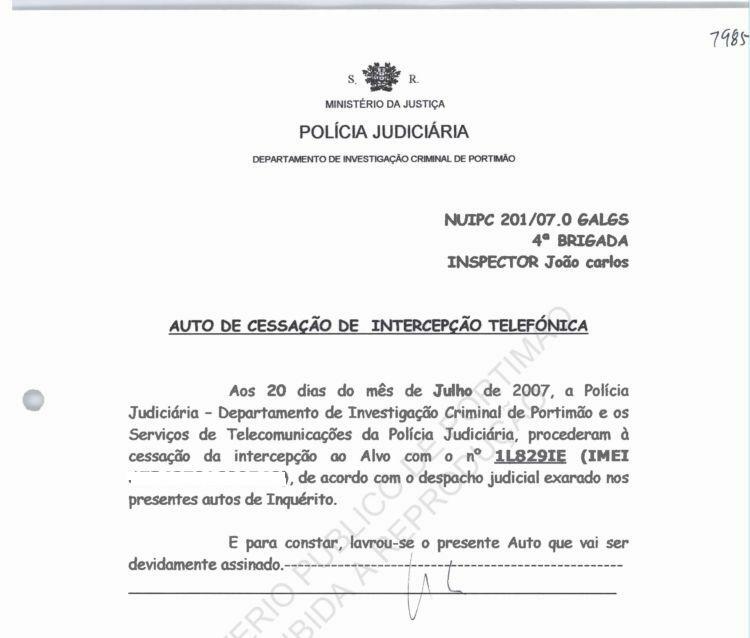 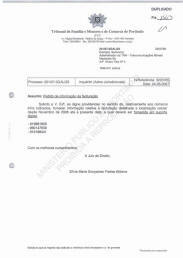 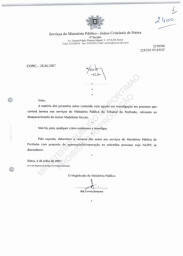 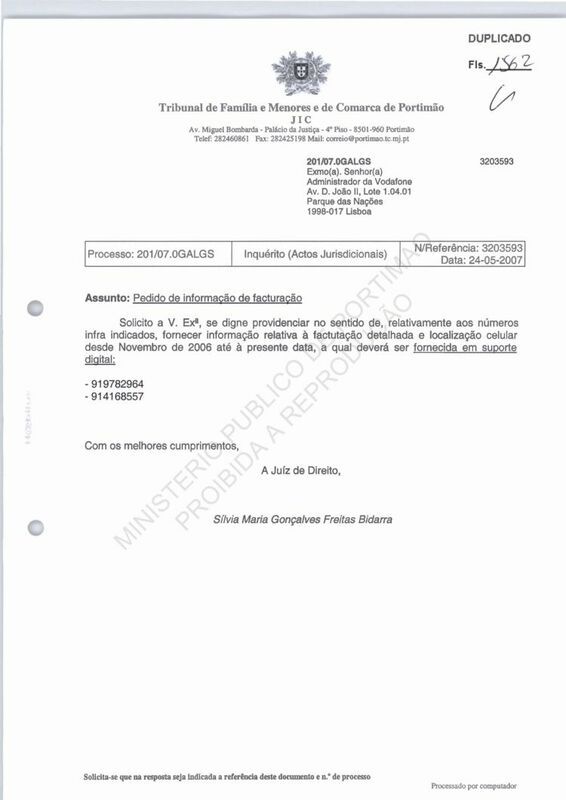 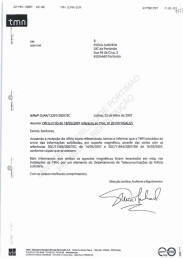 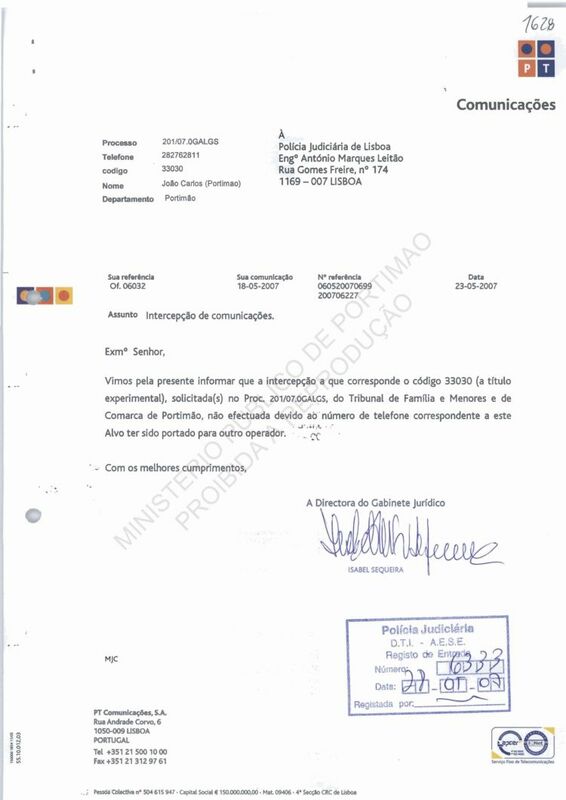 On 20th July 2007 the Policia Judiciaria – Portimao DIC and the PJ Telecommunications Services proceeded to cease the interception of the target with number 1L804IE (IMEI 357390006078650) in accordance with the legal dispatch contained in the investigation process files. 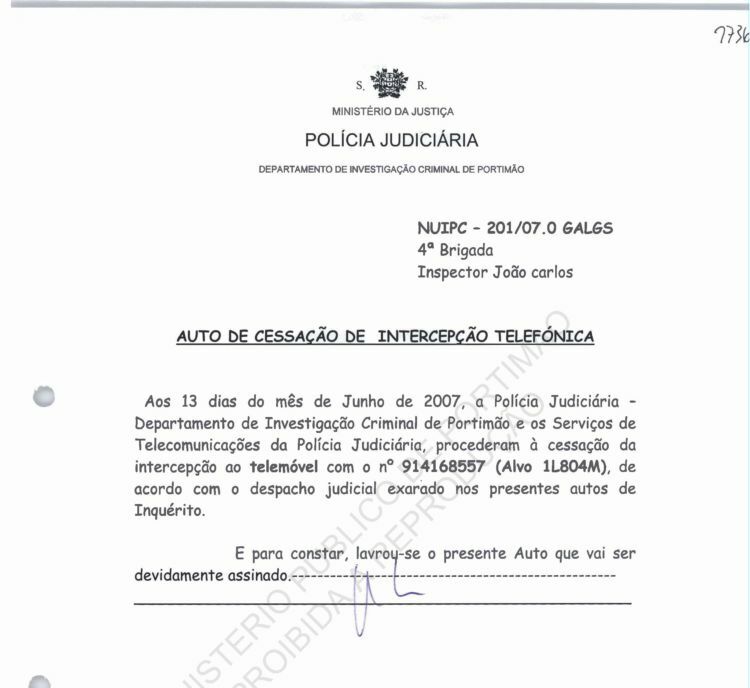 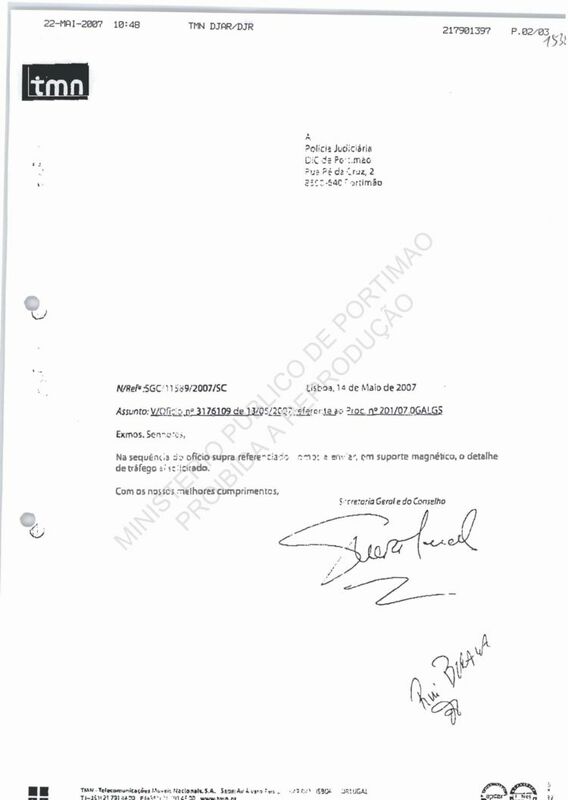 On 20th July 2007 the Policia Judiciaria – Portimao DIC and the PJ Telecommunications Services proceeded to cease the interception of the target with number 1L804M (914168557) in accordance with the legal dispatch contained in the investigation process files. 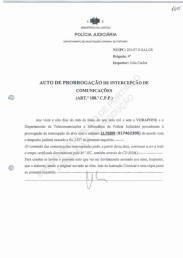 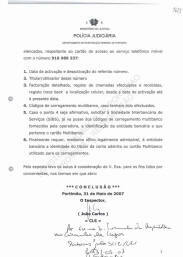 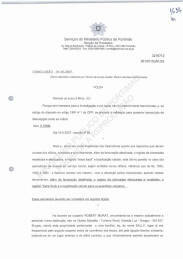 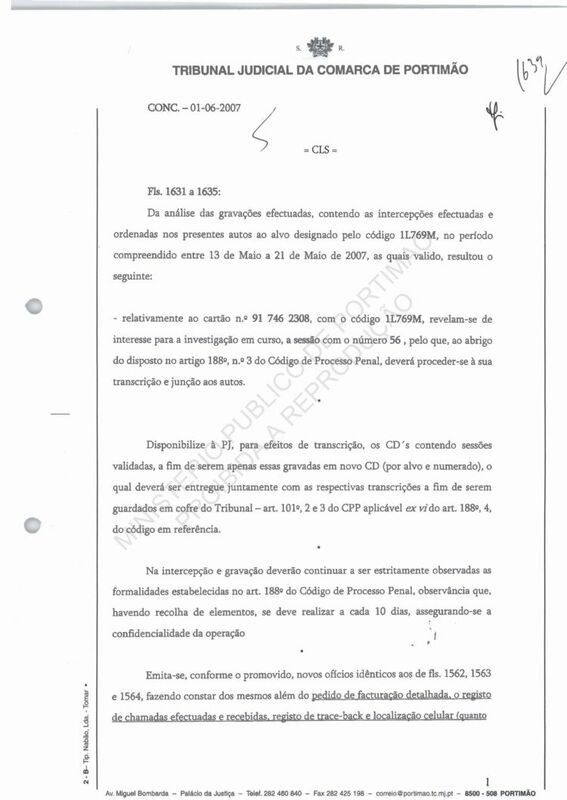 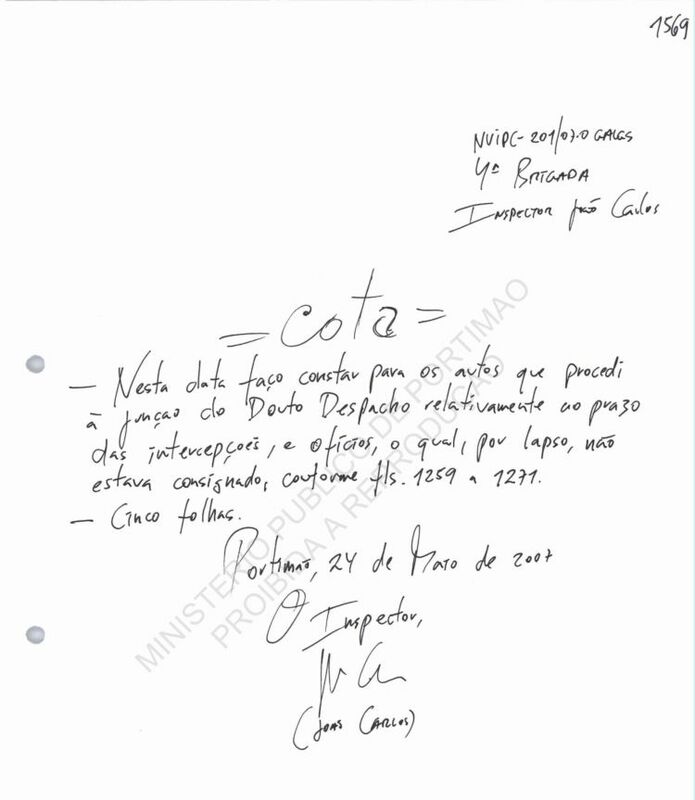 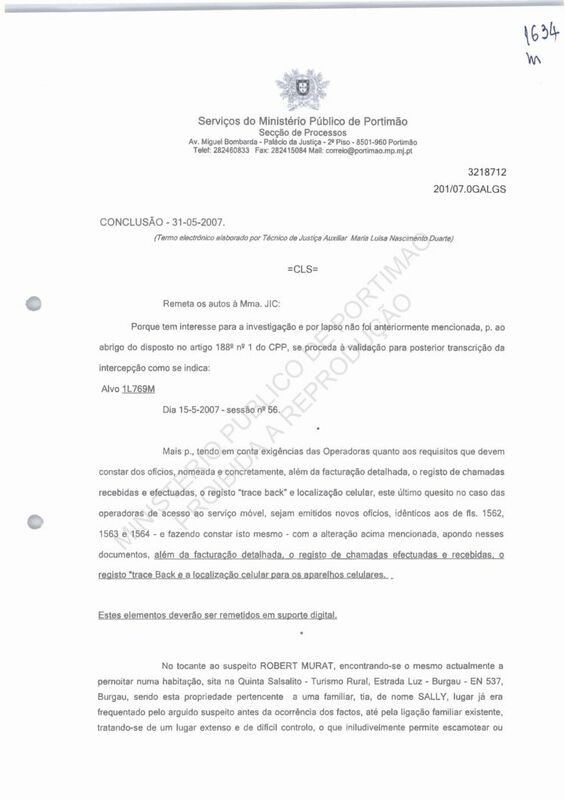 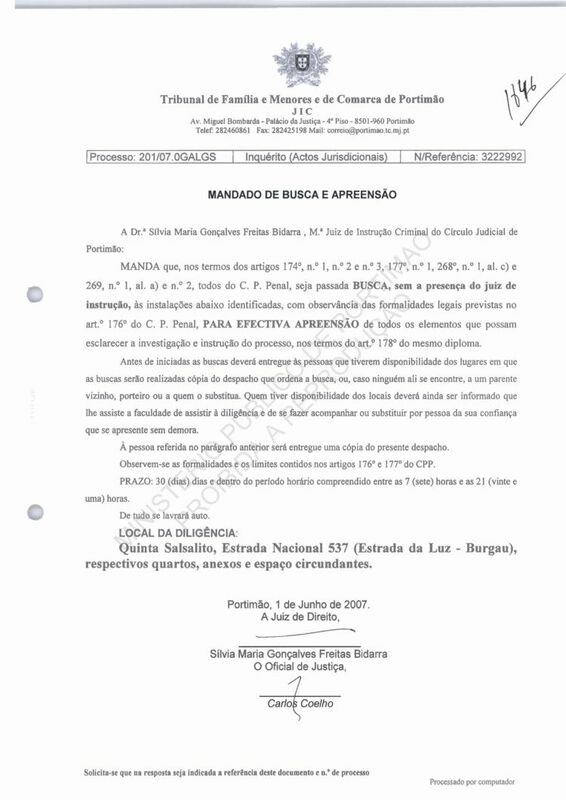 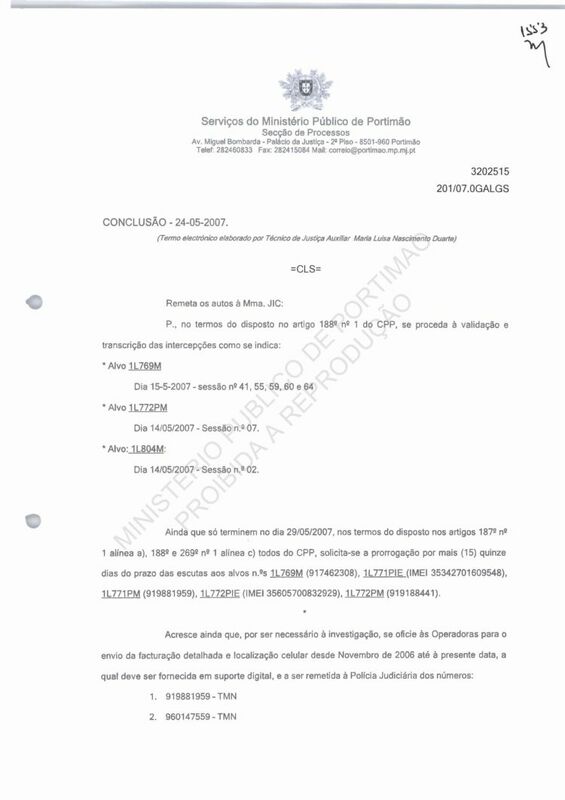 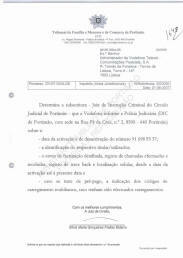 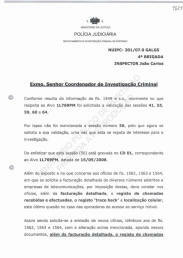 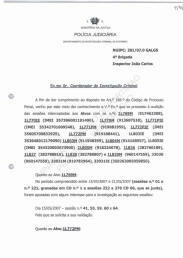 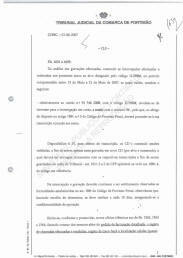 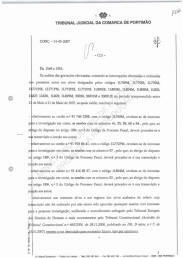 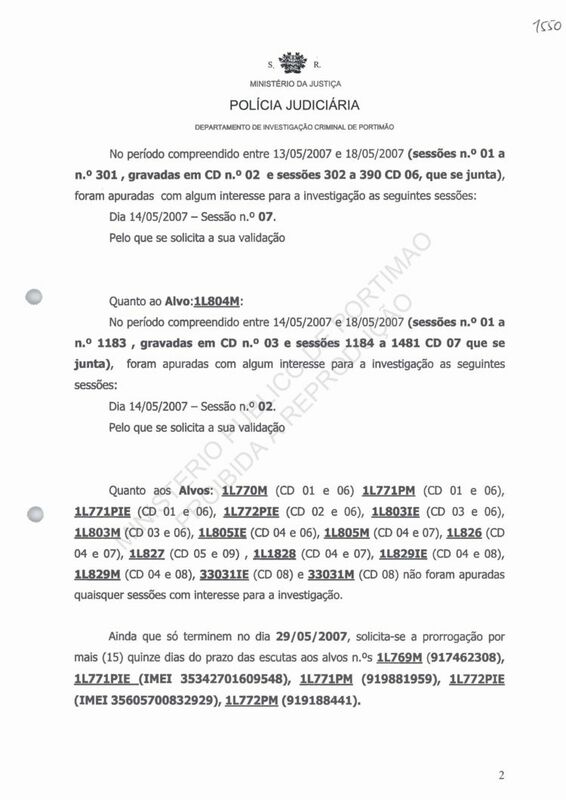 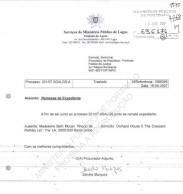 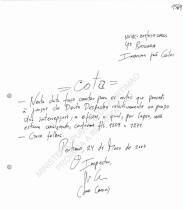 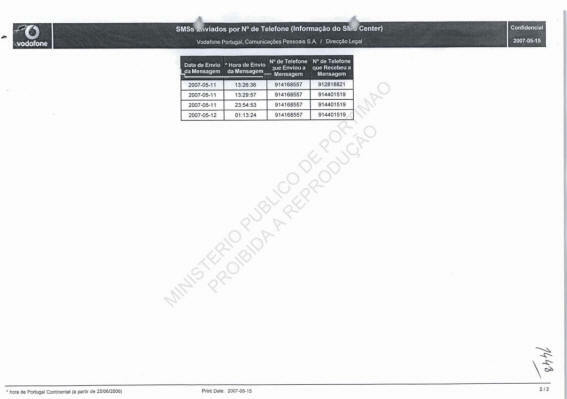 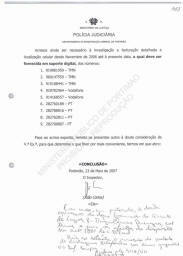 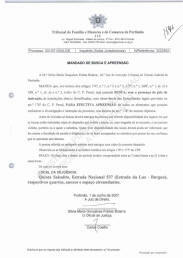 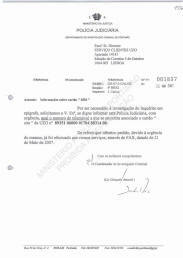 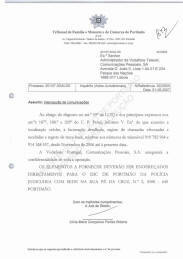 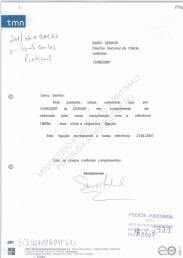 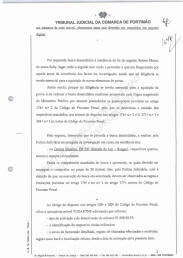 On 20th July 2007 the Policia Judiciaria – Portimao DIC and the PJ Telecommunications Services proceeded to cease the interception of the target with number 1L827 (282788816) in accordance with the legal dispatch contained in the investigation process files. 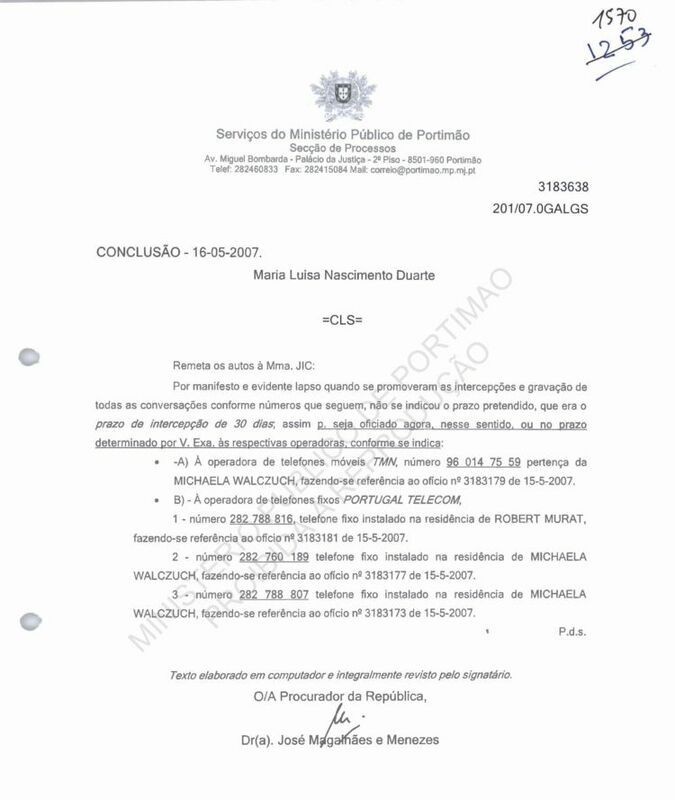 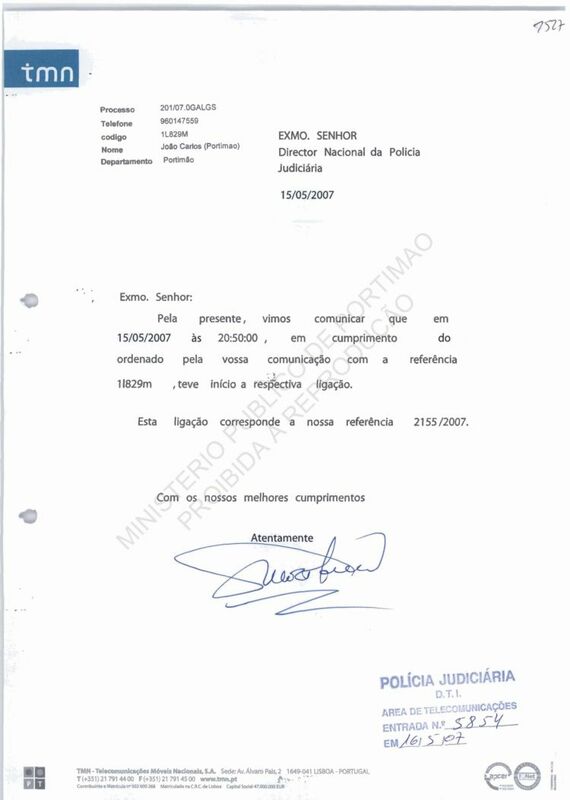 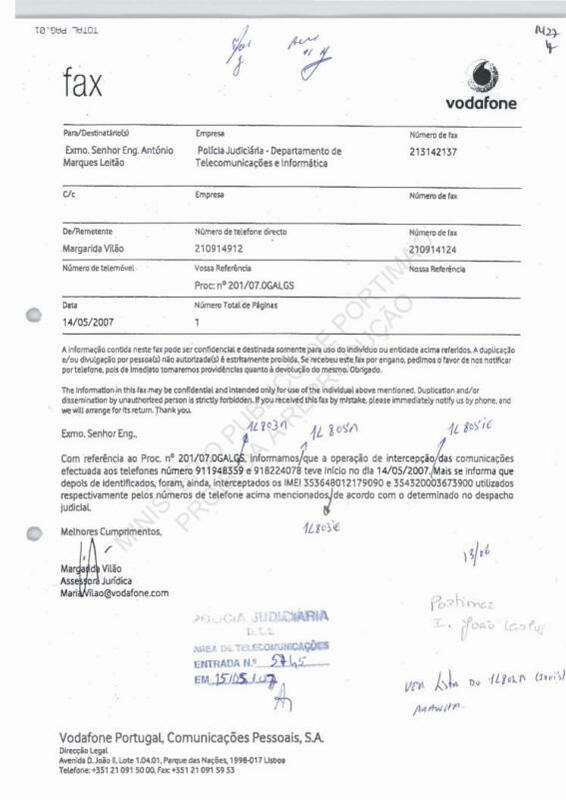 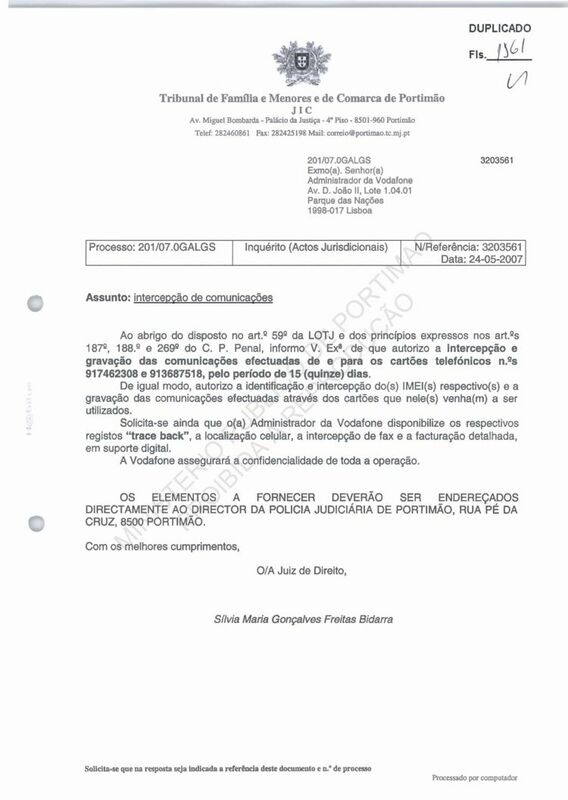 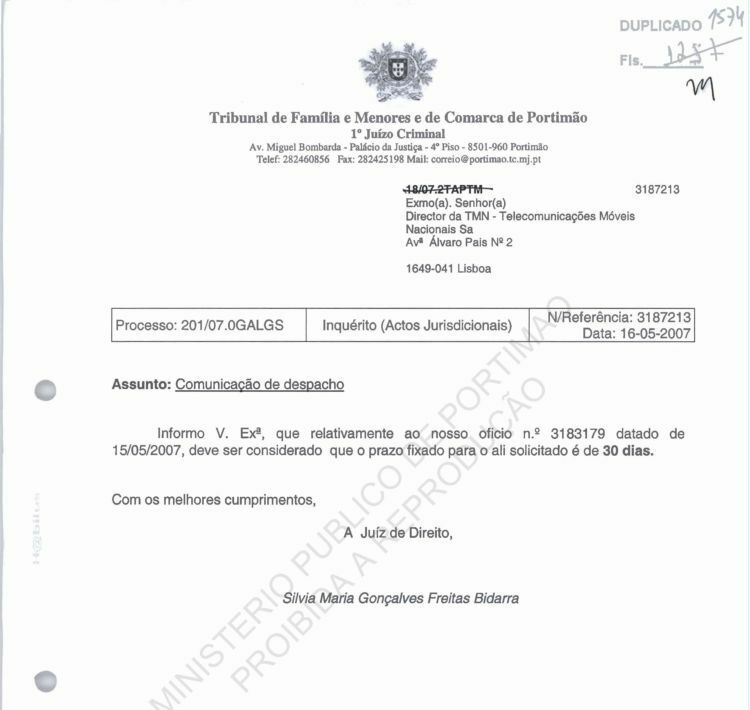 On 20th July 2007 the Policia Judiciaria – Portimao DIC and the PJ Telecommunications Services proceeded to cease the interception of the target with number 1L8291E (IMEI 35342701609548) in accordance with the legal dispatch contained in the investigation process files. 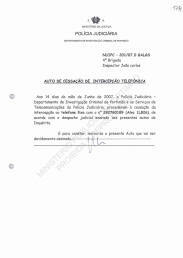 1986 - Stoppage of interception of telephone no. lL829M (*****). 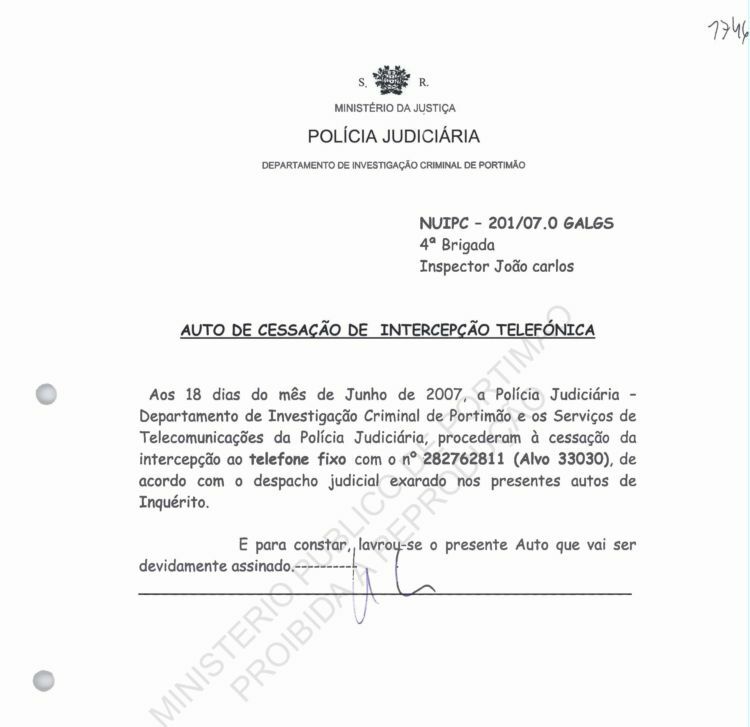 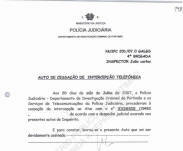 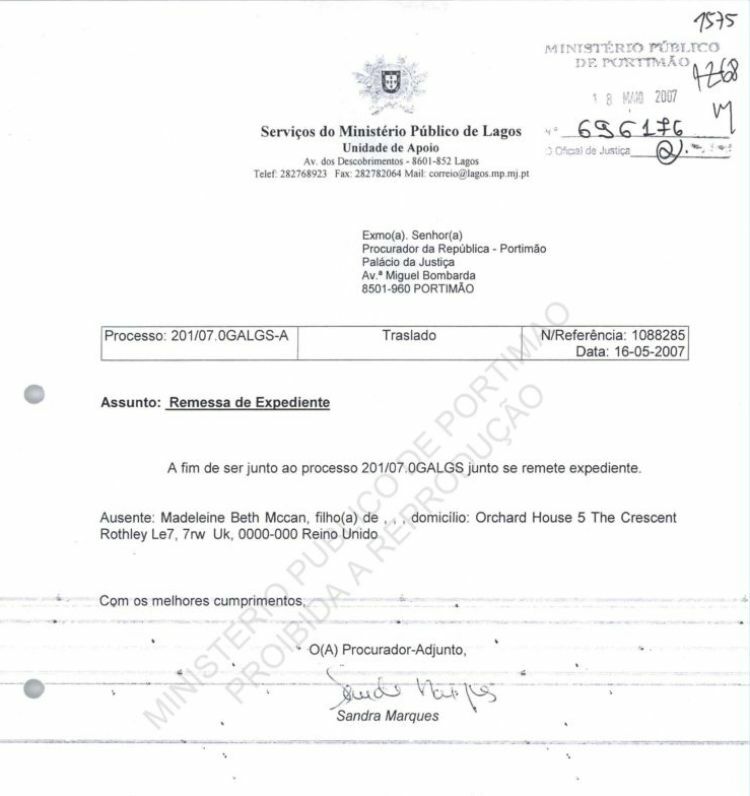 On 20th July 2007 the Policia Judiciaria – Portimao DIC and the PJ Telecommunications Services proceeded to cease the interception of the target with number 1L829M (960147559) in accordance with the legal dispatch contained in the investigation process files. 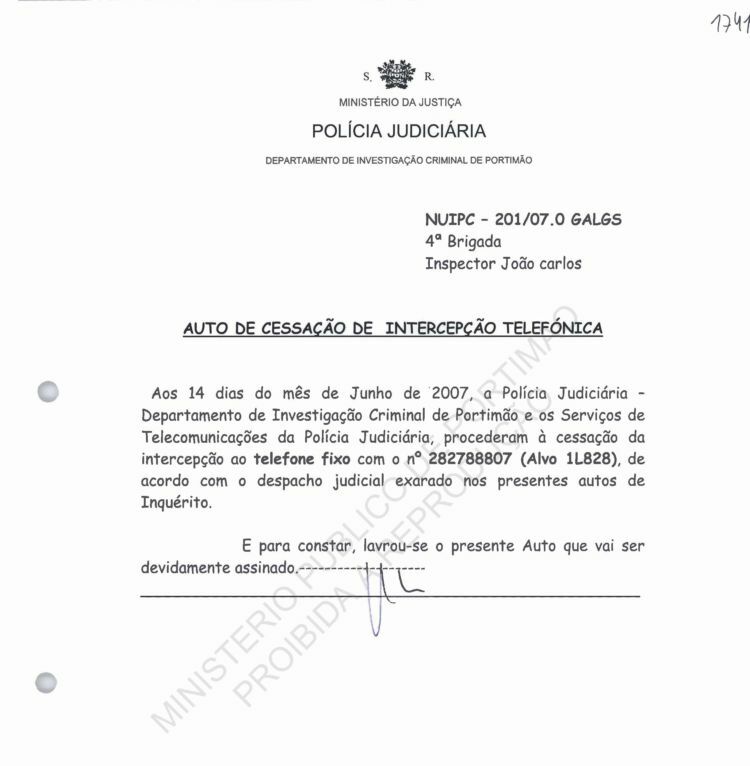 On 20th July 2007 the Policia Judiciaria – Portimao DIC and the PJ Telecommunications Services proceeded to cease the interception of the target with number 33651E (IMEI 35640401964109) in accordance with the legal dispatch contained in the investigation process files. 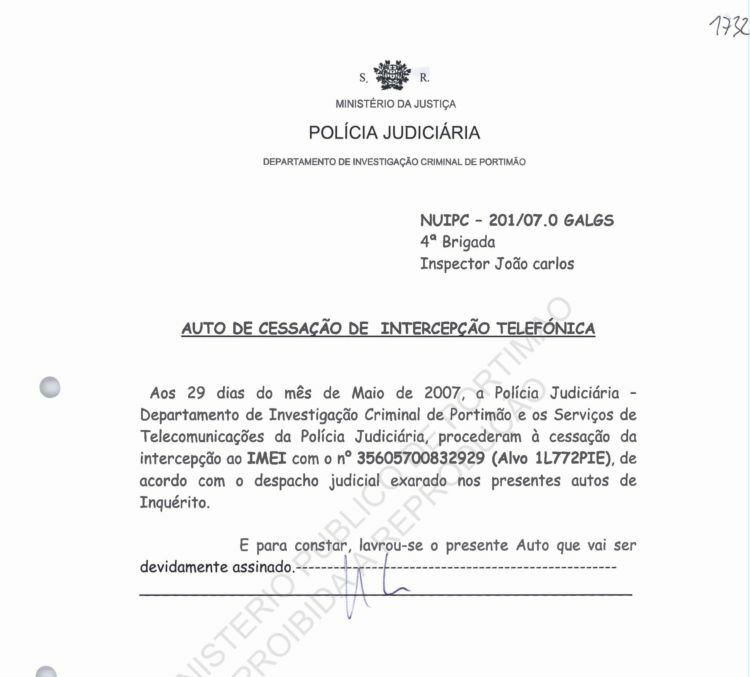 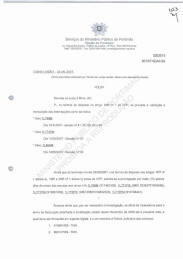 On 20th July 2007 the Policia Judiciaria – Portimao DIC and the PJ Telecommunications Services proceeded to cease the interception of the target with number 3365M (969515666) in accordance with the legal dispatch contained in the investigation process files. On 18th August 2007 the Policia Judiciaria – Portimao DIC and the PJ Telecommunications Services proceeded to cease the interception of the IMEI with number 35605700832929 in accordance with the legal dispatch contained in the investigation process files. 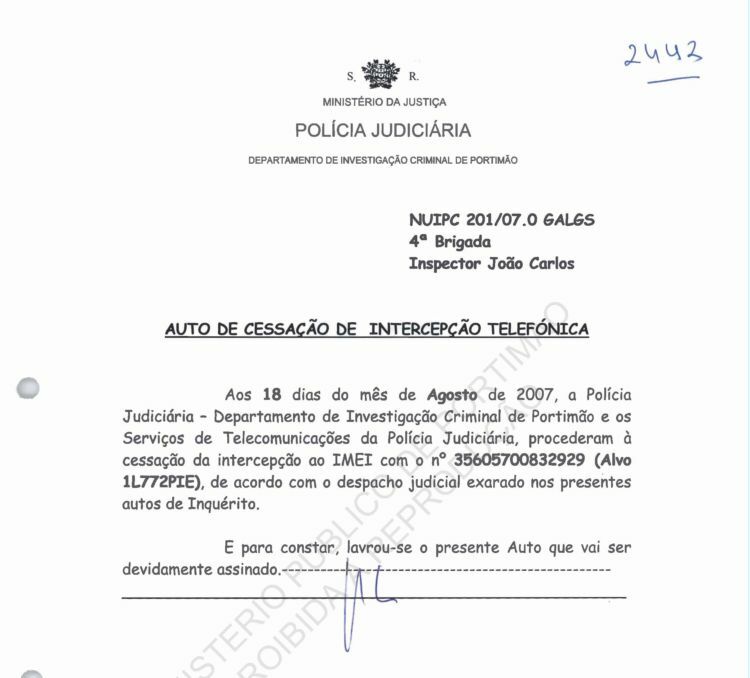 On 19th August 2007 the Policia Judiciaria Portimao DIC and the PJ Telecommunications Services proceeded to cease the interception of the telephone number 282788816 (target IL827) in accordance with the legal dispatch contained in the investigation process files. 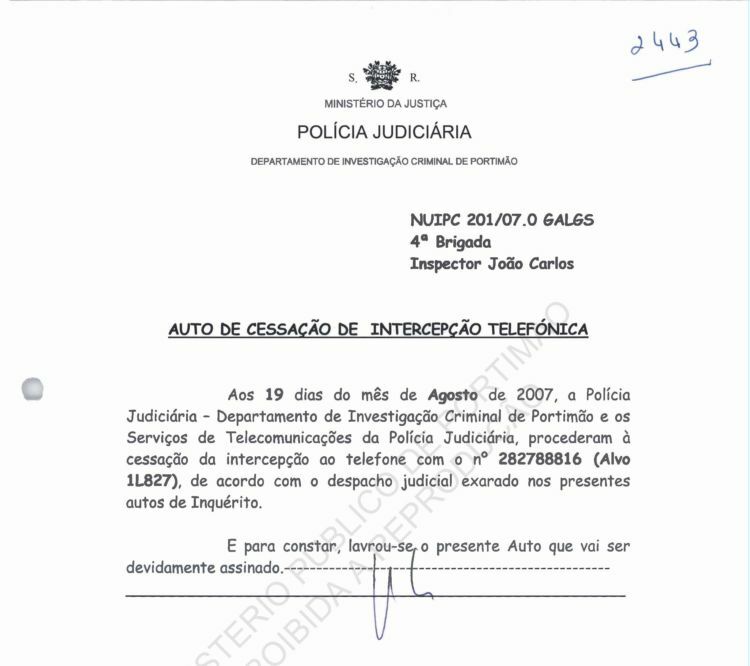 On 18th August 2007 the Policia Judiciaria Portimao DIC and the PJ Telecommunications Services proceeded to cease the interception of the mobile number 919188441 (target 33822M) in accordance with the legal dispatch contained in the investigation process files. 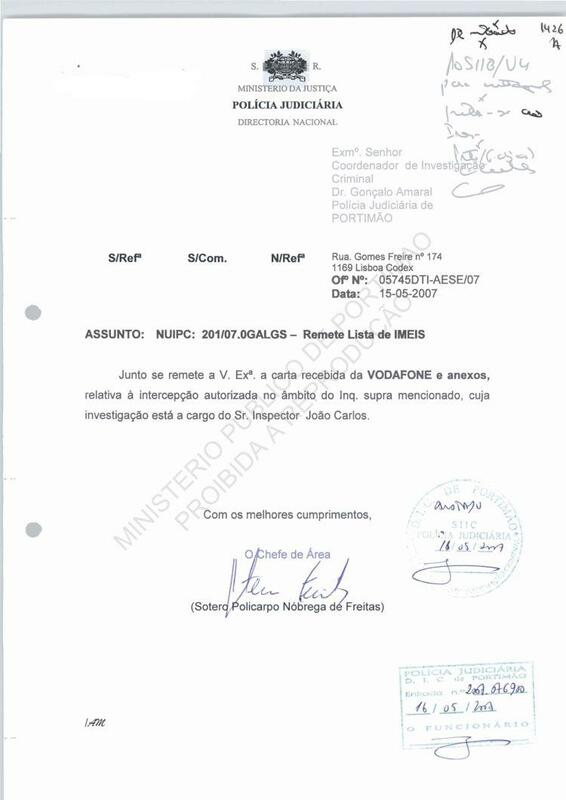 On 18th August 2007 the Policia Judiciaria Portimao DIC and the PJ Telecommunications Services proceeded to cease the interception of the IMEI with number 35605700832929 (target 33823E) in accordance with the legal dispatch contained in the investigation process files. 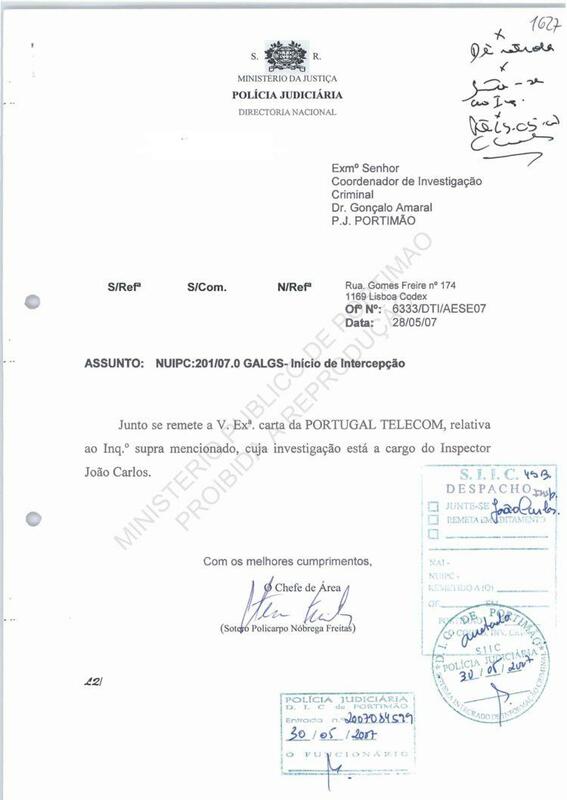 On 18th August 2007 the Policia Judiciaria Portimao DIC and the PJ Telecommunications Services proceeded to cease the interception of the IMEI with number 35605700832929 (target 33824E) in accordance with the legal dispatch contained in the investigation process files.